Our previous trip to Peru in 2013 was so enjoyable that we decided to go back and try something different; with another trip to Machu Picchu thrown in for good measure! 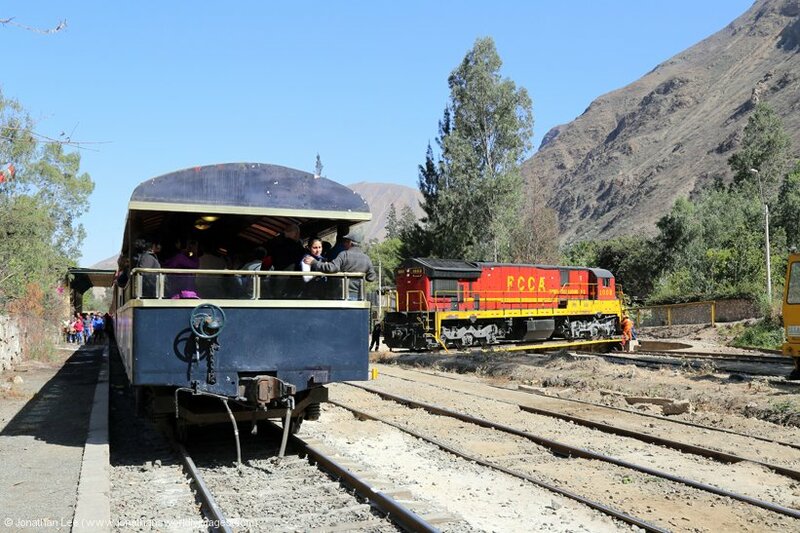 The basis of this trip was the dates that FCCA had advertised to run their Lima – Huancayo tourist trains and even more specifically the dates that the train stayed over for two days in Huancayo; which allows for an out and back trip from Huancayo to Huancavelica on the FCHH operated Train El Macho. Train plans in place at Lima, it would have been rude to ignore the Nazca Lines on our second trip so a day trip (which would be very long) was booked online with an add-on to the Ballestas Islands beforehand. After the trip to Huancayo and Huancavelica we’d head to Cusco and then to Ollantaytambo for a couple of nights; where we planned to head up to Machu Picchu twice. Lima – Tierra Viva Miraflores – 35 minutes from Lima airport (with no traffic) – The staff spoke fluent English and were very helpful. Our room was on the 7th floor and was very nice indeed. It was large, spotless, had a much needed heater and piping hot water, along with toiletries and a daily replenished bottled water supply. The bed was massive and there was a desk area, free WiFi and a flat-screen TV with plenty of channels with English language programs. There was also plenty of room for storage of clothes so as we were there for four nights it was absolutely ideal. 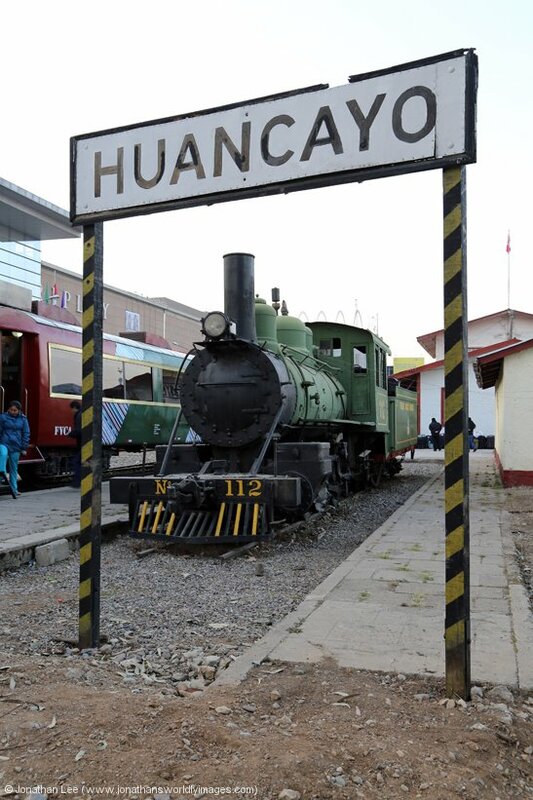 Huancayo – Hotel Presidente – Free transportation to certain hotels in Huancayo is provided at Huancayo off the FCCA train, this included to the Hotel Presidente where we were staying. We opted to walk though and ME Maps guided us to the hotel in about 10 minutes and yet despite being the first from the train to the reception we failed to be first to our room thanks to the hotel not having a record of our booking.com reservation! The result of which was us getting an upgrade to a VIP room as there weren’t any standard double rooms left; and a rather nice and spacious room it turned out to be. Breakfast, which we only had after our second night was plentiful and the staff were really nice. 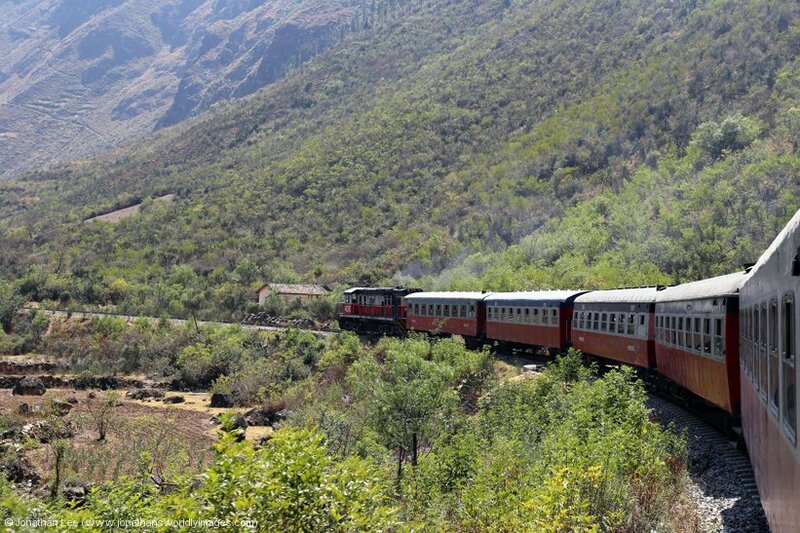 Huancavelica – Hotel Presidente – a 10-minute walk from Huancavelica railway station. I’d pre-booked on Booking.com and was in the Plaza de Armas at the end of town. There wasn’t a word of English spoken at the hotel at all and Google Translate played a big part of both our check-in process and discussions surrounding the cost of our room; which was more than even the dearest room on their hotel price list displayed in the reception. All I could get from the receptionist was gestures that seemed to give the impression that I should book direct with the hotel and not booking.com, yet when I produced them the two e-mails I’d originally sent requesting accommodation they just shrugged and didn’t seem to care. The room itself was large, with two king-size beds and a table to eat at, as well as a sofa to sit on and a balcony overlooking the street below. It was clean, had toiletries and hot water, along with a heater; that was needed later in the day. The bed was huge, comfy and had plenty of bedding to keep us warm when the temperatures plummeted at night. 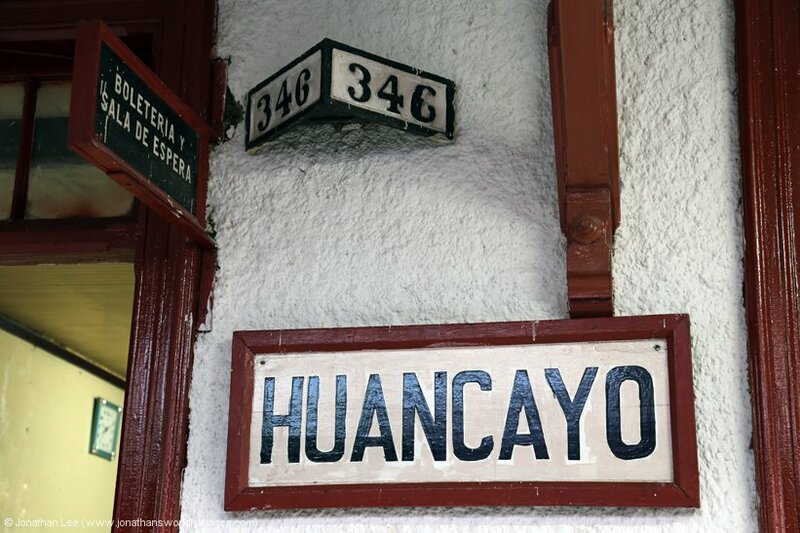 Even so and despite the issues during check-in the Presidente in Huancavelica is well overpriced, even compared to its sister hotel in Huancayo. 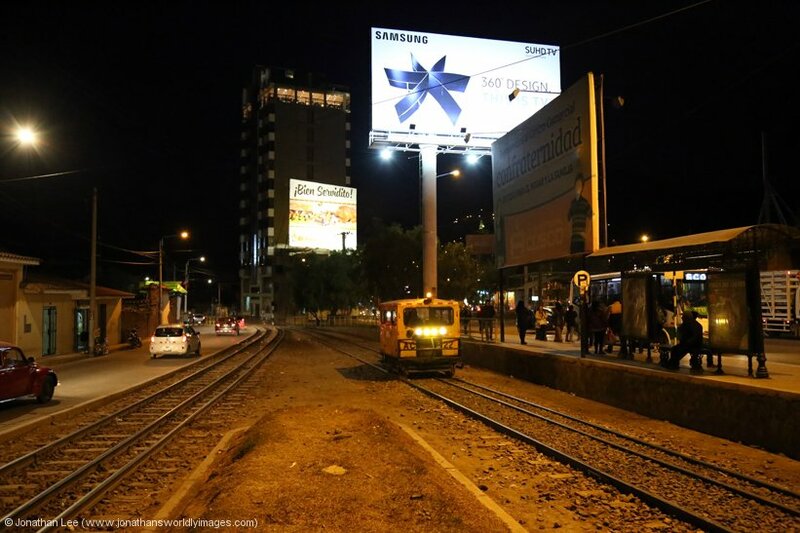 Lima – Hotel Inka Path – I’d chosen the Hotel Inka Path for its proximity to Desamparados station to save messing about and it was only a 10-minute walk to it. The Plaza de Armas and main streets off it were very busy, which included the pedestrianized waking area right outside the Inka Path. The room we’d been allocated was, as luck didn’t have it, right over this area and literally across the way from the reception desk but the hotel staff were quick to give us a quiet room at the rear of the hotel. The room wasn’t big and was quite cozy, it was decorated with an Inka style theme and was a bit dusty round the edges but sufficed for the one night and would have done for more if we’d needed it. Staff were more than helpful and sorted out everything we asked of them, including booking a taxi for our morning departure. Cusco – Tierra Viva Cusco Centro – At check-in the staff couldn’t have been more helpful at the Tierra Viva Cusco Centro and it was very relaxing with tea etc being available while we waited for our documents to be processed. The room we were given was small and compact but of the high standard we’d come to expect from Tierra Viva hotels. It had all the mod-cons, toiletries and free WiFi and hot drinks were always available from reception. The hotel staff were more than happy to sort us transfers to Poroy and the airport; transfer from the airport had been complimentary but everything else came at a cost. 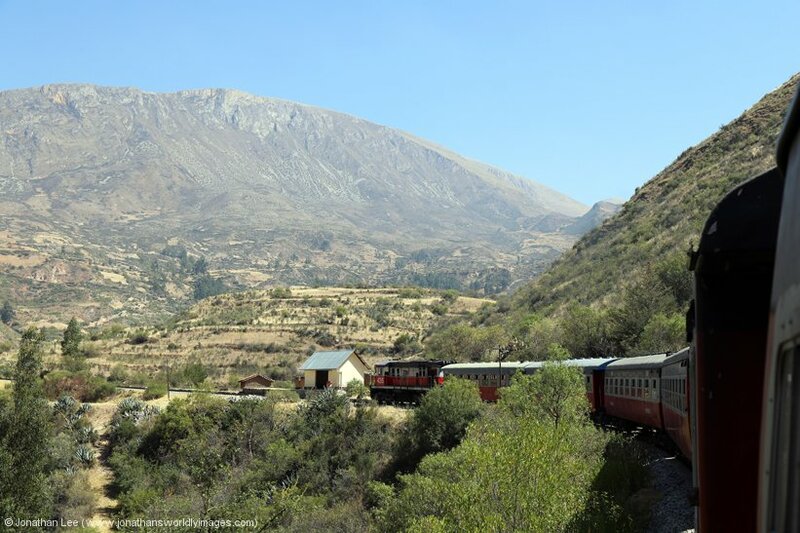 Ollantaytambo – El Albergue Hotel – this place is a cracking place to stay and is very convenient for the trains to Machu Picchu with it being located on the station premises of Ollantaytambo station itself! The room we had was spacious, kept clean and tidy by the maid, had hot water, heater and free bottled water which was replaced every day. Having stayed at the El Albergue on our previous visit we expected more from it but left feeling a little let down by the fact that the hotel’s restaurant area and seating area out the back were just a free-for-all for people using the early morning trains. This resulted in hotel guests not actually having space to move and even sit in the restaurant for breakfast. This was brought up with the hotel and we were assured the matter would be addressed. Other than that though the hotel staff were great, the location is fantastic and the food in the restaurant is also good. Booked online using the FCCA website but note it seems that only return tickets can be purchased online for certain departure dates; otherwise single tickets can be bought by contacting FCCA via e-mail. 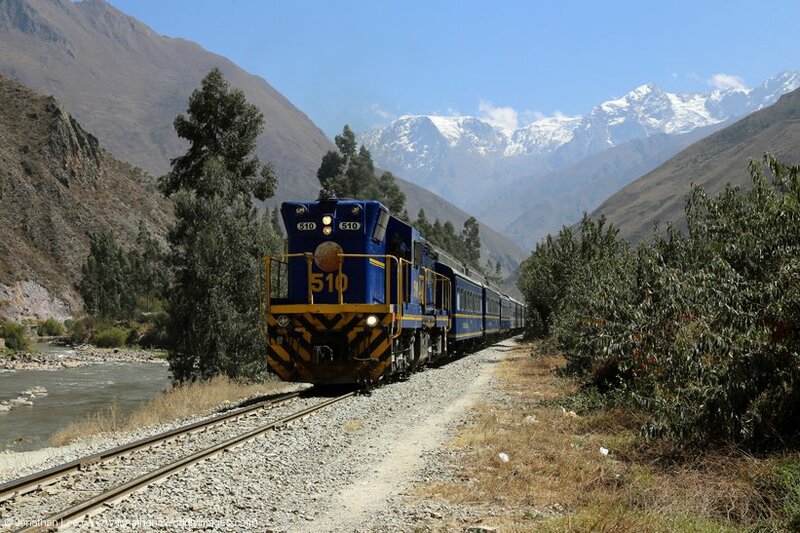 All train tickets were booked online through the Peru Rail website. PDF tickets can then be downloaded and printed before your trip. 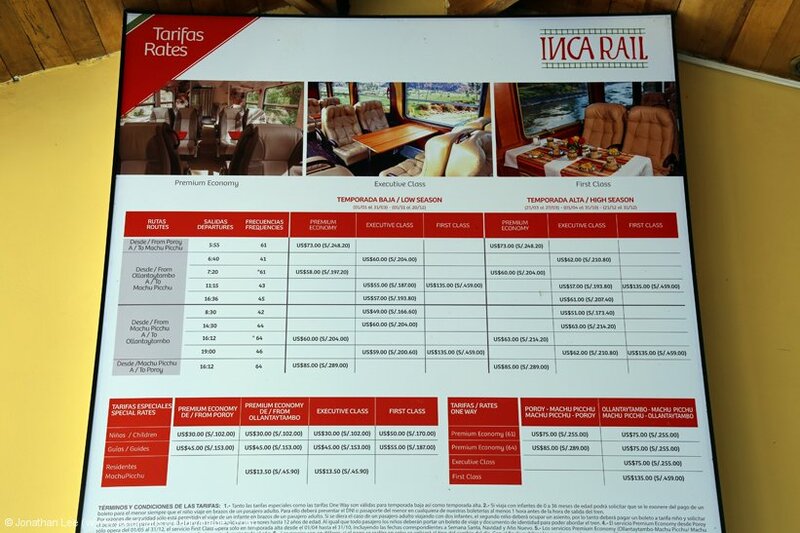 Ticket prices for the Machu Picchu trains differ based on their train type (Expedition or Vistadome) and the time of day the train runs; these do not increase as the trains fill, or the booking date gets closer. The price for that train is the price for that train. After finishing my last night at work for two weeks I should have been looking forward to a bit of sleep before finishing my packing and heading off to London in the afternoon on the 1436 train. Unfortunately, or fortunately, 31233 put pay to the going to bed idea after it had been advertised to attend the Midland Railway Centre Diesel Gala. A quick drive home after having 91122 back from Peterborough to Doncaster, had me basically dropping my bag, picking up my camera, and Pelham, then hammering it to Butterley for the first train of the day; where the car park was already wedged and people were queuing down the driveway for tickets! As Pelham had to be on the 1310 from Doncaster to Yok for work and I had to be technically on the 1436 from Doncaster to Kings Cross, there wasn’t much leeway if things started to run late. Our plan, after doing 31162/31233 on their first full round trip of the day, was to do 141113 up the hill from Swanwick to Butterley on the 1145 departure; unfortunately, as 31162/31233 arrived in at 1144 we watched 141113 disappear off to Butterley as we did! That meant a walk up the rather overgrown footpath from Swanwick to Butterley to speed up our getting home as none of the Hammersmith bound trains stopped at Butterley. Rather annoyingly the traffic came to a grinding halt as we joined the A1, just 3 miles from home, which left Pelham only 19 minutes to get to Doncaster for his train to work. While I had over 90 minutes to make my booked train, I’d had the sense to get a man in the know to make reservations on the 1455 & 1512 departures from Doncaster to London while travelling home from work; which actually turned out to be a bonus when the 1436 manufactured itself into a HST and the 1512 departure ended up being electric instead. Virgin Trains East Coast’s current offer, allowing Doncaster to Kings Cross & vice versa tickets to be used up to an hour either side of their booked train, ended the following day so it was a big bonus as we set off to London on the 1455 from Doncaster, with a seat reserved as well; 91122 did the honours, having been Doncaster to Edinburgh and back while I’d driven round like an idiot, then finished packing, etc, etc! At Kings Cross we walked over to St Pancras and were on the 1710 departure to Gatwick Airport, grateful of the fact I’d already booked the tickets online before we got there. On arrival at Gatwick it took us a while to figure out where the buses for the surrounding hotels depart from but once we found them, we soon found stop 9; where the buses to the Ibis Gatwick went from. There’s a departure poster behind the stops that tells you which bus serves which hotels and then there’s a departure time listing for them all; the one for the Ibis Gatwick is i8 and it only runs inbound to the station in the morning, up to 1030 and outbound from the station after 1700. Each journey costs £3 and it took about 20 minutes to be delivered to the front door. I’d already checked in online and it was a simple case of picking up our room key on arrival; which we were in literally 2 minutes after walking through the door. With a 1310 flight from Gatwick North Terminal there wasn’t a need to be up mega early so after a leisurely breakfast we boarded the 1000 shuttle, which we’d pre-booked the night before, to the North Terminal. There were no hassles as we entered the airport, breezed through security and made our way to our gate; having already checked in on the British Airways App for BA2239 1310 Gatwick – Lima the previous afternoon. This particular route was a newly introduced flight for BA; so new that their on-board flight entertainment system hadn’t been updated with the flight details so all we had to go on was the flight time we’d been given by the pilot before take-off! It was a hassle-free 12-hour flight with plenty of entertainment on board. The food was good; and unlike our previous trip to Peru with Iberia, we were served three decent meals and not just one in 12 hours! Arrival into Lima was prompt, at 1945 Peru time and getting through immigration took moments. Money changers are plentiful and the going rate was 3.8 Soles to the £1. Unfortunately, when we walked out of the airport the sign I was expecting to see, with my name on it, was nowhere to be seen. I’d arranged a pick-up through the hotel we were staying at and having scouted the airport four times for the hotel’s pick-up driver we ended up at the help desk in arrivals; where the kind girl attempted to contact the hotel for us to find out where the driver was. Both attempts to make contact proved fruitless and there was no answer so our only option appeared to be to get our own taxi and we made our way back into the security side of the airport; basically by going back through the main doors! There are a couple of taxi companies offering pre-paid fares to Lima and we expected to pay about 60 Soles, which was about what we had been quoted by the hotel directly. While we stood in the queue to get our taxi the doors to the airport’s arrivals and exit happened to open and bugger me if there wasn’t a man standing right in our line of sight with a sign held above his head; which had my name on it! Moments later we were marched outside and to our waiting car, apparently the traffic had been terrible getting to the airport but the journey to the Hotel Tierra Viva Miraflores only took about 35 minutes and would have probably been a nice journey as we took the coastal route from the airport to the Miraflores district of Lima. Upon arrival I paid the driver 70 Soles directly as I didn’t have US Dollars. The guys at the front desk for very helpful and had us checked in quickly. Our room was on the 7th floor and was very nice indeed. It was large, spotless, had a much needed heater and piping hot water, along with toiletries and a daily replenished bottled water supply. The bed was massive and there was a desk area, free WiFi and a flat-screen TV with plenty of channels with English language programs. There was also plenty of room for storage of clothes so as we were there for four nights it was absolutely ideal. Having had a long day there was no setting of an alarm when we went to bed; at effectively 0400 to our body clocks, which were technically still on UK time. No trains at all, the only hit of which was a brief attempt to get inside Los Desamparados station to collect our FCCA train tickets but this failed at the main entrance due to the whole station area being closed off for the day. Again no trains at all and not even a hint/glimpse of one. It was a very long day out to include the Nazca Lines! 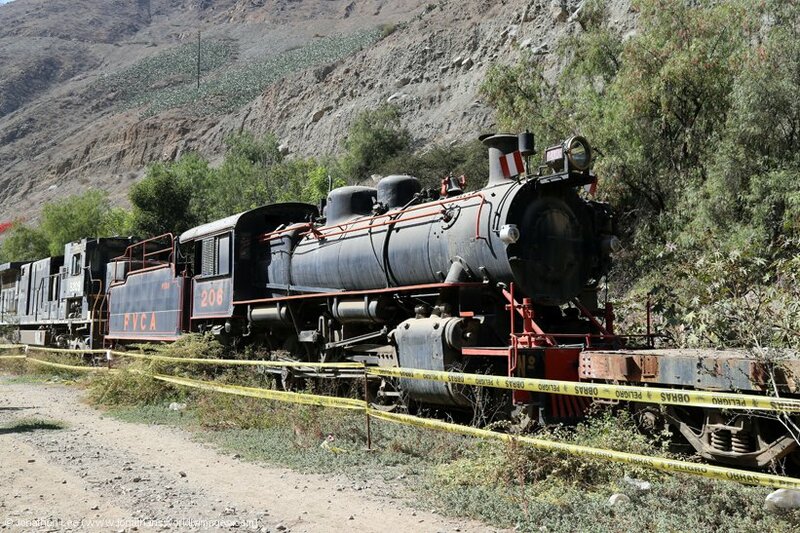 At least we managed to get inside Los Desamparados station on this attempt but collecting tickets wasn’t on the agenda, mainly as there’s nowhere to collect them. The station area is now used as a library and student type social area with part of it being a museum. Its well worth taking a quick walk around, just for the olde worlde feel if nothing else. 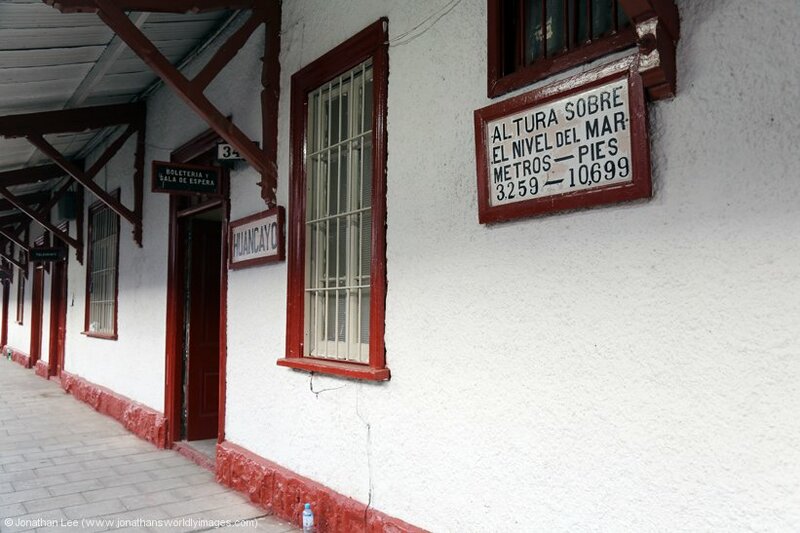 We’d pre-booked a taxi to take us from the hotel to Lima Los Desamparados station at 0600. It turned out to be the same guy that had picked us up from the airport and it also seemed that he could name his price as it was Independence Day in Peru and the usual 20 Soles fare turned into a 45 soles fare! We’d toyed with using the Metropolitano to get to town but didn’t want to risk it but there were plenty about as we headed to town; strangely, while not paying attention our driver almost ended up in the Metropolitano bus lane, having mounted the curb to it! The driver had told us he’d have to drop us a couple of blocks from Los Desamparados due to road closures for Independence Day, he was very wrong though and we ended up having to drive all the way around the back of Los Desamparados, on the other side of the railway, and we eventually had to be dropped at a road block to walk about half a mile to the station. The staff at which initially wanted to search our bags, until someone with sense basically told him to let us go! People were walking from all directions when we eventually got into the queue for entry to the station; all suffering the same fate due to the road blockages. When the train arrived people were then allowed into the station area, with tickets having to be shown to access through the main gates. At the bottom of the ramp to the platform area there was a security check with bags and body screening; this could have been just as it was Independence Day though? Once that was over entry to the platform is almost upon you but first you’re told whether your bags are to go in the luggage van or not and they’re tagged if they are. Despite tickets having coach numbers and allocated seating none of the coaches display a coach number at all so we had to ask where coach 4 was! 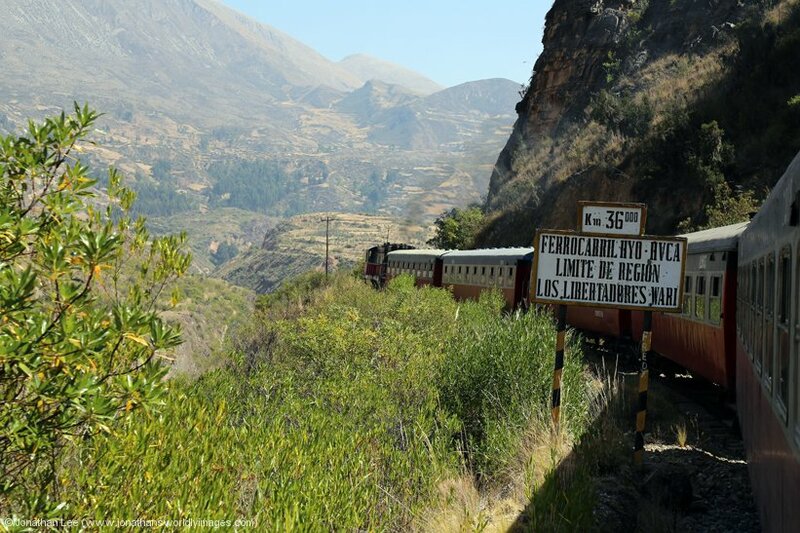 It turned out that it was insensibly 4th from the luggage van, which was towards the middle of the train so we were 2nd coach from the front on departure from Lima. 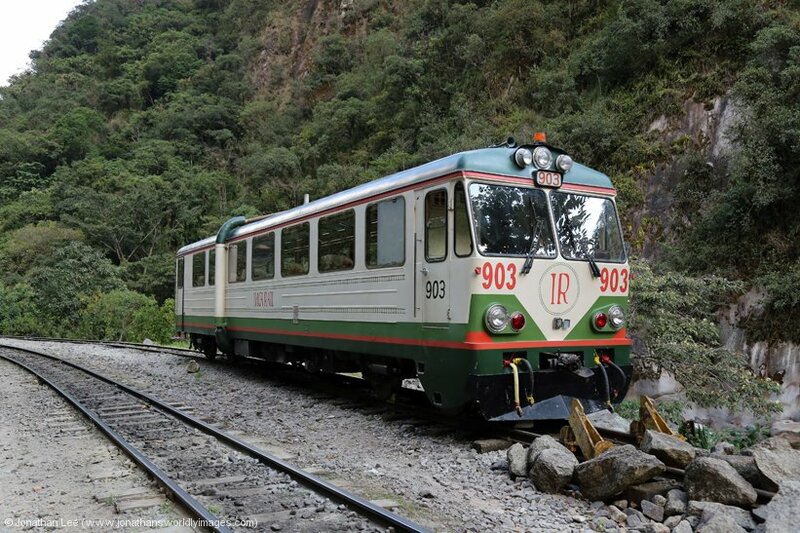 The train was formed of 9 coaches in total, with Ferocarril Central Andino (FCCA) GE C30-7 #1008 leading the bar car, 4 turistico coaches, the luggage van and 3 classico coaches. Inside our air-conditioned, well sort of air-conditioned, turistico coach we found the train to be mainly loaded with local as opposed to western tourists. There was very little room to store bags and we ended up with ours stuck out from beneath our seats for the whole journey, leaving us with zero legroom as a result. The seats were permanently reclined and wouldn’t go upright at all and the tray tables for them were a do it yourself kind of thing that were tucked into the mesh in the seat in front and had to be set up when required! Upon departure, which was at 0730 and not 0700 as it should have been, it soon became evident that the staff on board, including our coach attendant and the bar car staff, didn’t speak a word of English and all but one announcement was made in Spanish only. At least the announcement advised us that we’d have stops at San Bartolome & Matucana en-route to Galera Summit at 4781m above sea level. 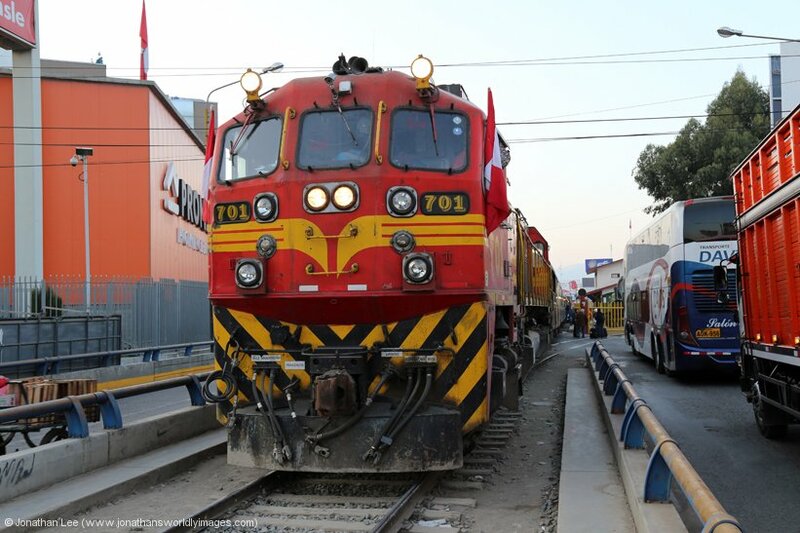 Of course I was straight to the veranda car as FCCA GE C30-7 #1008 rolled out of town and immediately started to climb away from the Lima suburbs. It was a cold morning but free cups of hot coffee helped take the chill away. The big FCCA GE wasn’t given a great deal as it headed away from town but it did sound meaty all the same. Just out of town breakfast was served at our seats, which consisted of a cheese/ham sandwich, fruit, cake and a carton of orange juice, followed by a choice of coffee or Mate de Coca. We were also given a voucher each to exchange at the bar for a Pisco Sour; I only ended up using one as it is exactly as its title suggests, sour! Shortly after breakfast the attendant came around and handed out proper train tickets, in exchange for a printed internet reservation; which makes a mockery of their internet booking system really if the reservation has to be exchanged on board. Judging by the amount of tickets being handed out, to pretty much everyone, it seems that there really is nowhere to exchange your reservation for the ticket before departure. After departure from San Bartolome the line really begins to climb and having done a big loop out of the station we found ourselves heading in the same direction we’d arrived into San Bartolome in; just a lot higher up the valley side and looking down on the station as we began to skirt around the edges of the valley offering excellent pictures of the train twisting and turning up front. The surrounding land started to become more barren and we seemed to leave anything green down below as we left San Bartolome. Needless to say I spent most of the time in the veranda car, now at the rear of the train, admiring the scenery. 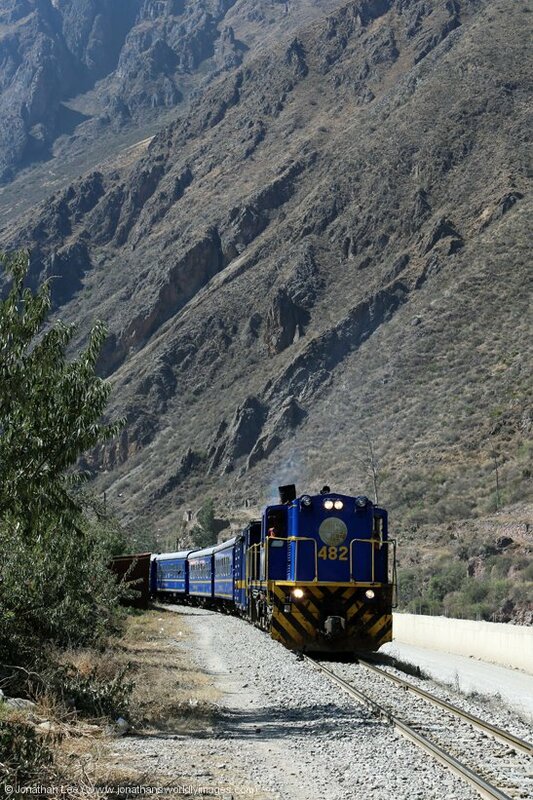 One of the highlights of the journey is the Puente Carrion at Km84, which is at least visible as the train curves onto it; unlike the more famous Puente Infiernillo at Km129 at 3300m which if you blink you’ll miss as the train runs over it on the straight! At Matucana (Km100) there is a 20-minute stop. During our stop GE #1008 was removed and replaced by classmate GE C30-7 #1009. A walk onto the footbridge revealed GE C39-8’s #1014, #1027 & #1029 on the shed, which were soon joined by #1008. 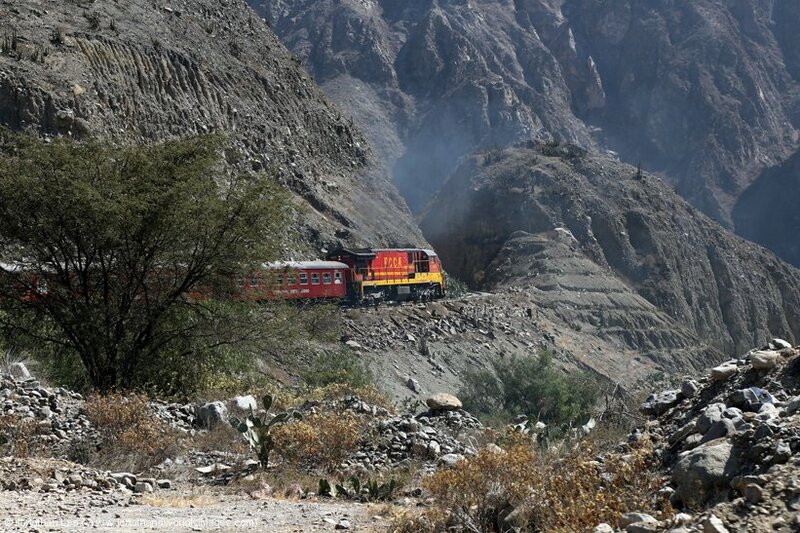 The valley sides seemed to get steeper as we headed away from Matucana and at Tambo de Viso we overtook GE C39-8 #1028 with a freight, which followed right behind us and could not only be heard climbing the Tambo de Viso Zig-Zag (Km111) down below but we could see it arrive at one end and start propelling its train up it as we exited it at the top. Then at San Mateo (Km125) GE C39-8 #1030, in a blue livery and not the FCCA standard red, was waiting for us to run by with another freight. Randomly as we approached Puente Infiernillo at Km129 at 3300m we were called for lunch to be served, as previously mentioned though there’s nothing to see while running over it but there is a decent view of it after the line curves around the valley side. Surprisingly dinner turned up hot but didn’t fit very well on the crappy DIY at seat tray. I was actually quite pleased with the carrot & beans in vinegar, chicken/onions & rice and mousse for after’s, unfortunately the young lad in the seat over the aisle from me didn’t look too pleased with it. It turned out that he’d been on oxygen while I was in the veranda car and had managed to throw up twice, in between my trips back to have a sit down; all over himself and his mother! Thankfully his mother seemed to have saved my empty seat and bag from getting covered when she realised he was going to chuck up and directed his head towards her, bless her! I even managed to miss his third time of throwing up after dinner! After dinner we passed GE C30-7 #1010 at Casapalca (Km154) and then it was the home straight, albeit far from straight, to Galera Summit. The air was definitely thinner and the scenery was ever changing from looking like we could be on the moon to looking like we could be in the Lake District in the UK but the snow-capped mountains soon gave the game away and it cooled down quite a bit. 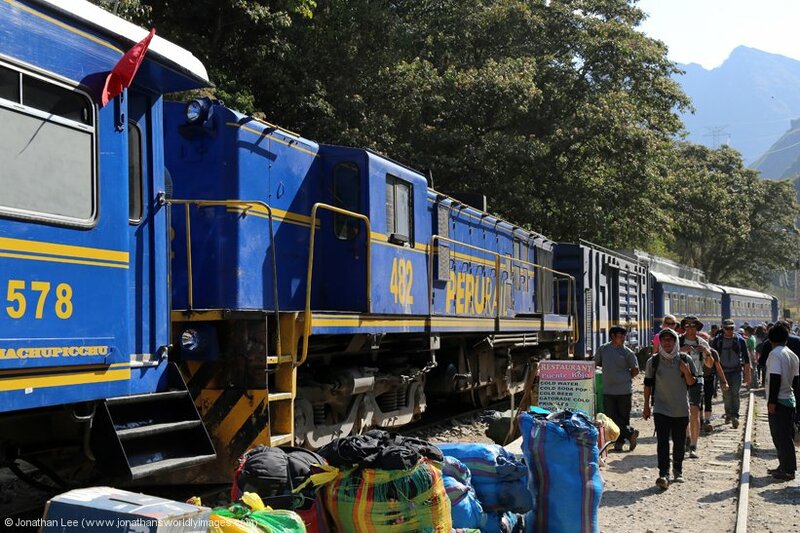 Unfortunately, GE #1009 began to struggle at round about Km166, 5km from Galera, and it eventually shut down after coughing and spluttering a bit as the train slowed. After about 20 minutes it coughed back into life and managed to get the train moving again but not without a bit of a performance that involved black clag and flames coming out of the exhaust port! Needless to say it didn’t get far and on the approach to Galera Tunnel it gave up the ghost completely; so close, yet so far at just 3km from Galera Summit. 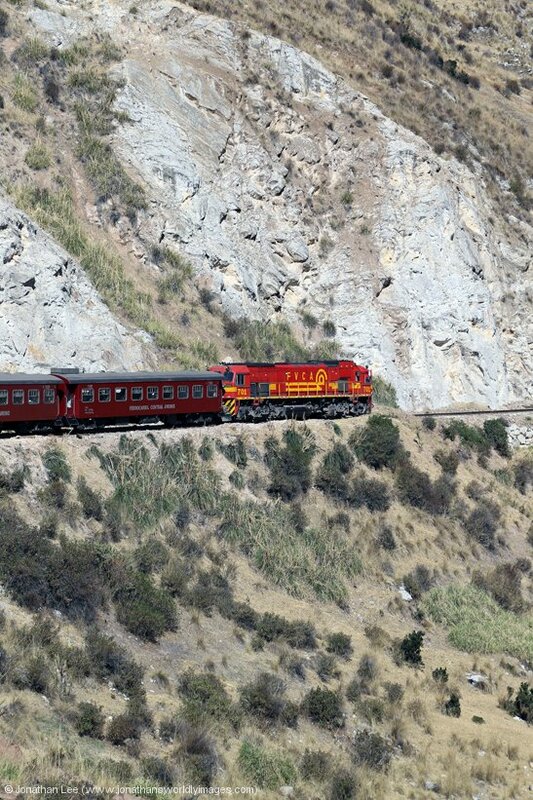 Having seen recent reports of it taking an age to get rescued on the FCCA I was surprised to feel a bump, as something attached to the front of the train, after we’d only been stood for about 10 minutes. 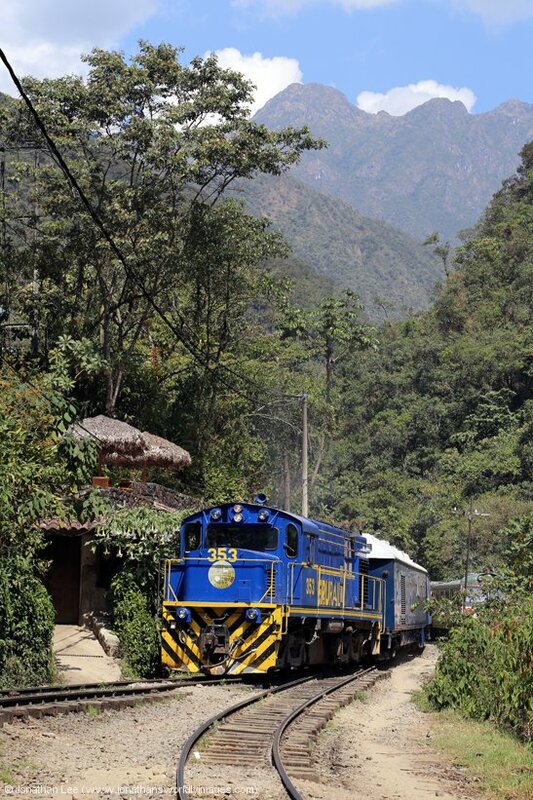 GE’s #1020/1019 came to the rescue for the short journey through the long tunnel to Galera Summit at 4781m; which must have already been summoned after our initial grinding to a halt? Unfortunately, it was hard to see what was going on at the Summit due to the number of wagons surrounding the train and generally cluttering up the yard area but 1020/1019 were removed and 1009 was started up again, I assumed it was going to be allowed to continue now it was all downhill but it only drew the train forward. While I was photographing the scenery at the summit it was only the clag pouring out of GE C30-7 #1003 as it sauntered into view that drew my attention to it. 1009 was soon removed and 1003 was dropped straight on and away we went. Never before had an engine failure been recovered so efficiently and from 2nd shut-down to departing Galera was only about 20 minutes in total, so things must have been in motion to rescue us from the initial shut-down when we’d stood for 20 minutes. Thankfully we weren’t too far from somewhere with locos to come and get us. As they say “it’s all downhill from here” and it literally is from Galera to Huancayo. 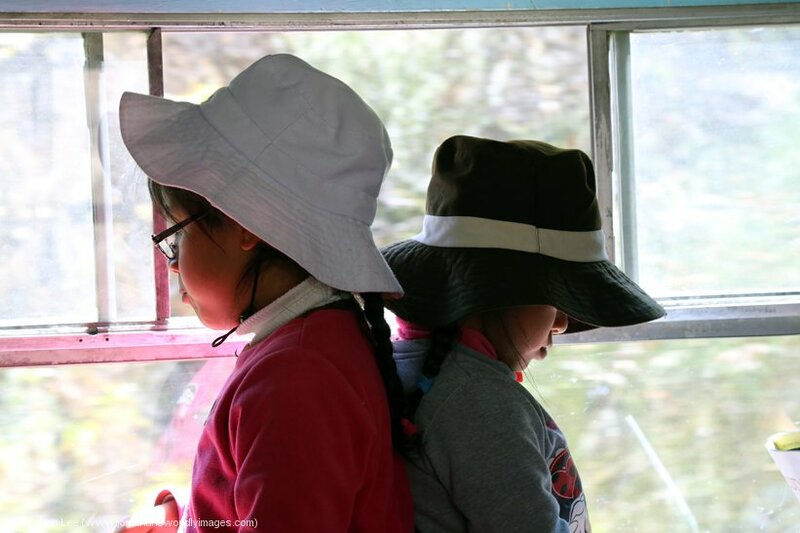 As we headed downhill from the top of the world, from what was once the world’s highest railway until recently, the scenery began to change, the sun soon began to cast shadows and the temperature began to drop. At La Oroya we stopped briefly outside the station, right across the level crossing, blocking the main road and as we drew in some minutes later FCCA demic #8588 came into view and the reason for the brief stop was soon revealed as GE #1003 was visible on shed, having been removed from the train. Investigation revealed that EMD JT26CW-2B #701 had taken over proceedings but there seemed to be no urgency in getting the train away and it was dusk when we departed some 30 minutes after arriving; which caused more delay than the failure had done earlier! Just when everything seemed to be going smoothly and I was enjoying my longest period of sitting down, did the sister of Mr Chunder decide it was her turn to have a go and she threw up all over her coat and seat, which was nice. By this point the mother of the chunderers was more prepared, with plastic bags, but she just wasn’t quick enough…..
An evening snack was served up shortly afterwards, which was a measly triple-deck sarnie and a can of Sprite. 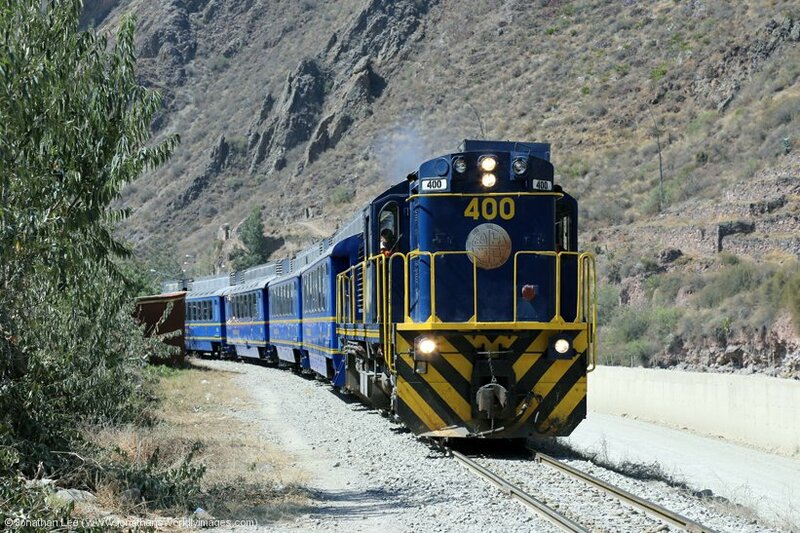 The run from La Oroya to Huancayo was a good one, with no stops at all until 130m outside the station, where we sat for 20 minutes blocking the main level crossing through town. All the queuing vehicles eventually reversed out of the way, some in a more orderly fashion than others. When we eventually drew into the station it was evident that we’d stopped to allow those at the front to de-train first and the baggage to be offloaded. Meanwhile it was a farce getting off as everyone in the next coach was already de-training so I took it upon myself to unlock and open the door and off we got at 21:20, just the 14h20 minutes after boarding, having travelled 332km, climbing to 4781m at the highest point and then descending to 3261m at Huancayo and having had no less than 6 different locos on the train. 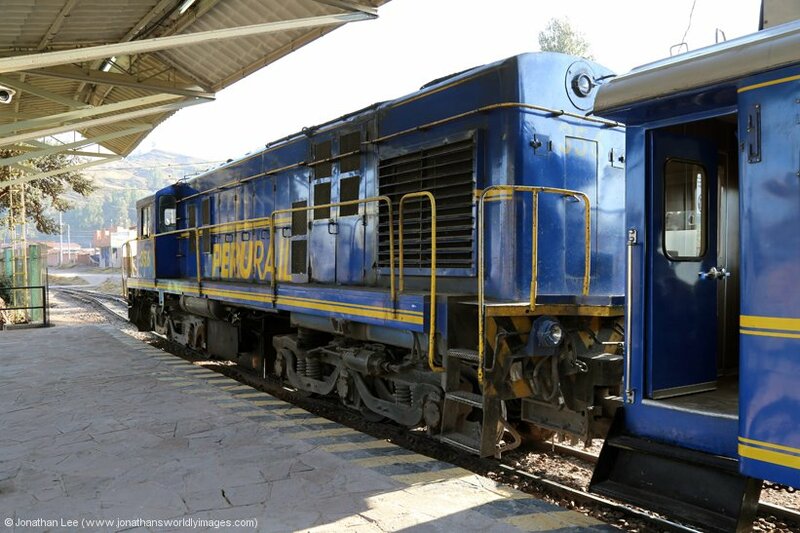 Free transportation to certain hotels in Huancayo was waiting in the station area to take people from the train, this included to the Hotel Presidente where we were staying. We opted to walk though and ME Maps guided us to the hotel in about 10 minutes and yet despite being the first from the train to the reception we failed to be first to our room thanks to the hotel not having a record of our booking.com reservation! The result of which was us getting an upgrade to a VIP room as there weren’t any standard double rooms left; and a rather nice and spacious room it turned out to be. As we headed straight back out to get something to eat we found the chunder crew sat waiting to check-in in reception. Chips and ketchup sufficed for tea from the first fast-food place we came across and went down a treat. Despite being fed three times on the train the food wasn’t enough to stem hunger by the end of a 14-hour journey. 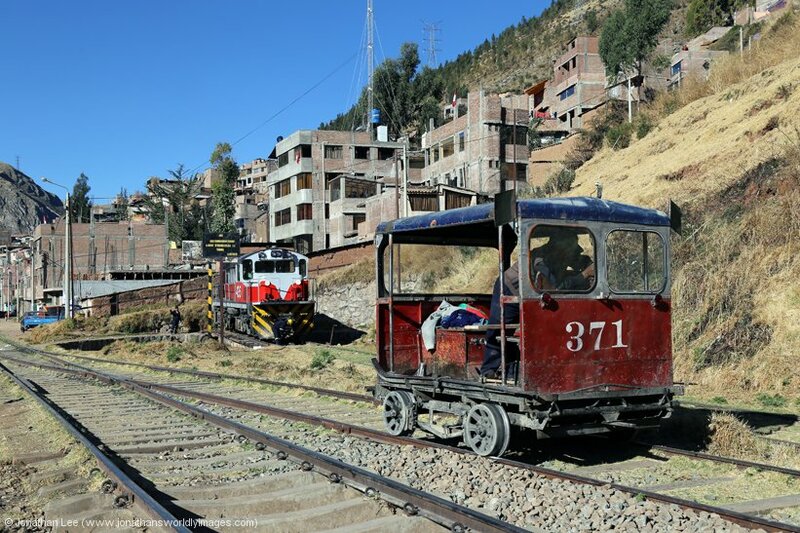 Thankfully we managed to make it to be by 2300 as we had an appointment with the FCHH booking office, down the road at Chilca station, the following morning at no later than 0600! The 0530 alarm was definitely unwelcome! We were soon up and downstairs though. The hotel staff were happy to keep our big bags until we returned the following night and the breakfast we’d asked to be packed up for us turned out to be cheese/ham sarnies that were left on the side by the tea/coffee. 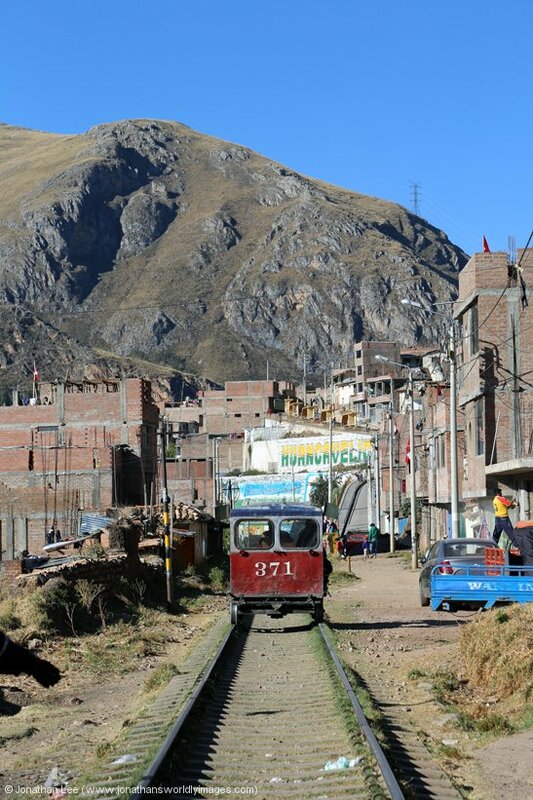 The early morning walk to Ferocarril Huancayo Huancavelica’s (FCHH) Chilca station was a 10-minute walk through deserted streets, which got busier as we neared the station. Approaching from the main roads, it’s not evident where the entrance to the station building is and we were pointed around the back of the gated station area; with access being via Leoncio Prado. Once inside the station building the queue for tickets was already the length of the waiting area and there were as many more people sitting down waiting, which I assumed were waiting for others to buy their tickets for them. Progress was slow and we could see the stock already filling up through the entrance gates in the murky morning light. All of a sudden though the whole waiting area came alive and people started darting about. 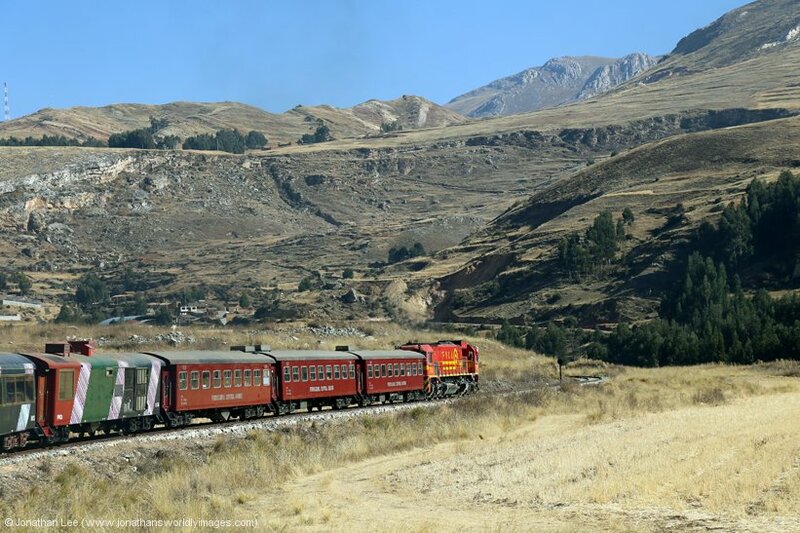 We soon realised that a second booking window had been opened, for tickets to Huancavelica only, and people jostled for their place in it; with some being left behind in the confusion. This included a couple who spoke fluent English but were of Peruvian & Danish origin, who asked us what all the confusion was all about and if we’d get their tickets for them as we were way ahead of where they’d managed to end up at that point. Of course we were going to oblige but we were all called to the front of the queue by the security staff and the Spanish speaking Peruvian ended up getting our tickets for us! Unfortunately, there weren’t any buffet class tickets left so we had to make do with normal 1st class tickets, which cost 9 Soles each. Once through the barrier and onto the main station area we were directed to coach No.2, which was as wedged as the rest of the train and a quick walk through the coach soon had us resigned to the fact it was going to be a very wedged train. We managed to find two seats in a bay of four that weren’t occupied but had to get bert, who stank of stale sweat, to move some of the many bags him and his missus had positioned on the seats and on the floor in the bay. We eventually got sat down opposite each other in the aisle seats of the bay. The couple that had been in the queue with us, and their whole family, weren’t so lucky and ended up standing in a doorway from the off! 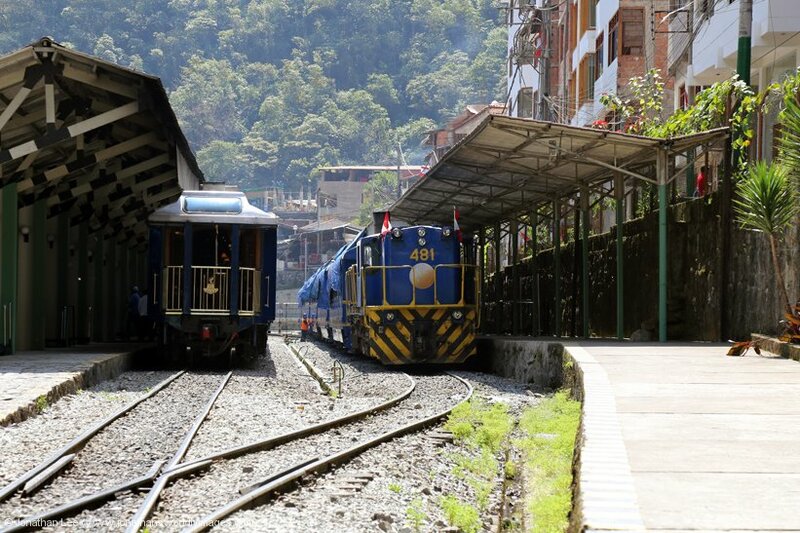 Loco – van – 2 x buffet coaches – 5 x primera coaches. The train was full and standing down the aisles, which in some ways was quite helpful as it was a cold morning and even the windows ended up steamed up completely due to the temperature variation from inside to outside. Station stops en-route were a few seconds only and people had to scramble to get on before the train was on the move again. 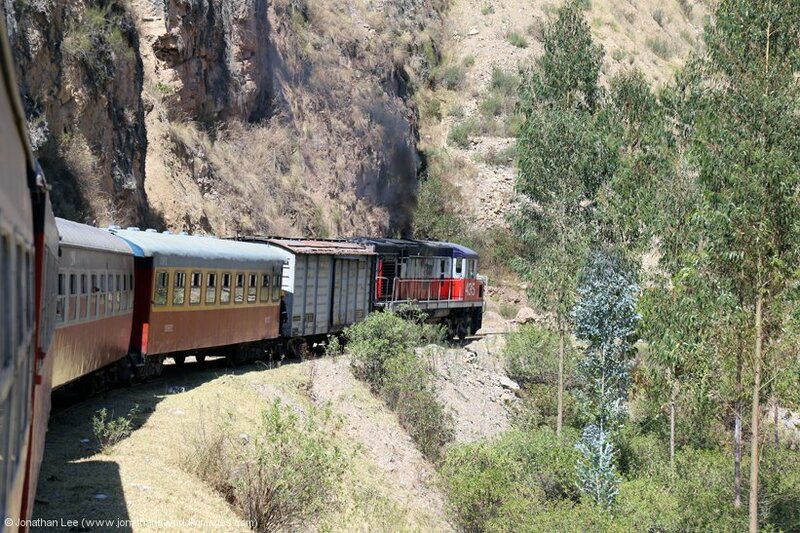 This was so until Cuenca where we sat for about 20 minutes and then at the next station, Aguas Calientes, we crossed an autorail DMU heading towards Huancayo at approx. 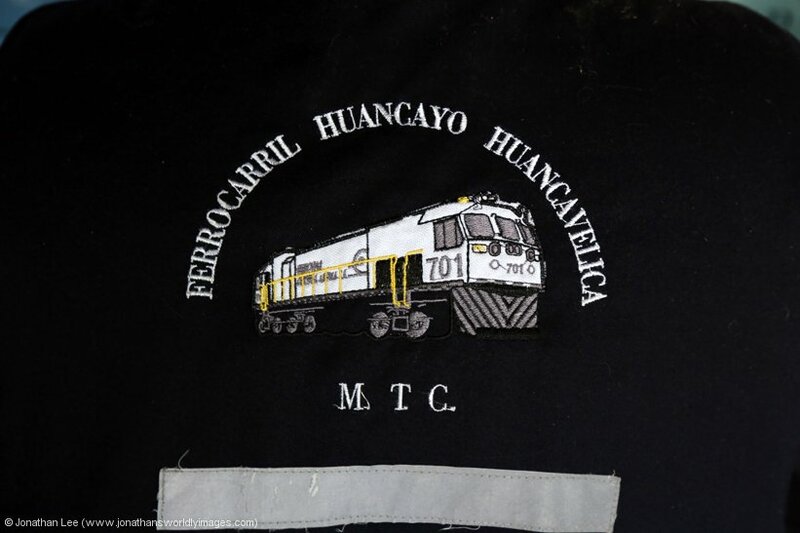 0915, which could only be the 0630 departure from Huancavelica to Huancayo; due there at 1000. Once the sun came up the outside temperature started to warm up and the windows eventually cleared giving way to the outside world. The fact that the train was wedged, and we were in the middle of the coach, certainly put pay to any toilet visits en-route as we couldn’t get to them, let alone in them. Yet the guard still managed to get through the train and do his stuff. 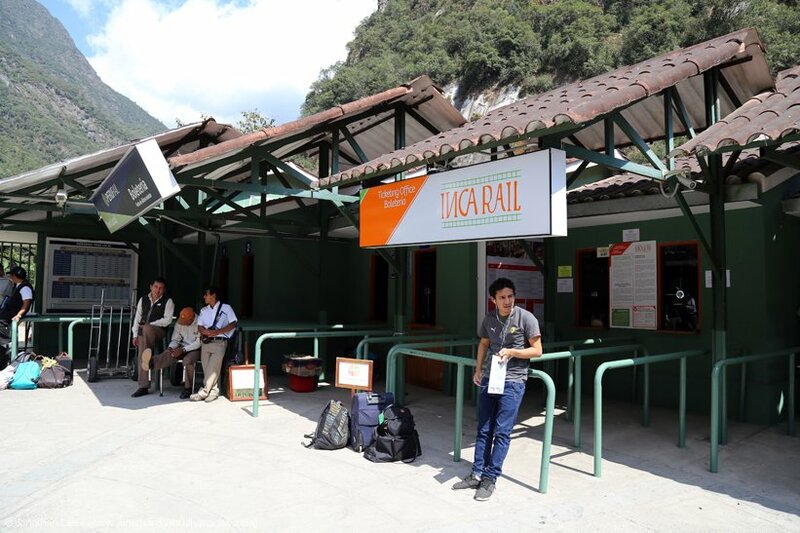 His busiest period being at Izcuchaca after a raft of female vendors boarded the train as rapidly went about selling their freshly made goods. They were all chung up by the guard for the privilege but judging by the amount of stuff they all sold between Izcuchaca and Mariscal Caceres, it was well worth their while; despite a bag of fresh pastries or bread costing a mere 1 Sole! 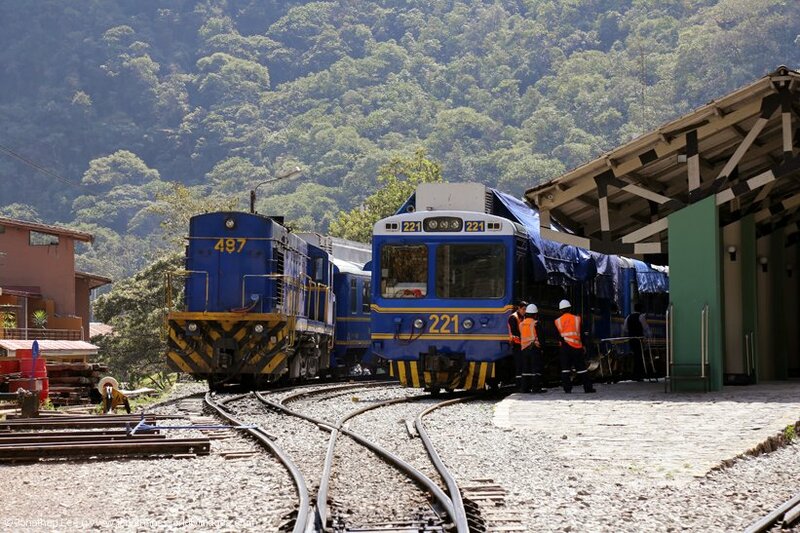 At Mariscal Caceres two coaches were detached from the rear and after the main train drew forward the points were set and the two coaches pushed/pulled by the train crew, by hand, into the adjacent road! 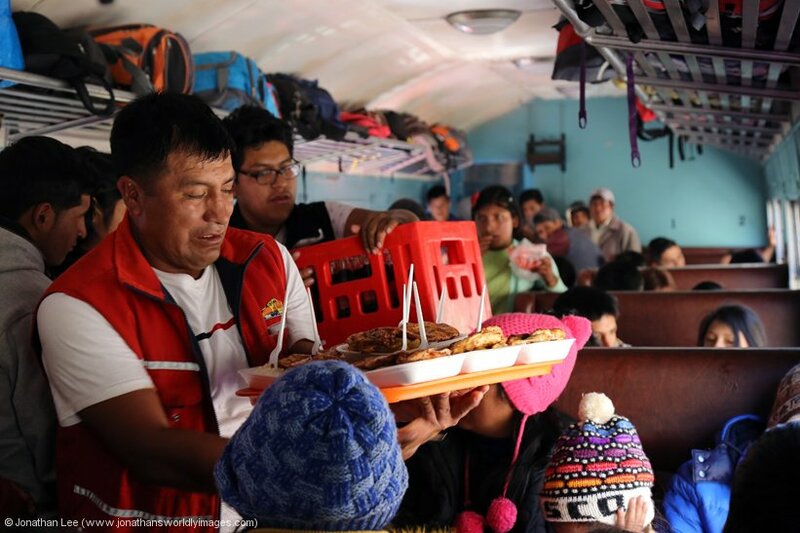 Once everyone was back on board the train continued its journey, now minus 2 coaches, with all the vendors having left the train and everyone being a lot more awake and better fed than they had been upon departure from Huancayo almost 4 hours earlier. Despite the wedge factor on board the buffet bert still managed to force his way through the train carrying half a dozen plates of hot food at a time, which ranged from fried chicken and rice to fried beef and chips; which actually looked quite good but there was just nowhere to eat it. Thankfully at Acoria the train emptied out quite a bit, which included bert & ada from our bay. This then meant I could get to the window and have a bellow and take some photos. We were joined at this point by the couple from the ticket queue, who looked exhausted having been wedged in a doorway for over 4 hours. 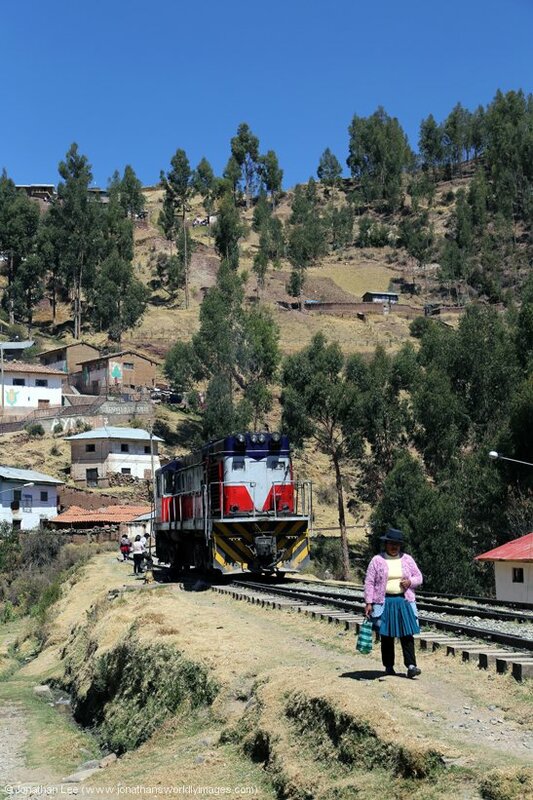 At Yauli, the penultimate station before Huancavelica, and just 16km from our destination things looked to be going swimmingly. 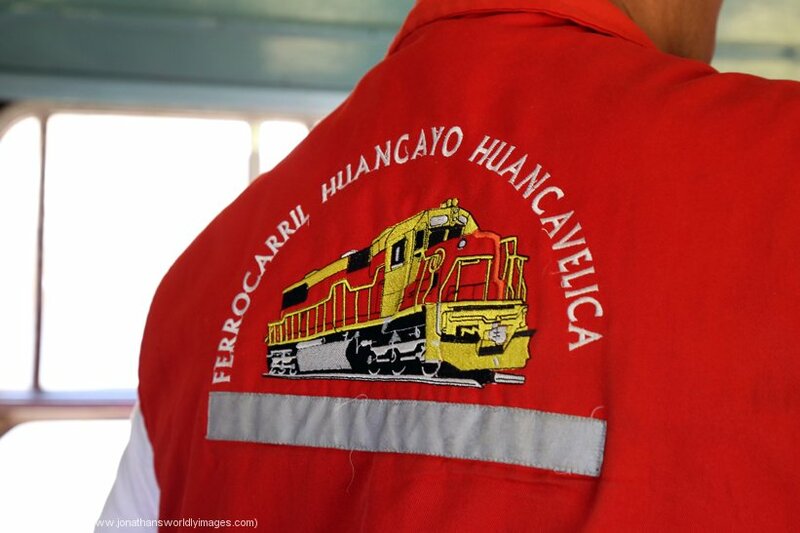 We had about 90 minutes before our booked arrival time into Huancavelica, the train had emptied out quite considerably and I had time to stretch my legs as the MLW shunted off the van from the front and positioned it in the adjacent platform for the locals to offload their goods; which were mainly fruit & vegetables. There was even time, and space, to get to one of the toilets. I’ve used and seen far worse but they weren’t the best and most didn’t have locking doors, still needs must and all that. It seemed to be taking a while to get the loco back onto the train and investigations soon revealed that there was a bit of an issue with it. I initially thought it might have derailed as it was stood right over the top of a set of points but all wheels were firmly on the rails. The man with a spanner underneath the loco taking a traction motor to pieces soon gave the game away, which is what happens when you only have one engine to run your service with; it either gets fixed en-route or the train doesn’t run, which apparently happens from time to time with the El Macho! Back on the train I was told that one of the train crew had been through and told everyone that the delay would be another 3 to 4 hours and many people started to abandon ship. There were apparently collectivo’s in the square a short walk from the train but we were lucky and followed the couple we’d befriended, who’s family had been into the town, accosted a collective and brought it round to the station; they were just collecting all their bags when I got back to the train so off we went with them. The journey was definitely one of the most interesting I’ve done by road and was mostly along the side of cliffs with us driving on the outside edge! 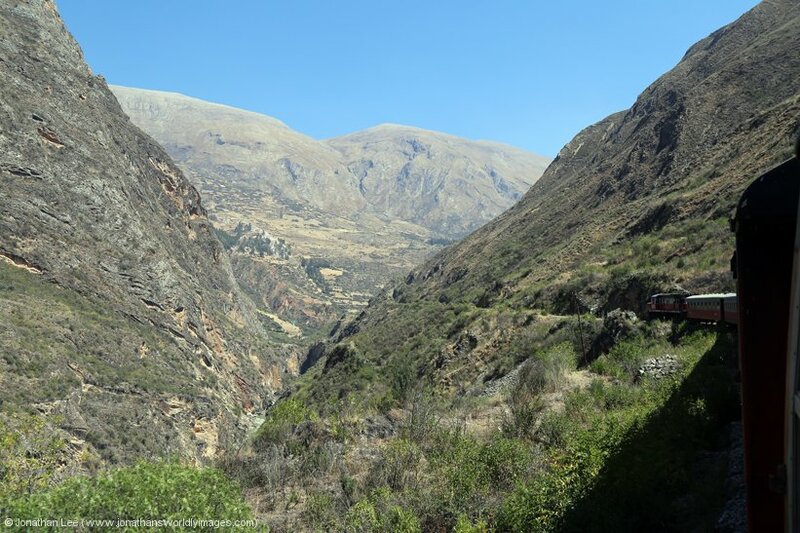 The view was fantastic but I was so glad when we got to a main road and began to head away from the cliff edges and into Huancavelica. Had the train actually run there were some cracking vantage points from the dirt tracks the collective took and the railway could be seen down in the valley for almost the whole 20-minute journey. We were dropped in the collective park at the bottom of town at 1300, about 10 minutes’ walk from the station, and the fare was a massive 3 Soles each. We weren’t allowed to pay ours and the mother of the girl we’d been chatting to insisted that she paid for our journey. Unlike them we had a hotel to go to and we left them to walk around town to find somewhere to stay while we headed to the station to see if we could get tickets in buffet class for the following morning. 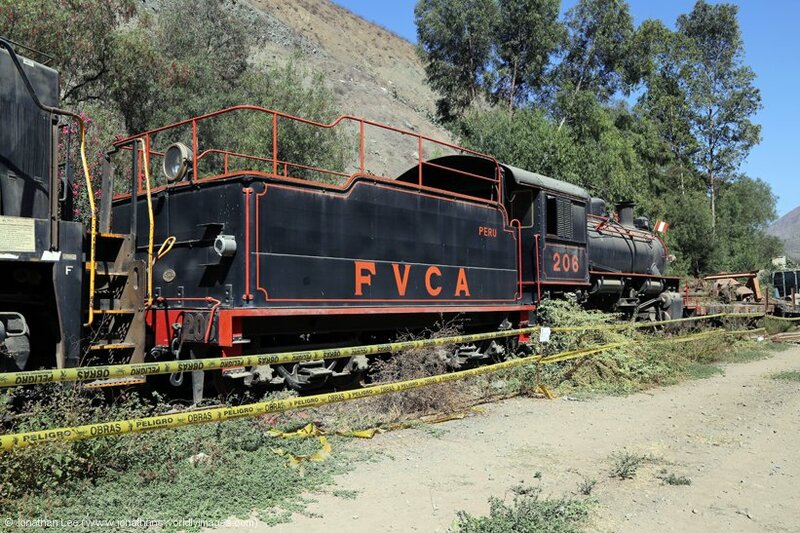 Huancavelica station it up a rather steep hill and plinthed outside it is an old FCHH steam loco. The booking office was closed but the station was manned. 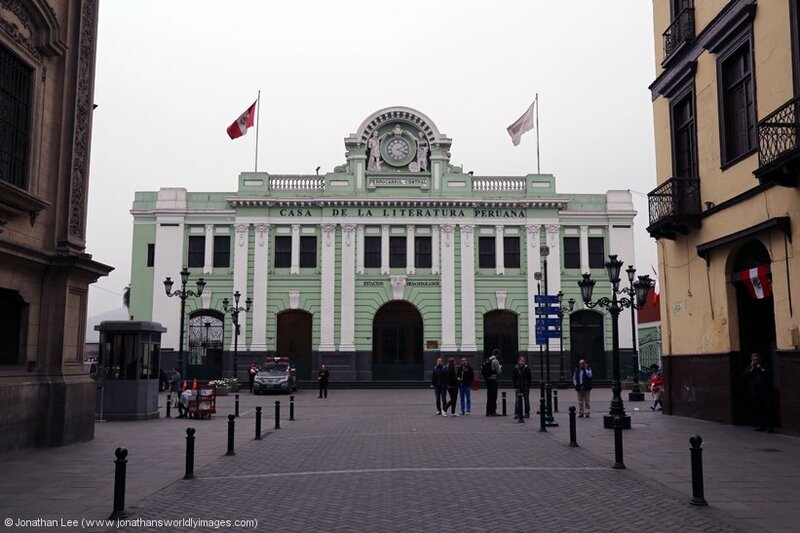 As the timetable showed an 1830 Autorail departure to Huancayo the booking office would in theory be open at 1400 so we took a steady 10-minute walk to the Hotel Presidente, which I’d pre-booked on Booking.com and was in the Plaza de Armas at the end of town. There wasn’t a word of English spoken at the hotel at all and Google Translate played a big part of both our check-in process and discussions surrounding the cost of our room; which was more than even the dearest room on their hotel price list displayed in the reception. All I could get from the receptionist was gestures that seemed to give the impression that I should book direct with the hotel and not booking.com, yet when I produced them the two e-mails I’d originally sent requesting accommodation they just shrugged and didn’t seem to care. The room itself was large, with two king-size beds and a table to eat at, as well as a sofa to sit on and a balcony overlooking the street below. It was clean, had toiletries and hot water, along with a heater; that was needed later in the day. The bed was huge, comfy and had plenty of bedding to keep us warm when the temperatures plummeted at night. 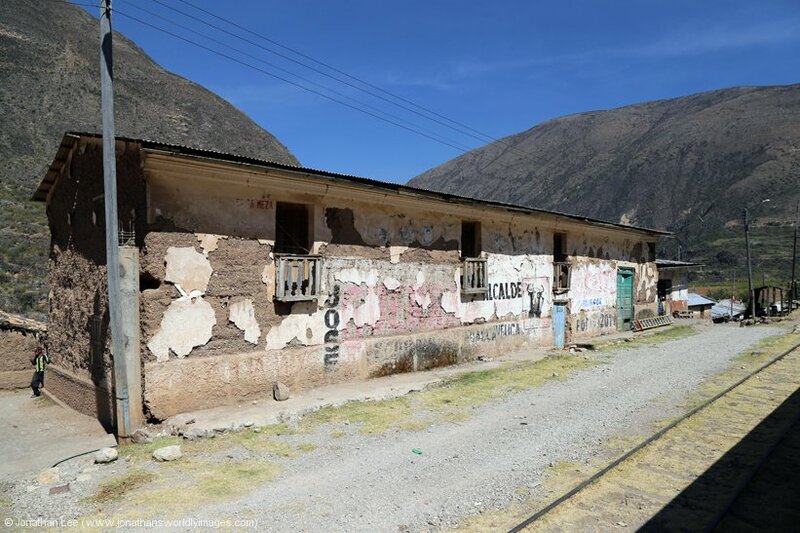 Even so and despite the issues during check-in the Presidente in Huancavelica is well overpriced, even compared to its sister hotel in Huancayo. Having not eaten much since leaving Huancayo a well deserved lunch in the hotel restaurant was sought and we just got in before it closed. They served up a very good Lomo Saltado, which gave us the energy to venture out again. After an initial look around the Plaza de Armas, where Huancavelica Cathedral stands right next to the Hotel Presidente, we were station bound to try and prevent having to suffer the same wedge-ex back to Huancayo the following day, to that we’d endured on our way out. For an out of the way place, where temperature extremes were quite big (from 25 degrees’ daytime to a few degrees above zero at night) Huancavelica was quite a large place and its main streets were quite busy, despite quite a lot of places just selling any old tat. It was surrounded by hills on all sides and it was even uphill to get to the station from the town level! En-route to which we had the pleasure of passing the hard working bin men, who had very loud music blasting out from their bin lorry and seemed very happy with their role in life. Just as we began to walk up the steep road to the station a horn could be heard in the distance and sure enough, as we staggered onto the platform, FCHH’s MLW #435 was just coming to a stand; arriving at 1545 vice the booked 1230, only 3h15m late in the end. 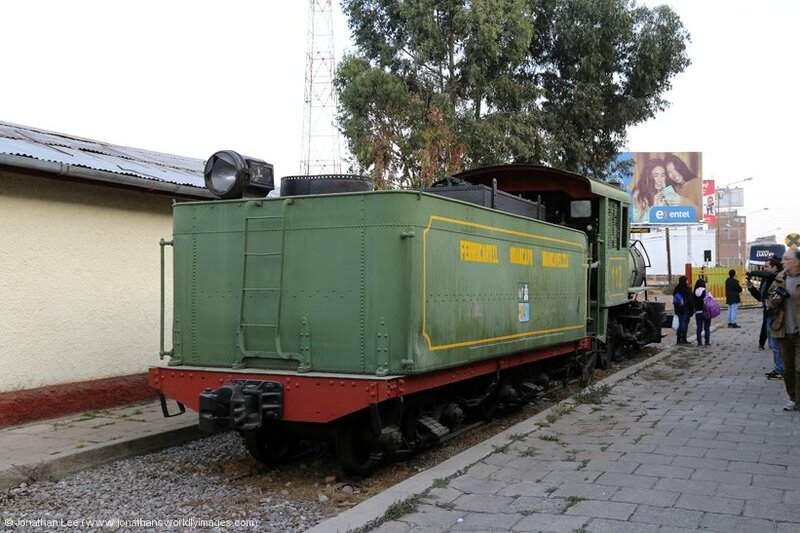 About a dozen people got off the otherwise empty train and within seconds the MLW was off the train, into the headshunt and then onto the turntable at the Huancayo end of the station. 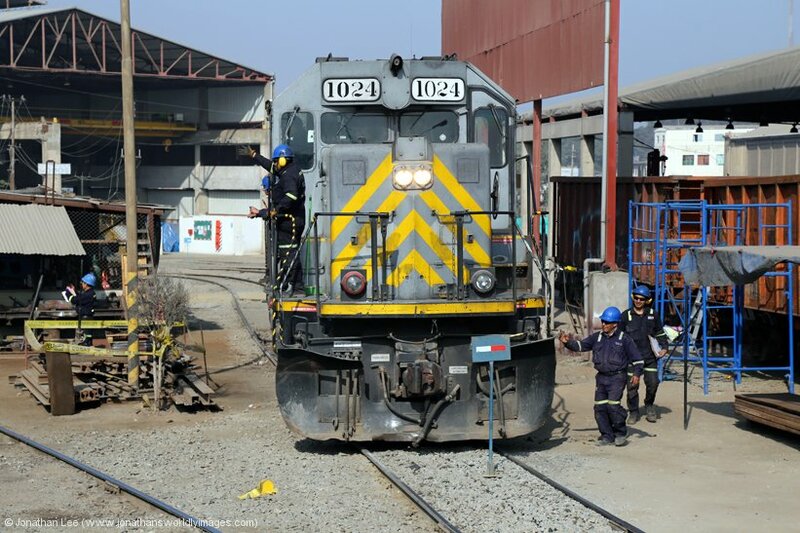 The train crew pushed the turntable around manually while a mobile motorized track inspection car went by and once back on the set it pushed the stock back a little and was shut down in readiness for the morning’s departure back to Huancayo. 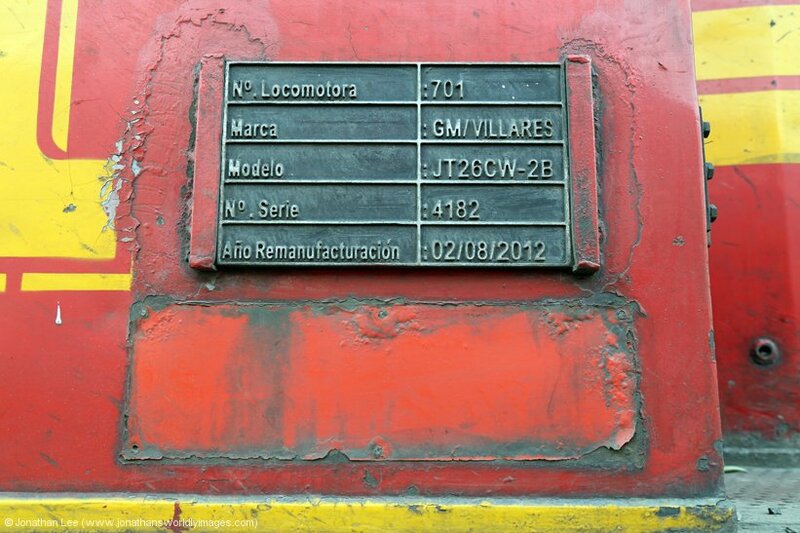 A quick investigation of the loco revealed a works plate underneath the paint, which confirmed that #435 was indeed numbered correctly with MLW M6078-02 being stamped on the plate. The booking office wasn’t open at the station but the office was open, as it had been when we’d been earlier. Inside the guy was selling tickets for the following morning’s departure back to Huancayo and on his desk were two pieces of paper with the coach lay-out for the buffet class coaches; thankfully not all the seats were crossed out and we were soon in possession of two buffet class tickets, which cost 13 Soles each. As we walked out of the office the couple from the morning walked down the platform. They’d managed to find somewhere to stay, albeit by hunting around a bit as quite a lot of places were full. They then managed to get themselves 6 seats in buffet class for the following morning as well, leaving just one seat available at 1600 the day before the train actually ran; so it pays to be able to get your tickets the day before. 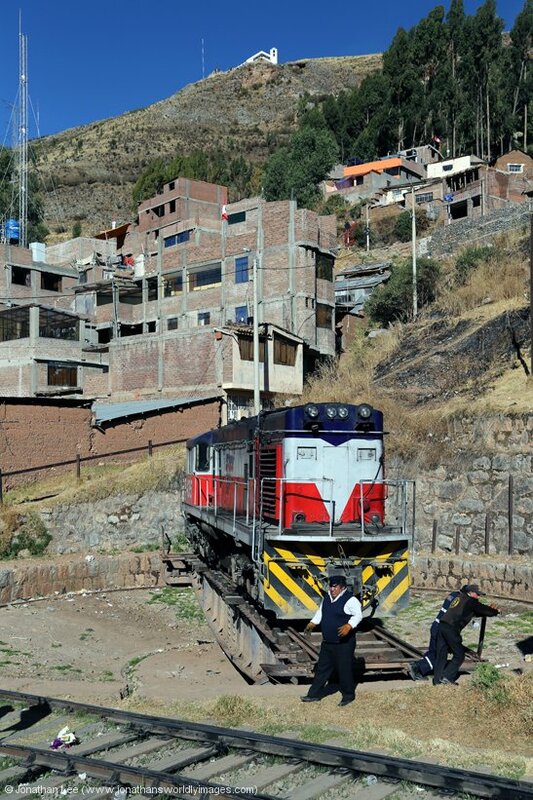 Huancavelica station, in its metre gauge days, had a high level siding. In which were some remnants of days gone by in the form of a few small tank wagons. From the higher level you can see for miles and see just how far Huancavelica extends. Its also quite a good place to get a panoramic photo of the train in the station, although it is actually better in a morning when the sun isn’t shining straight at you. On the way back to the hotel I soon realised why none of the shops seem to have a fridge with cold pop in as the shops never really warm up inside during the day and the pop stays cold; and once the sun started to go down the shift in temperature was immediately evident and it wasn’t long before the heater in our hotel room was switched on. Initially though it didn’t help one bit and I found myself needing to get under the bed covers to keep warm! Now while the Presidente was overpriced I did find myself thinking that at least we had hot water, a heater and thick bedding, while most places in town don’t have some or all of the aforementioned! Pollos y Parrilladas Centro, just across the way from the hotel, provided a very good Milanesa de Pollo for tea, two of which only cost 1 Sole more than a single Lomo Saltado had done at dinner time. The portions were big and the local place for local people had a constant turnover of people while we were there. Google translate had to do its magic on the menu before we could order something though! On the way back into the hotel we had the pleasure, or not, of listening to some rather out of time and way too loud brass band playing outside the cathedral, next door to the hotel. Thankfully they packed in at 9pm as even my earplugs couldn’t keep their badly timed playing, or should I call it racket, out! The thick duvet, blanket and sheet on the bed, coupled with the heater being on full, made for a very snug bedtime and we actually had to turn the heater off eventually. It was another early morning alarm call, this time at 0515. It was a very fresh morning but the walk to the station warmed us up a bit. 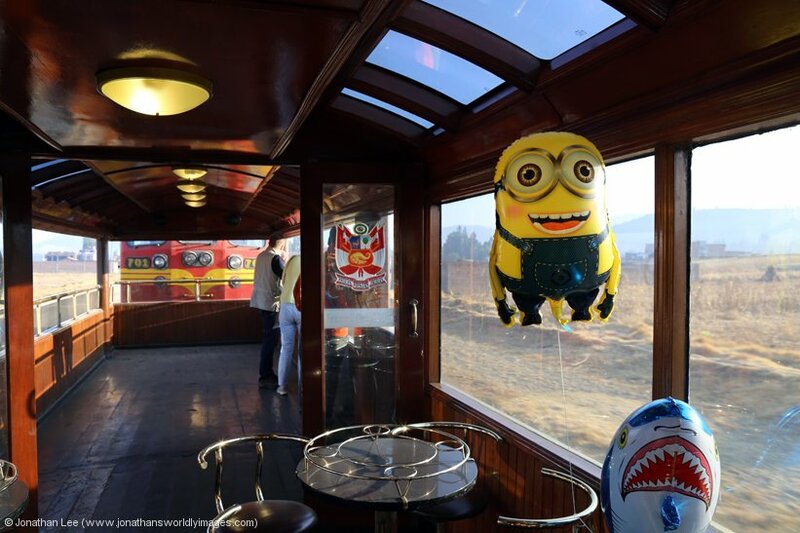 As we were already in possession of our buffet class tickets, which came with an allocated seat, we didn’t need to be at the station as early as we had been at Huancayo the previous morning. When we got there at around 0600 the crew were just arriving and preparing the train and the good sign was that our little MLW #435 was already running and hunting away nicely as people began to ascend on the station area. The booking office was open and surprisingly the queue inside it only had about 5 people in it, which was all a bit too civilized really. I can only assume that most people had purchased their tickets for travel the previous day, although there were clearly some that didn’t have tickets at all when we set off. 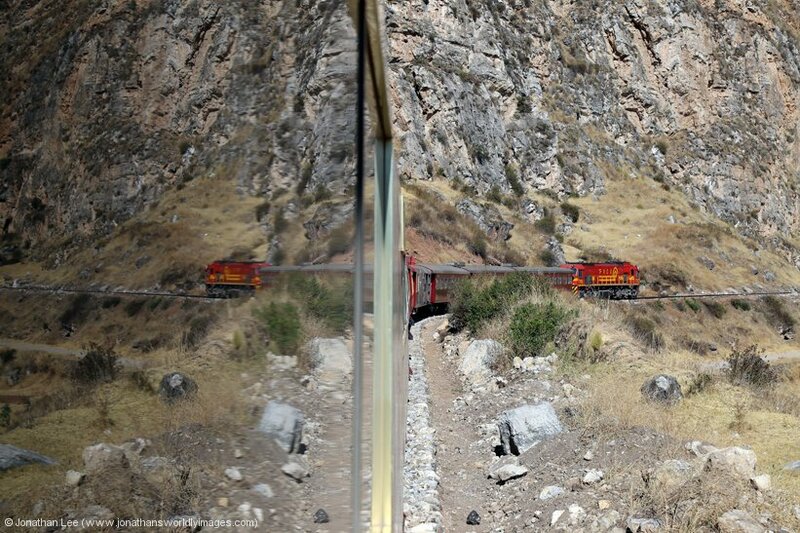 The train gradually filled up from the moment we got there but wasn’t overloaded when we departed Huancayo at all. The family we’d be friended turned up in good time and were sat in the bay of seats behind us and when the train set off it was actually quite pleasurable in buffet class, with nobody standing in the aisles at all. That was mainly due to the guard regulating people getting in and sending them through to primera class if they didn’t have buffet class tickets. This worked to an extent but as there were empty seats some people insisted on filling them with their butts! 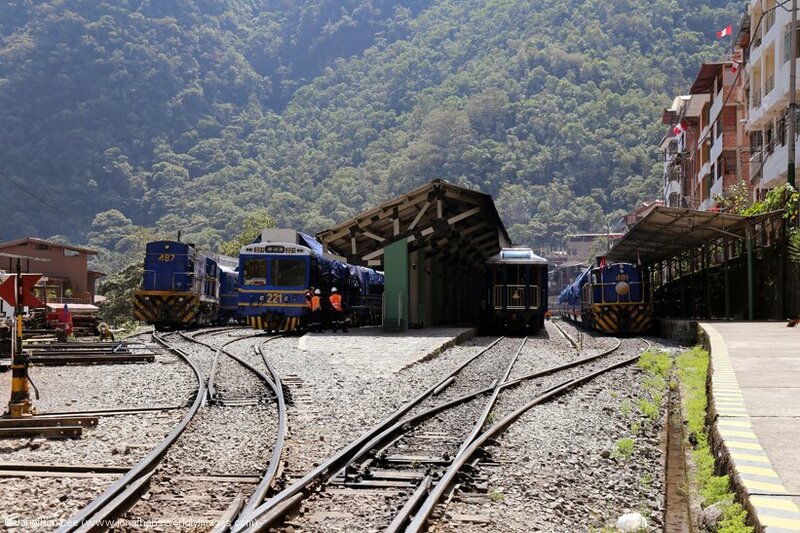 Surprisingly the guard went around and chung them all the excess from primera to buffet class and nobody seemed to complain; and the 4 Soles extra was certainly worth it when we departed Yauli! 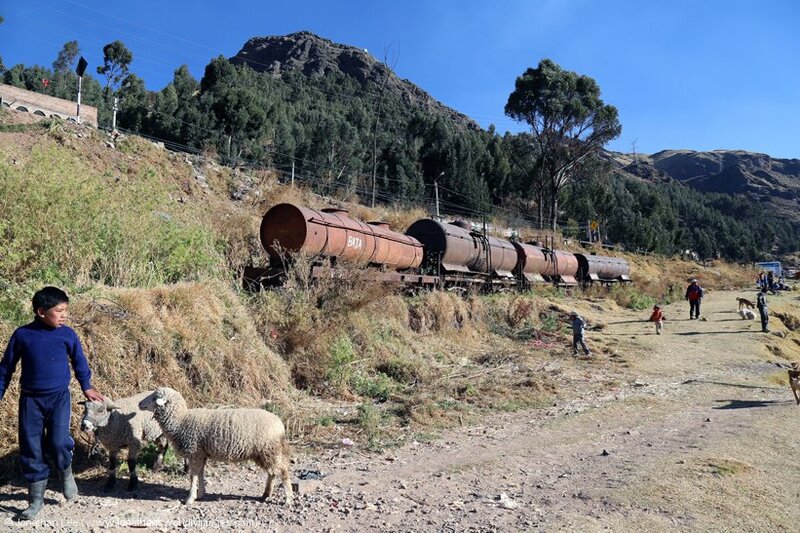 It was a nice amble through the valley towards Yauli and on arrival I fully expected the loco to be chopped off to add the van back to the front of the train and convey goods back to Huancayo. This didn’t happen but there were rafts of people waiting and it was a complete free-for-all as people loaded themselves in wherever they could; including into any available space in buffet class. 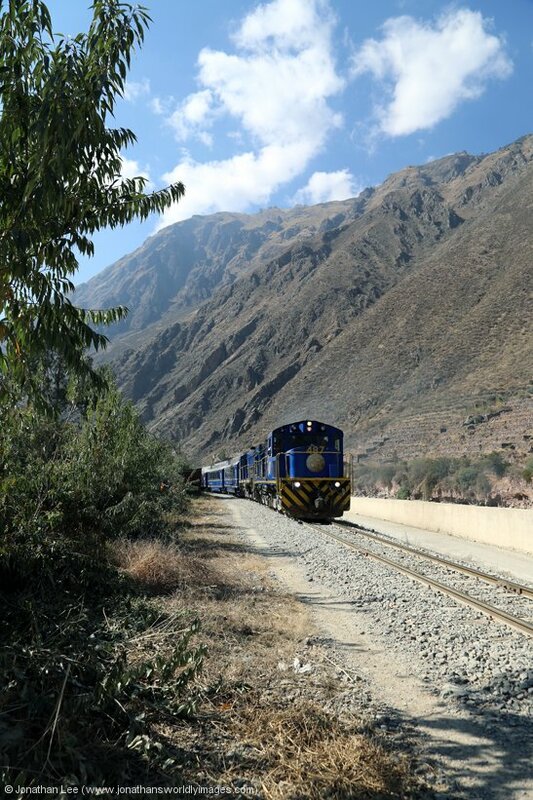 What we thought was going to be a nice relaxing morning soon wasn’t as people crammed themselves into the aisles and by the time we left Yauli the train was full and standing with there being 3 primera and 2 buffet class coaches to choose from. 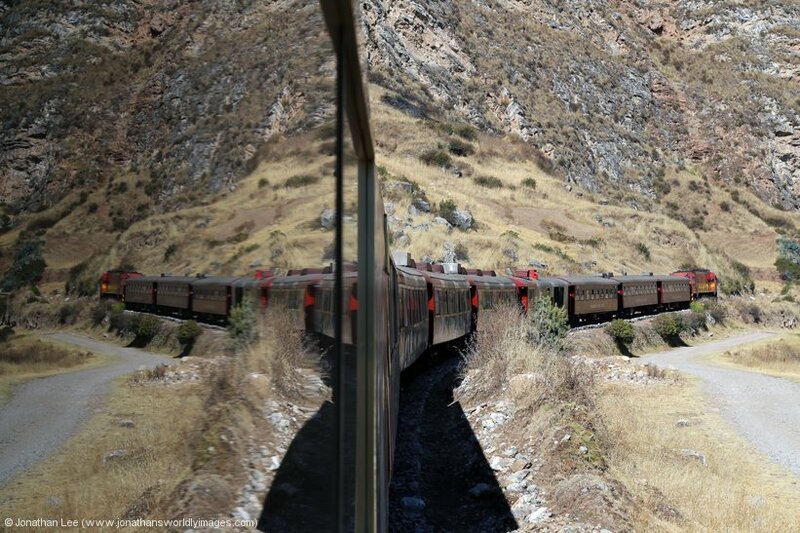 Between Huancavelica and Yauli the buffet guys had come through and asked if anyone wanted food at their seat, after Yauli though normal service resumed with the guys balancing sometimes 5 plates in each hand at a time and yet still managing to get through the buffet class coaches; and beyond if they hadn’t offloaded them all by the time they reach the primera coaches. While the food actually looked good I wasn’t in the mood for a full meal at such an early point in the morning; besides I had morning to eat it with and it was still quite cold. It remained cold for quite a way and the sun didn’t make it high enough to warm the cold air until Mariscal Caseres, by which time the condensation on the windows had gone and people had actually started to remove their big coats and even open the windows. As we drew to a stand there though chaos ensued yet it seemed that people in our coach didn’t get the memo when everyone else standing in the primera class coaches made a mad dash for the two coaches stabled there, that we’d dropped off the previous day. Despite even the guard and other train crew telling everyone there were two empty coaches to get themselves into they all stayed put and favoured the aisle in buffet class over what could have been an empty seat; I wish they’d listened! Despite not many taking the hint there were at least enough folk with the sense to move, which then at least paved a way to the toilet at the end of the coach. This in itself was a bit of an ordeal as the door didn’t lock, the bog itself was full of baggage and the door handle on the inside of the door was nonexistent, so people had to push the door open from the outside to let folk out! 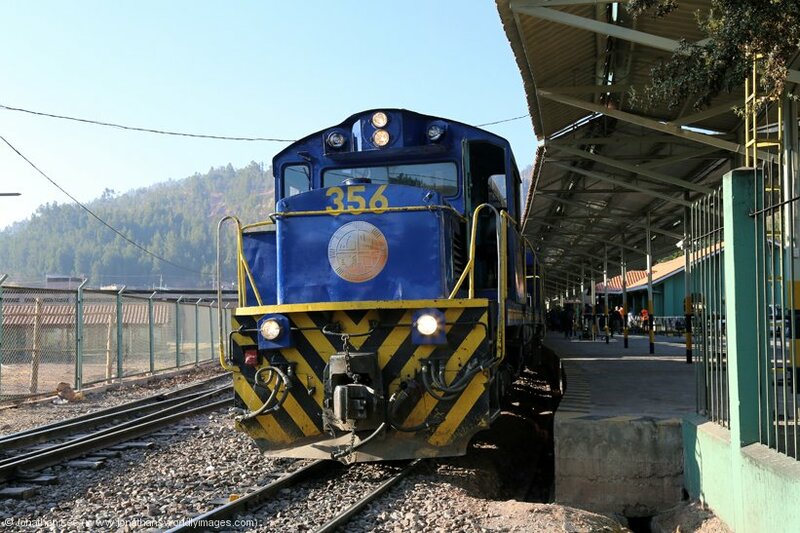 The same sellers as had boarded the train at Izcuchaca boarded this time at Mariscal Caseres to do the journey in reverse. They were all relieved of some money pretty quickly by the guard but were all soon coining it in when seemingly most of the train wanted some of what they were all selling. Each seemed to have their own variation of a theme, all of which were bread or baked breakfast type snacks. 5 pieces of each cost a mere 1 Soles and people were buying bits by the bag full! The mixture of bits we bought were nice and fresh, very tasty and definitely filled a hole. As we headed towards Huancayo everyone was well acquainted with those surrounding them, yet the child who’d been with his mother in the aisle adjacent to us most of the way, seemed to get more inquisitive of those around her and eventually took a fascination to the hairs on my arms; thankfully her grip wasn’t a good one and I came away unscathed. It was a good run back into Huancayo in the late morning sun. 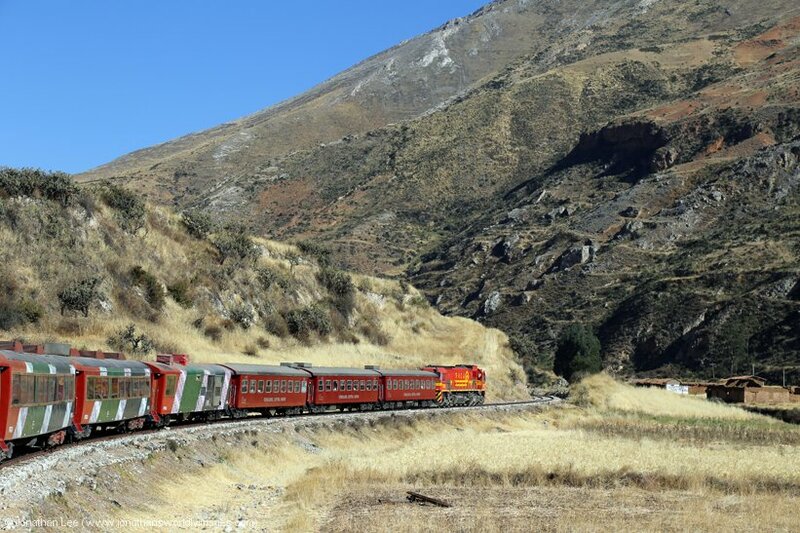 The line is nice and twisty/turny as it skirts the valley towards Huancayo and with the load 7 set of coaches the MLW up front was down to walking pace a few times. 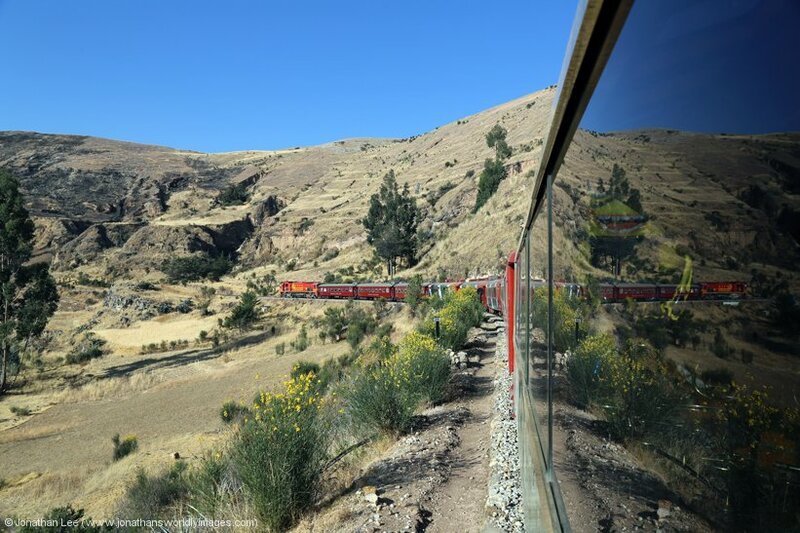 Unfortunately, the buffet class is at the rear of the train from Huancavelica to Huancayo so I didn’t get the full sound effects! 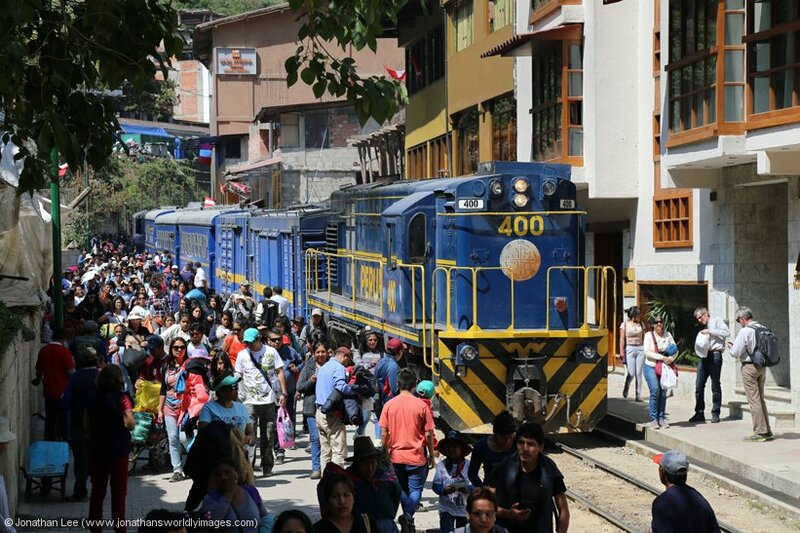 Arrival into Huancayo was at 1237, a mere 7 minutes late, where further chaos ensued as people tried to prize themselves and their luggage out of the train; which took a while. To get in clear at the rear MLW #435 had to poke out through the gates at the opposite end of the station and be parked right across the roadway until people had cleared the train. Once everyone was off the stock was shunted out and back into the adjacent sidings. Having bode farewell to our travelling companions we ambled to the Hotel Presidente, where this time we were shown straight to our room; albeit not an executive one this time. Our bags were still in the reception office, where we’d left them, but everything was present and correct. En-route to finding somewhere to eat we wondered around the very busy streets of Huancayo, which all seemed to be sectored by what they sold, even the vendors at the side of the street all seemed to sell the same thing in certain locations. Clothing, especially shoes, seemed to be up there with the most common places and down the side streets, hidden away, were places you didn’t really want to come across like those that dealt with animals, mostly dead but some had cages with those in that would soon be dead. It wasn’t the most pleasant of areas to have to wonder through but there didn’t seem to be much of a way to avoid it without a long walk! After KFC in the large shopping centre by the station, which was randomly blaring out ACDC while we were there, we took a wonder around Huancayo and took in the bigger sites it had to offer like the Plaza de Armas and the Huancayo Cathedral and in the evening we chose Don Tomato Italian restaurant to eat at. Strangely our pizzas came without any tomato base on them at all, although they weren’t bad pizzas. The service wasn’t the best though and after an initial friendly chat with the guy that ran the place, who spoke fluent English, he left his wife to run things who really was just a waste of space and didn’t seem to care much about her customers; well let’s just say her foreign ones anyway. I had to make a point about paying and make her move to the counter to even consider taking my payment! Another morning of early rising, this time at 0530. At least we managed to sneak breakfast at the hotel before we left and as we checked out we spotted some familiar faces in the hotel lobby; including the chunder crew from two days previous. All of whom must have been waiting for the bus to take them to the station for the train; we opted to walk. It only took us 10 minutes to get to the station gates, where there was no queue but tickets were needed to gain access. Once inside the station area there was a bit of queuing to get onto the train but once clear of that we could roam around freely. We had the same seat, in the same coach, for the return journey; which did have a few empty seats on the journey back to Lima. As expected FCCA EMD JT26CW-2B #701 was sat ready with the stock, doing a better job of at least not blocking all the roadway outside the station this time. It was a cold morning and not one for standing around too long in the veranda car until the sun came up so when the train departed 5 minutes early at 0655, I stayed firmly in my seat. 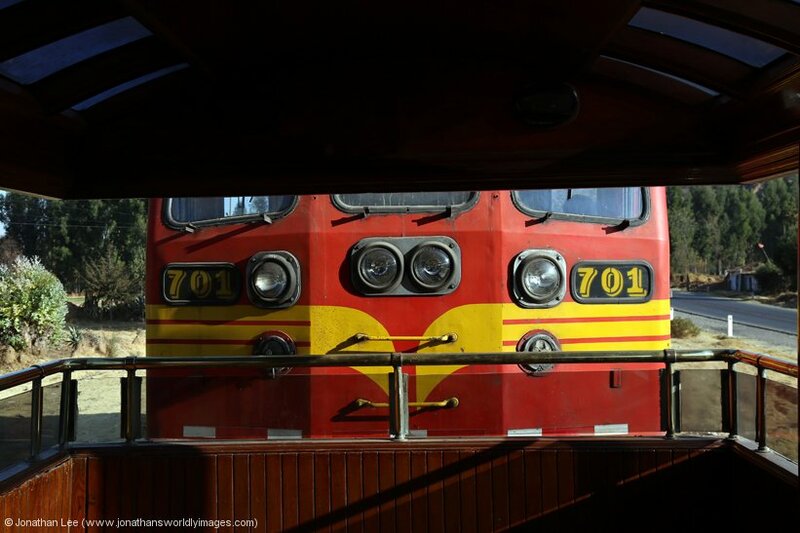 As the veranda car was right behind the loco from Huancayo the train was routed around the wye at Tambo; with #701 being detached on the east curve, run around and then it propelled the train onto the branch before heading off around the west curve. 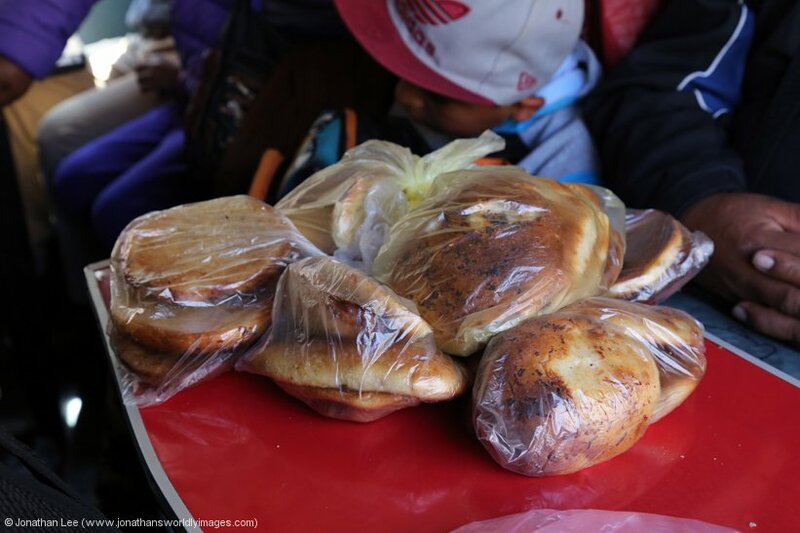 While that was happening locals plied the outside of the train with bags of fresh bread and stuff, similar to what the Izcuchaca locals had sole on board the FCHH train. They all went away empty handed and most of their business was done via the veranda car. Breakfast was served after we left Tambo, which comprised of a jam sarnie, a cheese sarnie on aniseed bread, a bruised apple and a carton of juice. While it was cold I still spent much of the morning out on the veranda admiring the scenery we’d missed due to darkness two night’s previous. 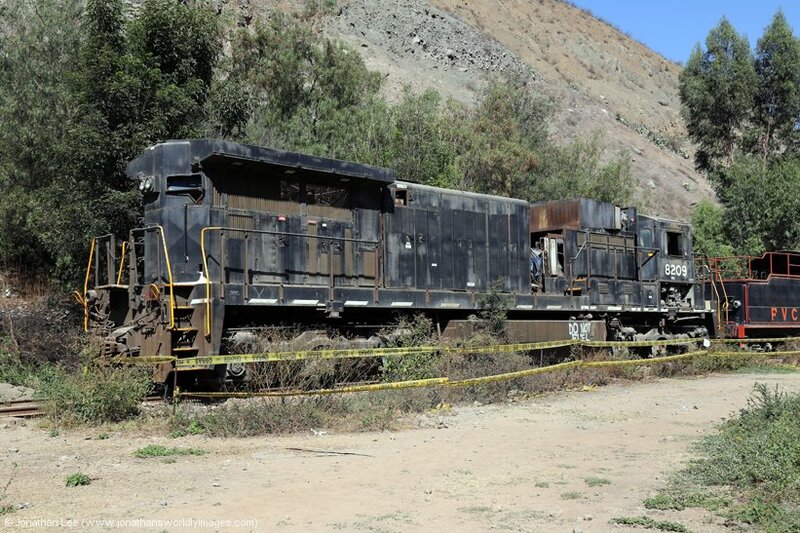 On arrival at La Oroya the crew were quick to have GM #701 off the train and ran it onto shed. The only other engine there was FCCA GE C39-8 #1020 and once the crew had transferred their stuff from one loco to the other 1020 was turned on the turntable and shunted onto the train for the uphill slog to Galera. Again I spent much of the time on the veranda up to Galera Summit admiring the scenery. We passed nothing at all until we reached the bottom of the final slog up to the summit and found FCCA GE C39-8’s 1029/1017 shunting the works down in the valley while classmate C39-8 1019 was stabled up waiting its next work. Upon arrival at Galera it was announced that we were allowed off the train for a short while and as we came in I could see another GE sat in the head-shunt waiting to drop on. 1020 was off the train before I could even get off the train, let alone to the front of it; and a scruffy looking FCCA GE C30-7 #1007 was soon dropping on. 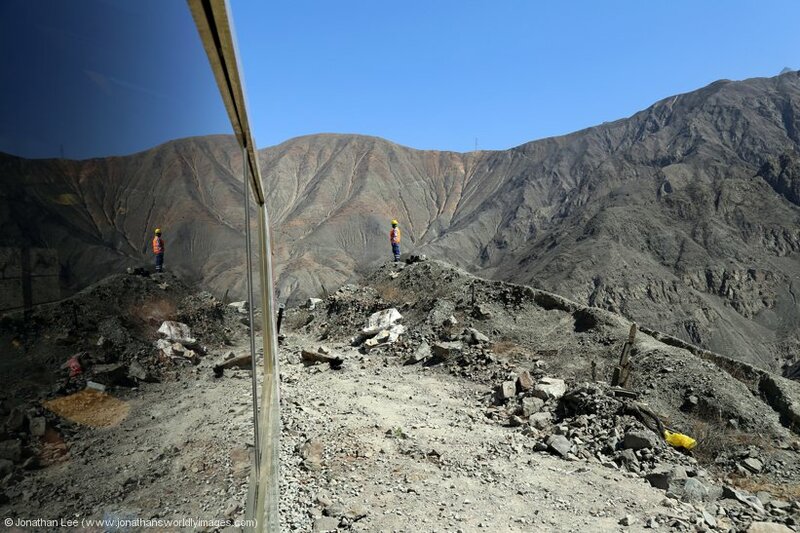 The walk to the front of the train was one of the hardest I’ve ever done and the air was really thin at 4781m, making it hard work; there was definitely no rushing about at those altitudes and while I was concerned with my photos of the train everyone else made the best of the stop and turned it into a selfie-fest! There were selfie sticks being held out everywhere, which did make me laugh a little bit as yes the photos were at Galera, the second highest railway point in the world, but not one of them had the station sign, which had the altitude on it, in their photos so to anyone looking at the photos it was just a selfie with some scenery in the background and could have been anywhere…. 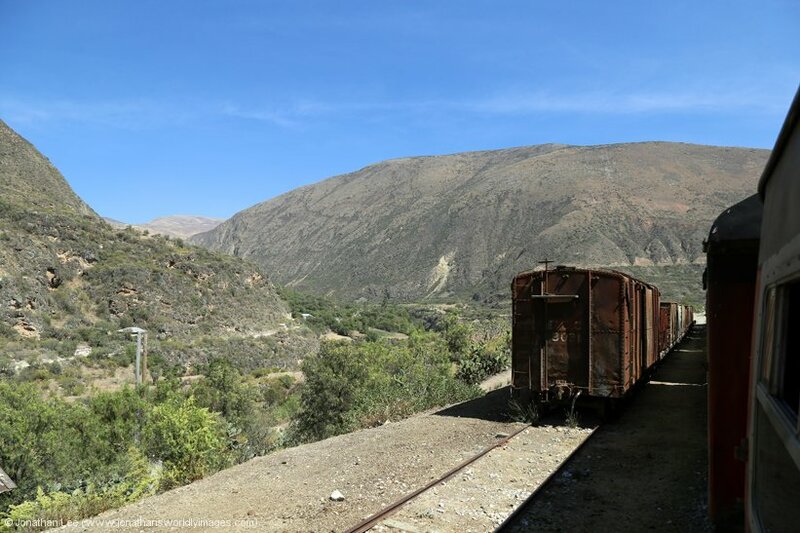 As we left Galera I noticed what appeared to be the boiler of an old steam loco dumped at the side of the tracks by a hut and then as they say, it was all downhill from there; even the weather started to change as clouds started to fill the sky and spoil the photos. Unfortunately, and as always seems to be the case, the best photo opportunities of the train curving around seemed to be while I was sat eating lunch; which was called out just after we departed Galera. It consisted of chicken and rice, some veg type rolls and what I initially thought was some sort of sweet & sour sauce but actually turned out to be orange jelly! 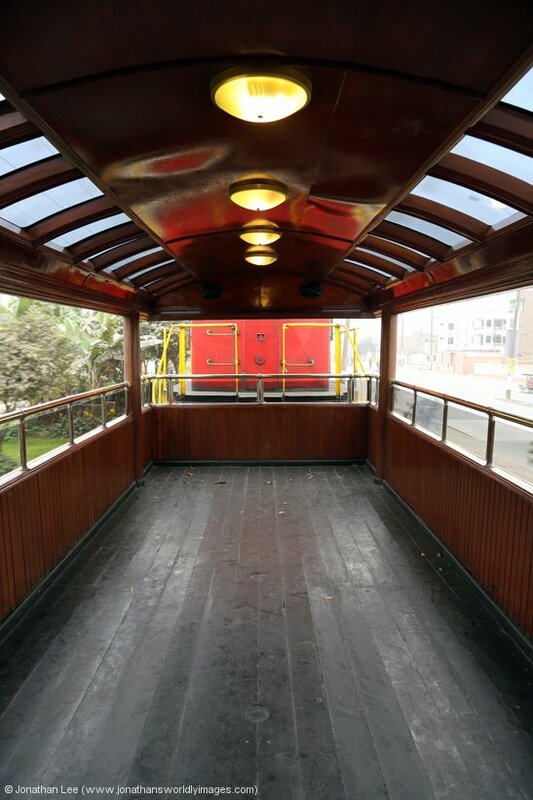 The veranda car was well loaded in the afternoon, which basically meant if you abandoned your spot you’d struggle to get back in, which is exactly what happened to me so there weren’t many photo opportunities in the afternoon as we headed down to Lima. At Casapalca we stopped for a few minutes and overtook GE C39-8 #1028 with a freight. On the rear of which was a guy, who clambered on with a bag of food, dressed in what I can only describe as a space suit; which I guessed was to keep him warm during the journey. He had no special seating of anything like that and just had to make do with making himself as comfortable as possible anywhere he could on the rear wagon! After the Chicala zig-zag we passed GE C39-8 #1027 near Carcay and then GE C30-7 #1003 near Matucana. On arrival into which a very efficient loco change was carried out which saw GE C39-8 #1016 replace GE C30-7 #1007 and we were off again; we weren’t allowed to get off as we had been allowed to on the outward journey. 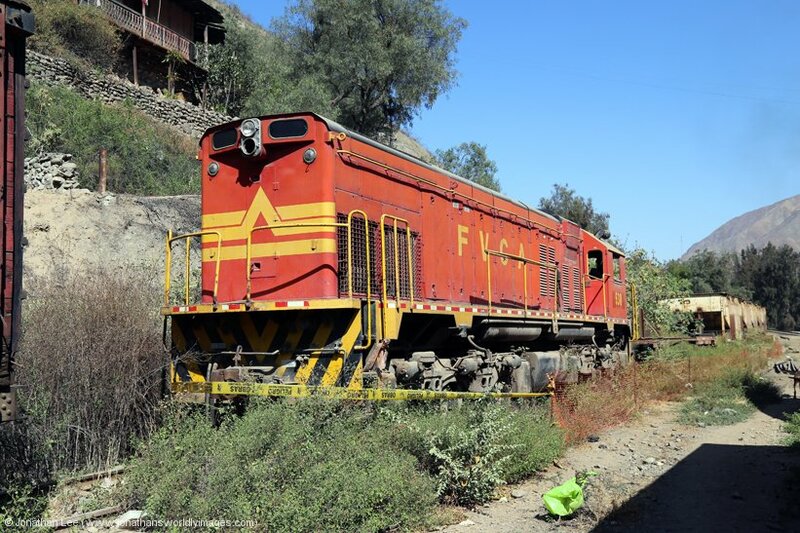 As we headed down to San Bartolome I noticed a GE and freight stabled down in the valley and couldn’t quite figure out from ME Maps just how the line would get down to it. 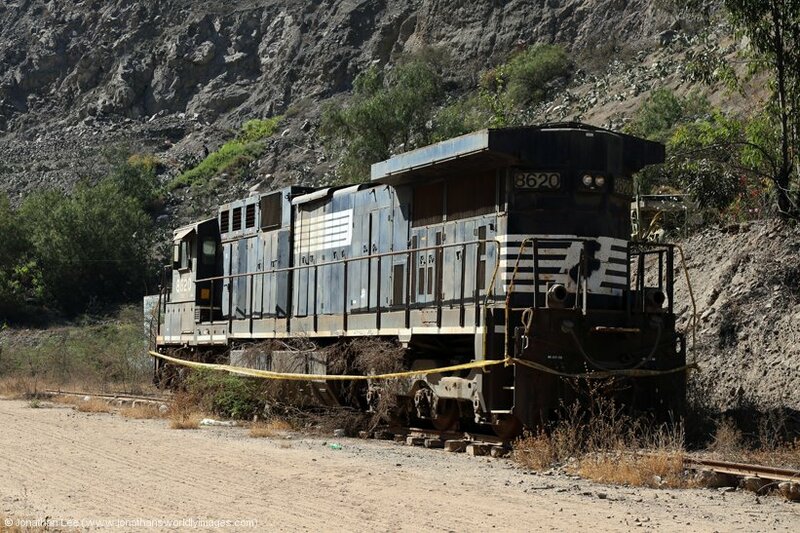 When we eventually passed by GE C30-7 #1001 at Surco, in the opposite direction to what I’d expected to do so, I realised that we’d actually spiraled round inside the mountain; which answered why I couldn’t trace the railway on ME Maps with the tracks being inside a very long spiral tunnel! The light began to fade in the later afternoon and the sun, when it was out was behind mountains anyway, which made it quite cool on the veranda. GE C39-8 #1021 was near Corcona with a freight and then San Bartolome was upon us, where GE #1016 was removed, turned on the turntable and run around to the opposite end of the train. Again we weren’t allowed off the train during this short stop, like we had been on the outward journey. Just as was so at Chosica where unfortunately our GE was replaced, again rather efficiently, by GM SD40T-2 #1024 for the run back into Lima. During the short stop I was more concerned about the demic locos in the yard and spotted FCCA MLW DL532’s #412 & 413 along with FCCA EMD JT26CW-2B #705, all looking a bit worse for wear! 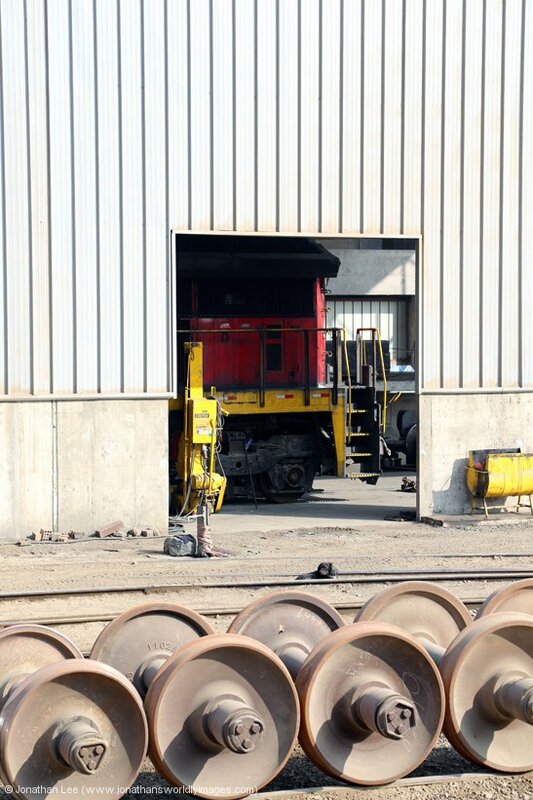 Also in the yard was another unidentified ex Norfolk Southern GE, also looking in a bit of a state. 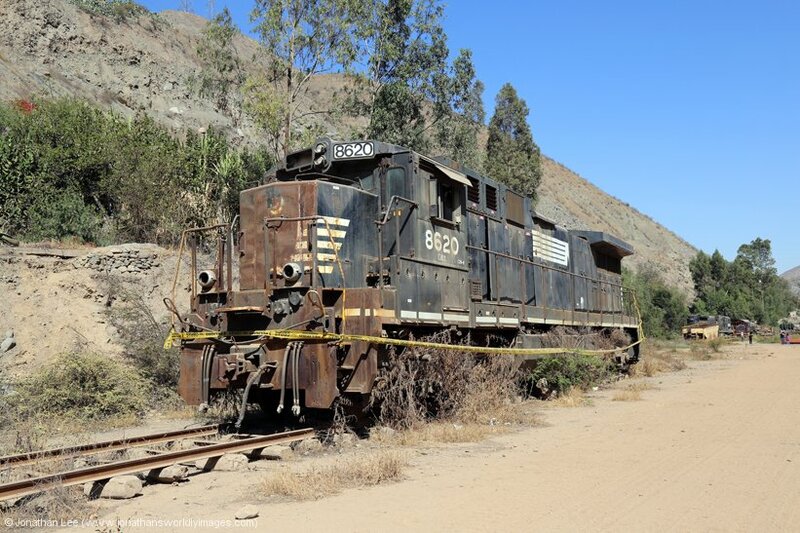 On the last leg of the run towards Lima we were served hot drinks and cans of pop but no food and the last train we passed was just outside Lima at Santa Clara with GM SD40T-2 #1023 paired with an unidentified GE. It was a good run into Lima, where the train initially arrived at 1856, 12h01m after departing Huancayo; unfortunately, we had to wait for the primera class to detrain and the baggage van to be offloaded before the train could be repositioned to allow us off, which took 15 minutes, by which time we could have already been at our hotel! I’d chosen the Hotel Inka Path for its proximity to Desamparados station to save messing about and it was only a 10-minute walk to it. The Plaza de Armas and main streets off it were very busy, which included the pedestrianized waking area right outside the Inka Path. The room we’d been allocated was, as luck didn’t have it, right over this area and literally across the way from the reception desk but the hotel staff were quick to give us a quiet room at the rear of the hotel. The room wasn’t big and was quite cozy, it was decorated with an Inka style theme and was a bit dusty round the edges but sufficed for the one night and would have done for more if we’d needed it. Food for the evening was at an Italian restaurant called Vermona, which we ended up finding by sheer fluke while trying to avoid the masses on the main drag. Trip advisor had showed it to be just off the Plaza de Armas, which couldn’t have been more wrong when we found it directly opposite the Pap John’s Pizza place we’d used earlier in the trip. It wasn’t busy, the staff were very helpful and polite, the food was good and it was cheap too. Our time at the Lima end of Peru came to an end as we headed back to the hotel and we’d be heading off to the more familiar climes of Cusco & Machu Picchu the following day with a taxi being booked at the hotel to take us to Lima airport at 0615. Due to the fact that the Hotel Inka Path is in a pedestrian only zone the security guy at reception had to march us down to the main road to meet our arriving taxi at 0615. There wasn’t an issue though as there wasn’t much traffic about so he was able to just pull up at the side of the road while we got in. The journey towards the airport went pretty quickly and we were on the outskirts within 15 minutes; it then took us another 15 minutes to get a couple of hundred yards to the airport entrance thanks to the fact there wasn’t any traffic control on the roundabout that leads to it! It was a complete and utter free-for-all and without police control only the brave and stupid got to where they needed to be and the rest just stood in the traffic. Thankfully our driver was alert and brave and we basically cut the whole roundabout up to turn into the airport, from the outside lane. While that might sound dangerous it was actually quite a fly move and one very well taken when the opportunity presented itself. Our driver told us that if we’d have arrived 30 minutes later we’d have probably ended up walking to the airport as traffic gets that bad that it hardly moves! 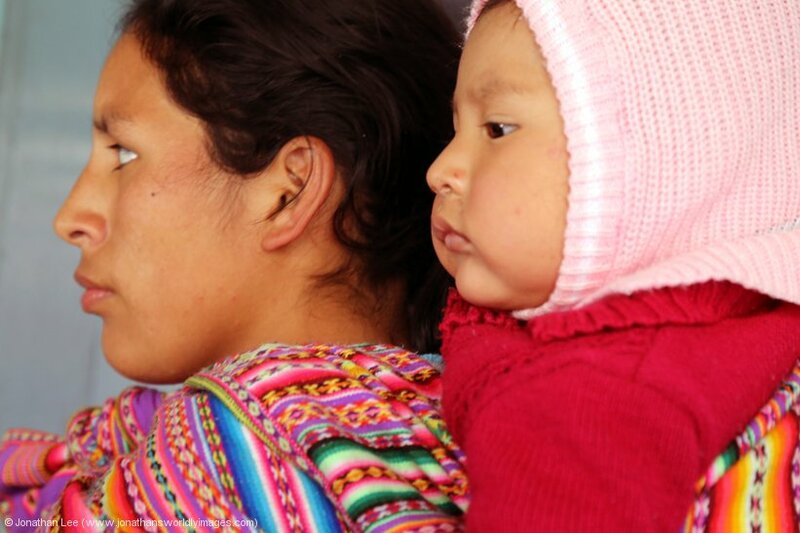 I’d picked Star Peru as the airline of choice for our internal flights between Lima & Cusco and vice versa, mainly as the flight times were decent. Unfortunately, though their hand baggage limits are smaller than most and we had to check our bags in at the check-in desk. Security at Lima airport was quite busy but it flowed well enough and we were soon airside for our retimed 0900 Lima – Cusco flight; which thankfully I’d found out via the e-mail Star Peru had sent two days previous; it had originally been a 0935 departure. The bad news surrounding the re-timing was that our return flight from Cusco to Lima had also been retimed but that was later, and a different story altogether! Bizarrely, when we sat down in the waiting area, we were asked if we wanted to board the 0800 Star Peru flight to Cusco, which obviously had space and was still boarding. Had we been hand luggage only we’d have been on it in a flash but as our bags had been checked in they would still be conveyed on the booked flight so we’d have had to wait for them at Cusco anyway; so we stayed put and endured a long wait as a result! At 0830 an announcement was made to tell us that our 0900 flight would be departing an hour late. There was no information at all after that and at 0945 I had to ask the desk staff where the plane was, to which I was told it would arrive at approx. 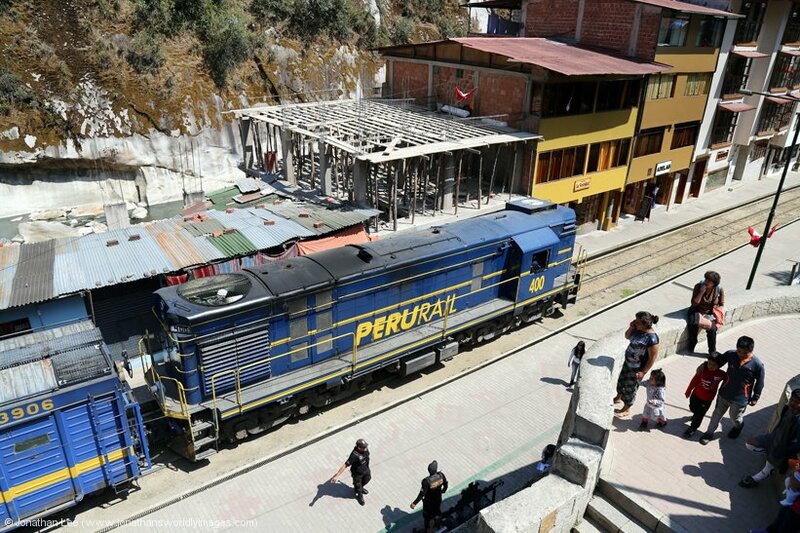 1000 and that it had left Cusco on its way to Lima. Soon afterwards we were all given free cheese/ham sarnies and a drink and at 1030 we were told the flight would be boarding at 1050; which actually started at 1110. By 1130 everyone was on the plane and when we were running down the runway, some time later after I’d had a snooze, I actually thought we’d just landed at Cusco but Danielle informed me that we were just taxiing to take-off after sitting on the runway the whole time! So our flight experience with Star Peru, who had retimed our flight early and given us less time in bed, was basically the pits! We took off 3h05m late and landed 3h07m late and as luck didn’t have it there is no law in South America that insists airlines compensate passengers over 3 hours late so we just had to lump it, having lost most of our afternoon as a result too. What this did do though was set the alarm bells off for our return flight to Lima, which after the retiming only allowed 2h05m from arriving at Lima to departing on our flight home to London, which would also involve having to collect our bags after checking them in! There was some thinking to do there…..
As the carousel for our bags was right next to a Peru Rail desk at the exit of Cusco Airport I collected our pre-booked Peru Rail tickets while we waited, which itself took a good 15 minutes as we had quite a few and the printing seemed to be taking an age. 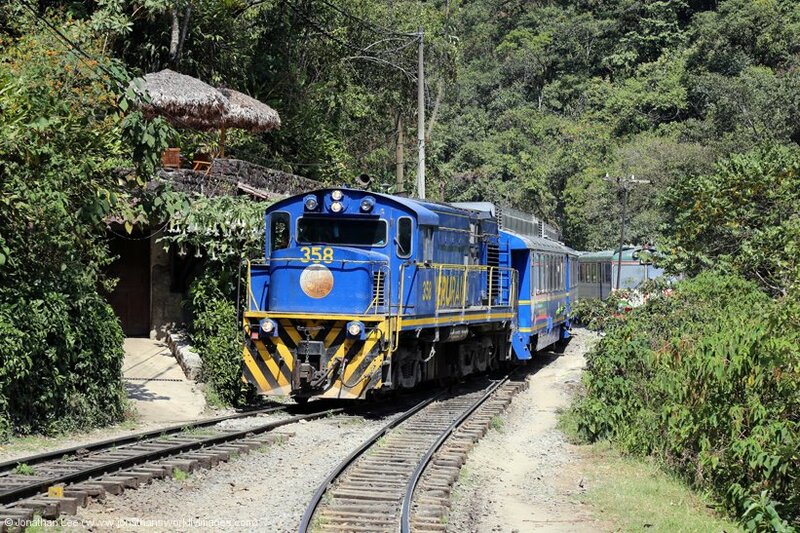 It didn’t help that the woman behind the counter couldn’t quite understand why we were making numerous journeys on their trains to Machu Picchu as opposed to just one return trip like normal people do! 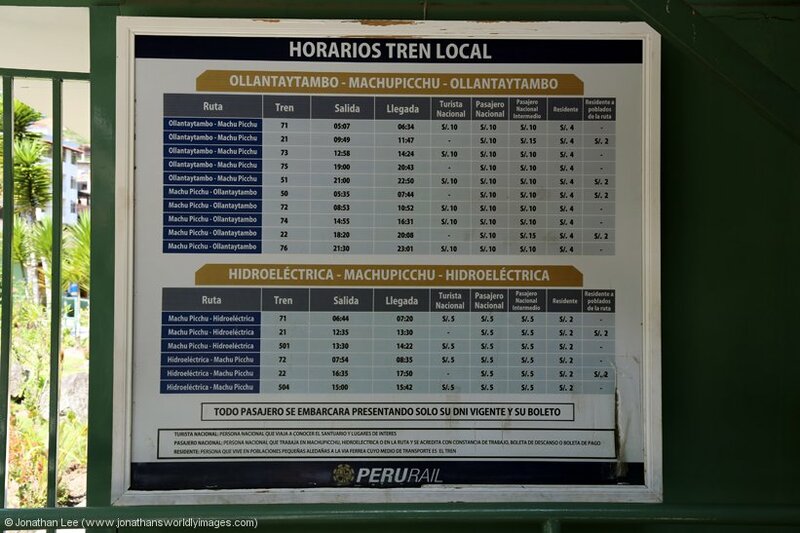 Once the tickets were printed I asked about train times to/from Hidroelectrica as they weren’t advertised on the Peru Rail printed leaflets this year. 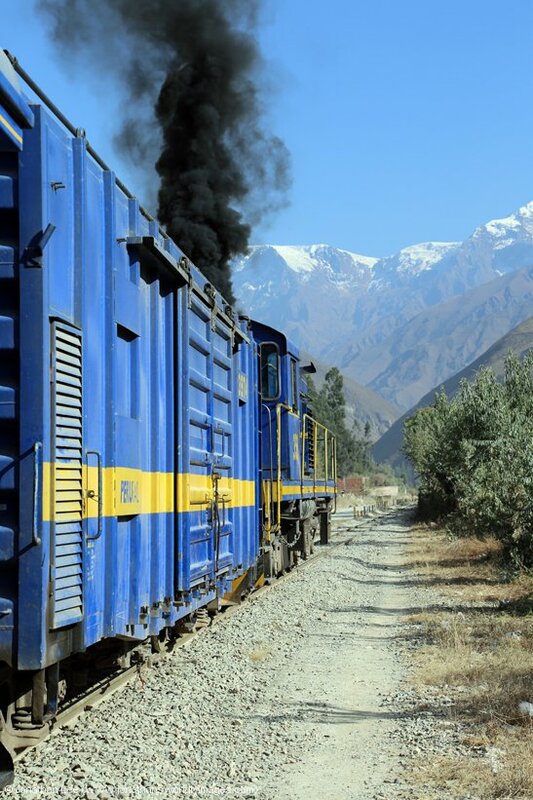 I was handed them on a post-it note and then advised to check them nearer the time as there was an impending strike on 3rd & 4th August that would probably affect trains running to/from Cusco and/or Machu Picchu. 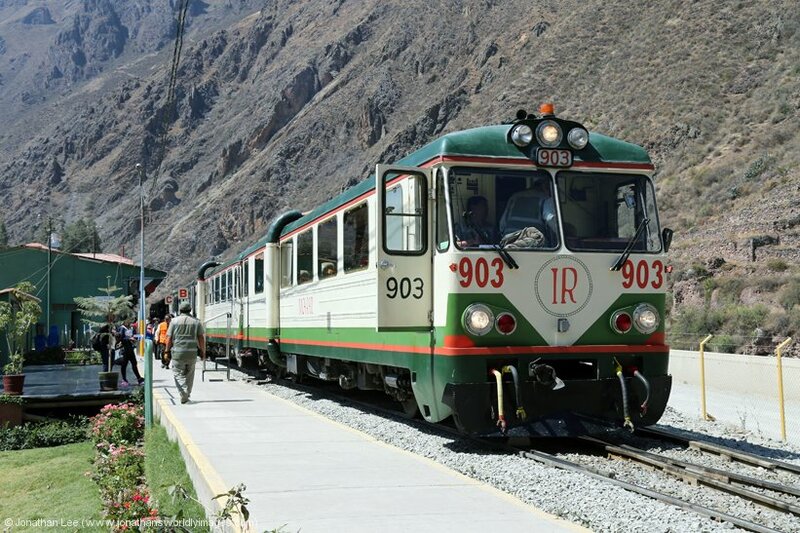 Quite why she decided not to mention it when printing my tickets out with both 3rd and 4th August on them I don’t know but she advised us to check later in the Peru Rail office in the Plaza de Armas in Cusco as the details should be finalized by about 8pm that night. 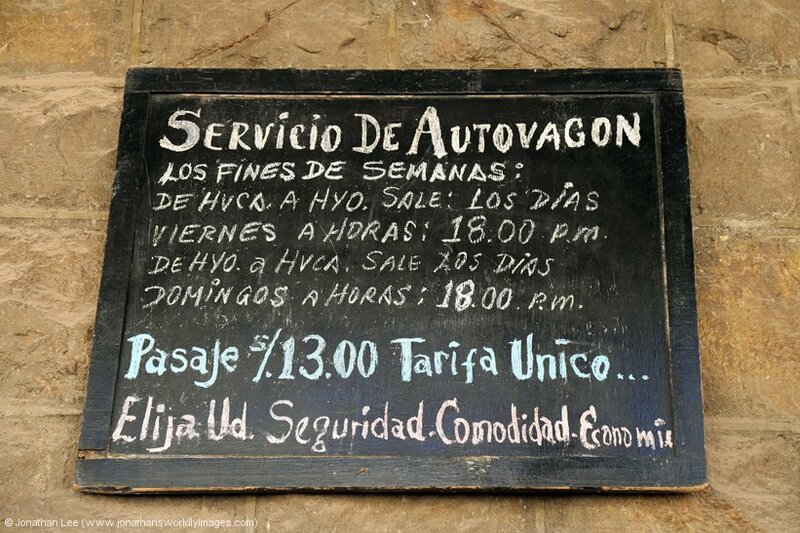 We’d arranged a pick-up, which was complimentary, with our hotel in Cusco and the guy with a sign was waiting outside the airport doors. I’d already rang them to say we’d be late but when we were en-route back to the hotel, during the 15-minute journey, something the guy said gave me the impression they’d been waiting for us over 3 hours. Long story short, we eventually found out that the hotel I’d rang had been the Tierra Viva Plaza as opposed to the Tierra Viva Centro. The number on the booking.com reservation had been wrong and the Centro staff told us that the Plaza often rang them to say they’d had calls for them; well now they knew why and said they’d get it rectified with their central office in Cusco. At check-in the staff couldn’t have been more helpful at the Tierra Viva Cusco Centro and it was very relaxing with tea etc being available while we waited for our documents to be processed. The room we were given was small and compact but of the high standard we’d come to expect from Tierra Viva hotels. It had all the mod-cons, toiletries and free WiFi and hot drinks were always available from reception. 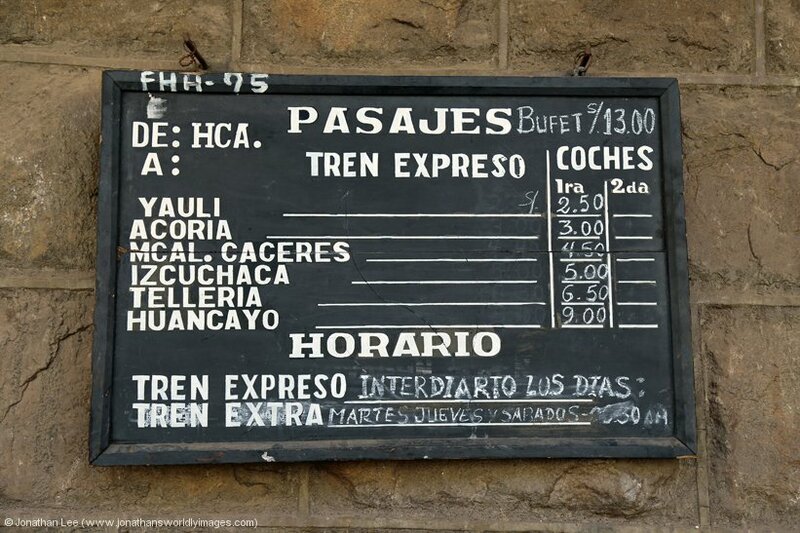 While we got settled I took the time to arrange transfers to/from Cusco Poroy station which is randomly 25 Soles out and 30 Soles for the return journey. 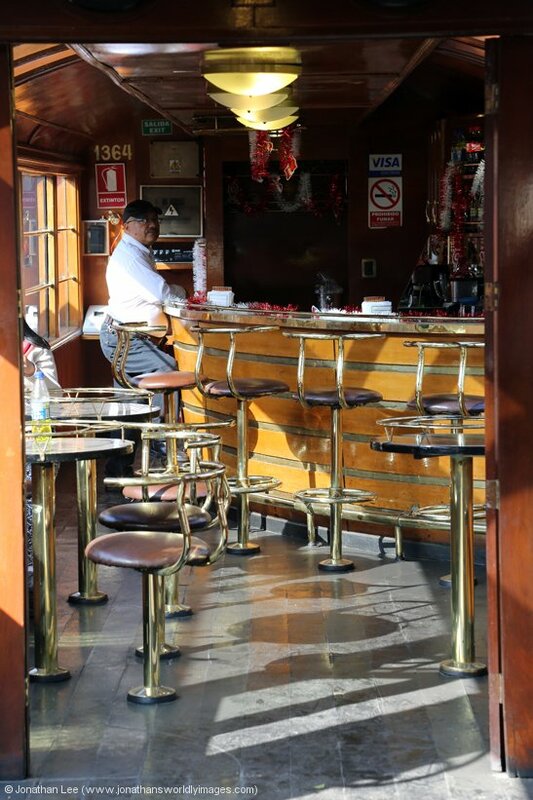 As our afternoon had been taken from us by Star Peru all we could really do was take a stroll into town and our first port of call was the Don Marcello restaurant, which is at the back of the Plaza de Armas to the right of the Cathedral. We’d used it a few times on our previous trip to Cusco and it seemed like nothing had changed when we walked in, including most of the staff. After a good Lomo Saltado we headed straight for the Peru Rail office on the opposite side of the Cathedral and were ultimately told that they didn’t know about the details of strike but would have the full detail by 8pm. 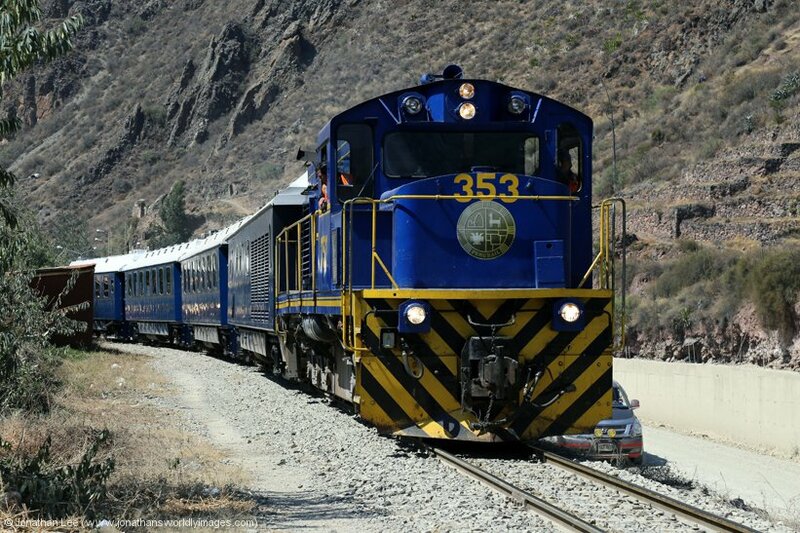 They could tell us that it was likely to only affect trains between Cusco & Ollantaytambo though but weren’t 100% certain by that point. To pass the time we had a walk round the Plaza de Armas and were going to have a look round one of the churches but both had big signs up that prohibited photography inside so we didn’t bother. It was a nice sunny day and the Plaza was traffic free, probably due to the aftermath of the Independence celebrations? A slow walk back to the hotel, via the closed Cusco San Pedro station, had us walking by the market area and down local streets for local people, which were lined with all sorts of things being sold. The unsightliest of which was the bucket of cow heads left in the middle of the pavement for all to walk around, which made the freshly plucked chicken bodies hanging off tables look almost pleasant! 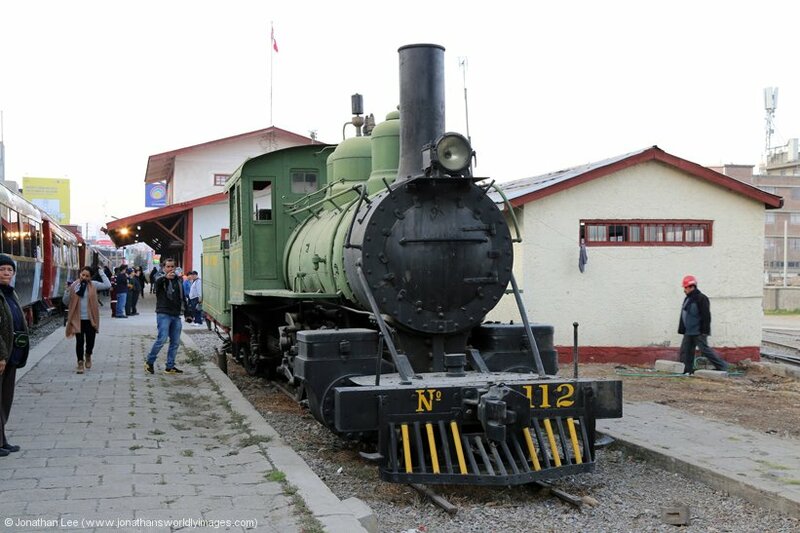 Later that evening I took a walk down towards Cusco Wanchaq station to watch the Andean Explorer arrive from Puno. 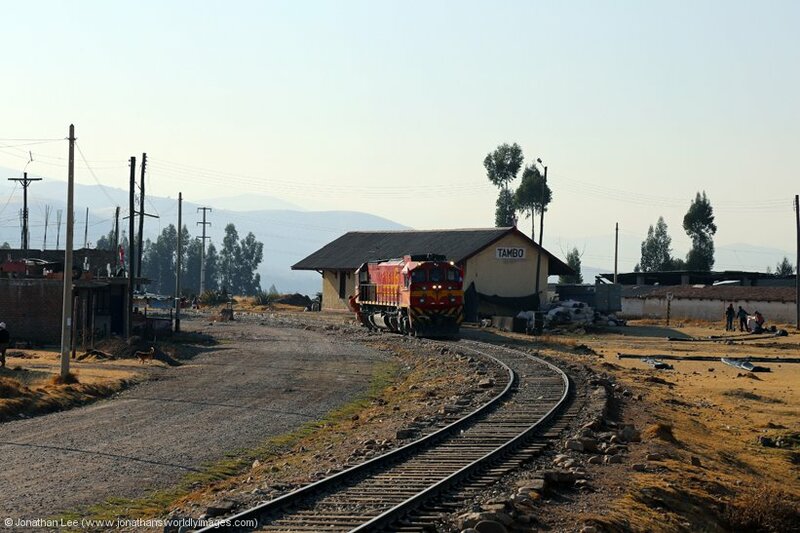 It was dark when a track machine rolled by, which always precedes the train, and I was surprised when Peru Rail MLW DL560 #654 rolled by soon afterwards; arriving a couple of minutes early with Peru Rail’s Train 19 0800 Puno – Cusco Wanchaq. I didn’t know it at the time but the two couples we’d last seen on the Nazca Lines flight were on the train and we met up again at breakfast the following morning as they were in the same hotel as us! Back in the Peru Rail office in the Plaza de Armas that night there was a bit of a wait while people got their tickets sorted out and when it was our turn the woman serving us confirmed that the strike was taking place and would result in trains between Cusco & Ollantaytambo being cancelled on the 3rd & 4th August. Tickets for such trains would come with a refund on the affected section, which amounted to $8 or $9 depending on type of ticket. Forward movement to/from Cusco would then be at the individual’s expense and Peru Rail basically wiped their hands of any accountability at that point and thought that giving people a small refund, which is about 1/10th of the ticket price, for what was essentially half of the journey, and then making everyone make their own way by road between Cusco & Ollantaytambo was acceptable! 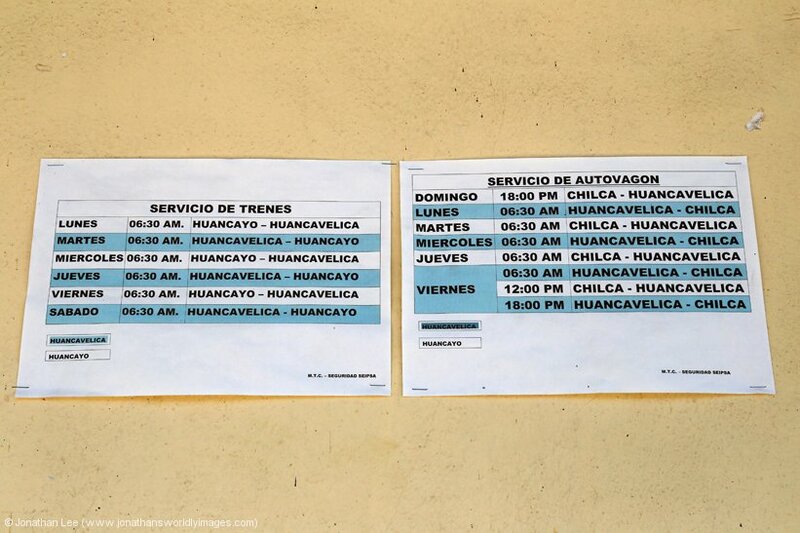 When I asked for a copy of the amended train times for services on the affected days I was told I wouldn’t be able to read it as it was in Spanish; when I told the woman I could read numbers she wasn’t impressed and basically threw the paperwork at me and the shutters went straight up. There’s nothing like good customer service is there? What I didn’t realise at the time, nor did Mrs. Miserable tell me was the fact that trains booked to run back to Cusco on the 4th would run all the way back through to Cusco and wouldn’t be affected at all. 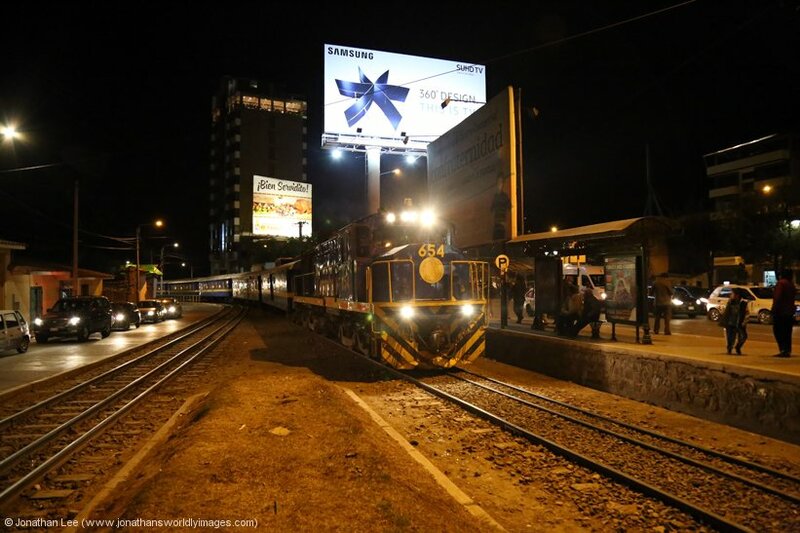 I figured this out over the following days when reading back through the e-mails that were sent out later that night by Peru Rail to all affected people. 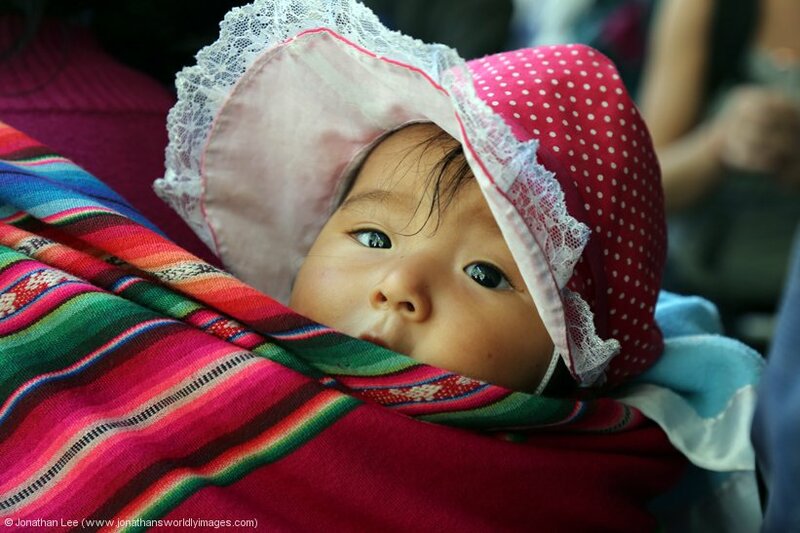 We were of course returning to Cusco on the 4th……. Breakfast was served early in Cusco hotels as people seemed to be up and out on their trips early. The two couples from Colchester, which had passed by me on the Andean Explorer the previous night, were in the breakfast room at the same time as us and we had time to catch up on what each of us had done since last meeting at Nazca. 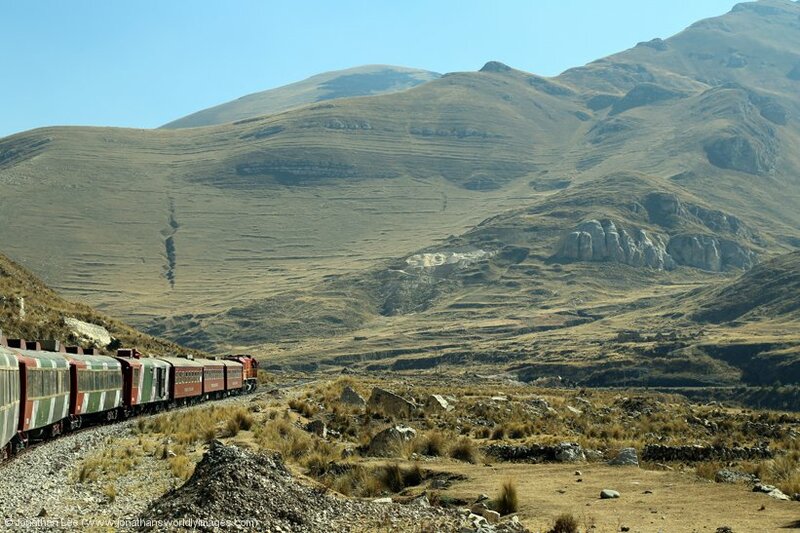 It turned out they were booked on the same train as us to Machu Picchu and had also booked a taxi to Cusco Poroy for a similar time. When neither ours nor their taxi turned up at the allotted time discussions in the hotel reception, with the staff, soon got heated and the guy seemingly coordinating things just walked off and left the others to it. Whether they’d forgot to book them or the taxis hadn’t turned up remained to be answered but we eventually left 10 minutes later than planned and the other four were 10 minutes behind as they needed a bigger taxi for all their gear as well. It sounds like they had a good go at the staff before leaving as they just didn’t seem bothered by the stress they were putting on people at stupid o’clock in the morning; which was a shame as those checking us in the previous afternoon had been excellent. 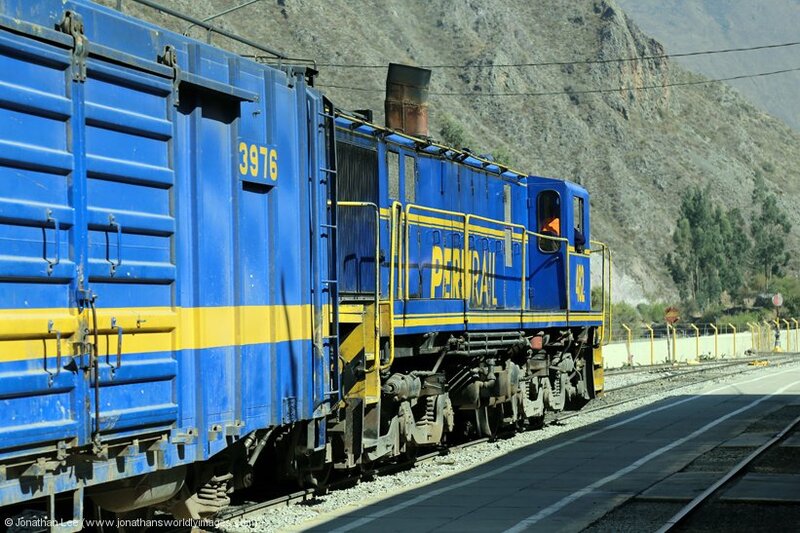 After zigzagging our way through a sleepy Cusco we spotted an Alco with one coach on the approach to Poroy station, which turned out to be Peru Rail Alco DL532 #356 and was the loco for our 0735 departure to Machu Picchu. Poroy station was very busy when we got there and it seemed to be more organized chaos than anything else. There were queues to check in for your train, all seemingly arranged by coach letters, which weren’t displayed very well at all. We were eventually allowed onto the platform at 0720 when #356 backed the stock in and were on the move at 0739 only 4’ late. 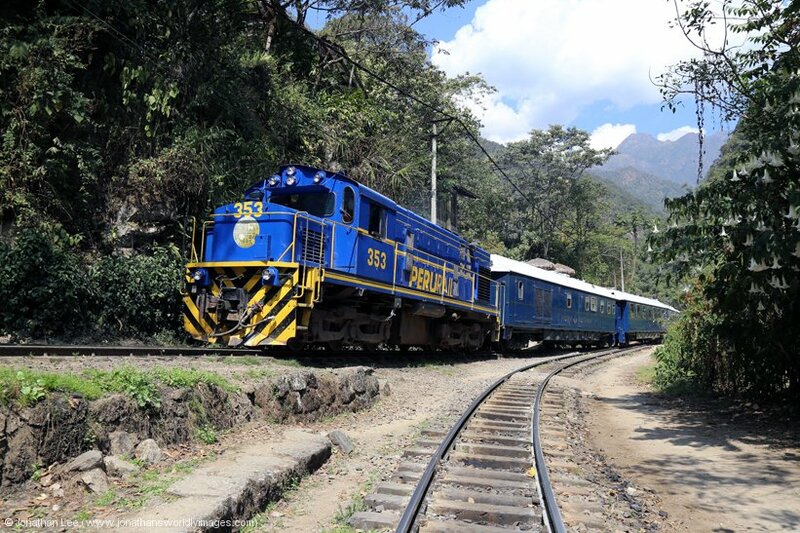 Alco DL532 #358 had turned up in the meantime and was shunting the stock together to work Train 203 0825 Poroy – Machu Picchu Vistadome train as we departed on our Expedition train. 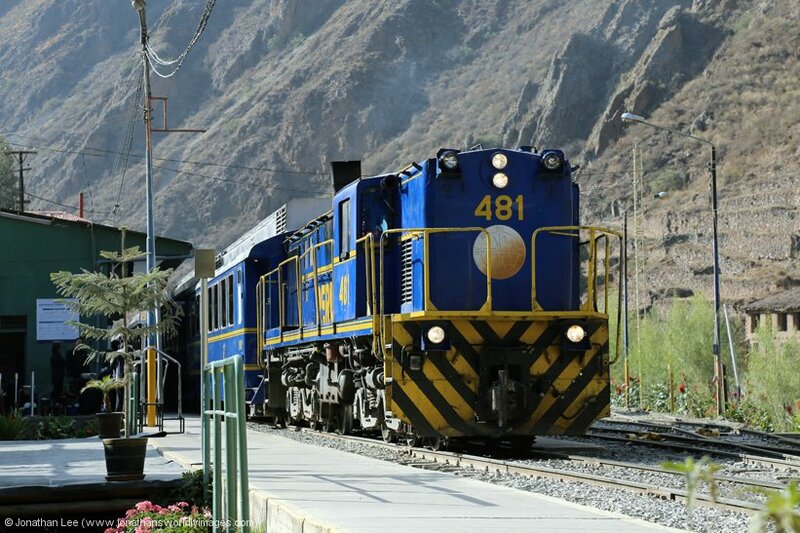 As we were going straight through to Machu Picchu I arranged with the on-board staff to be allowed off the train at Ollantaytambo to drop our big bags off at the reception of the Hotel El Albergue; which is actually on the station premises at Ollantaytambo. I had to be quick as the train only stopped for 3 minutes and it was a case of into the reception, bags dumped, name given (they were expecting me anyway) and a quick reservation made of dinner that night in the hotel’s restaurant. 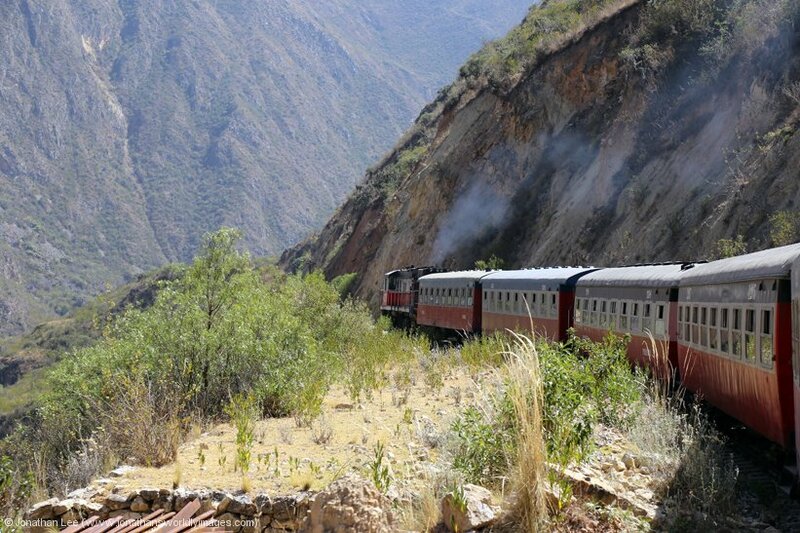 The journey to Machu Picchu is a decent one, following the river valley most of the way. 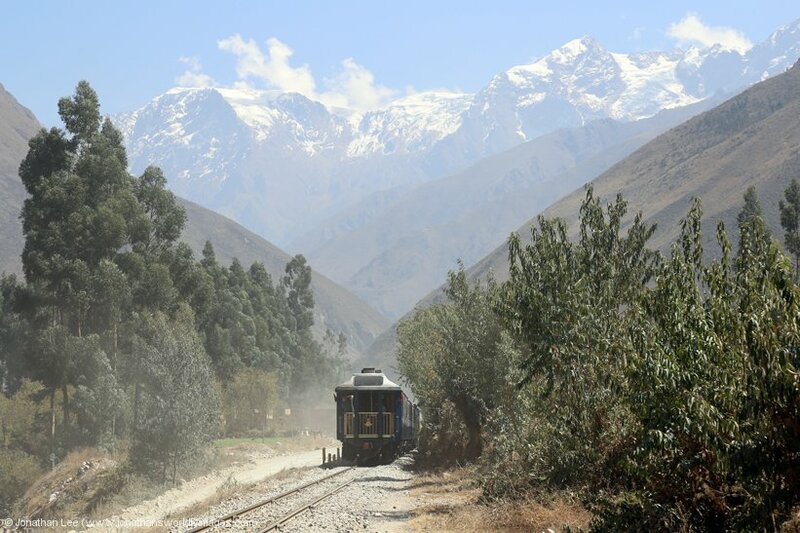 There are plenty of remnants of the Inca dynasty along the route if you keep an eye out and the train is used to drop people off at both the start of the 4 day Inca trail and further along at the start of the 2 day Inca trail. En-route we were served a drink and muffin, included in ticket prices, and treated to the sight of the staff then trying to sell books and other souvenirs from their trolley. 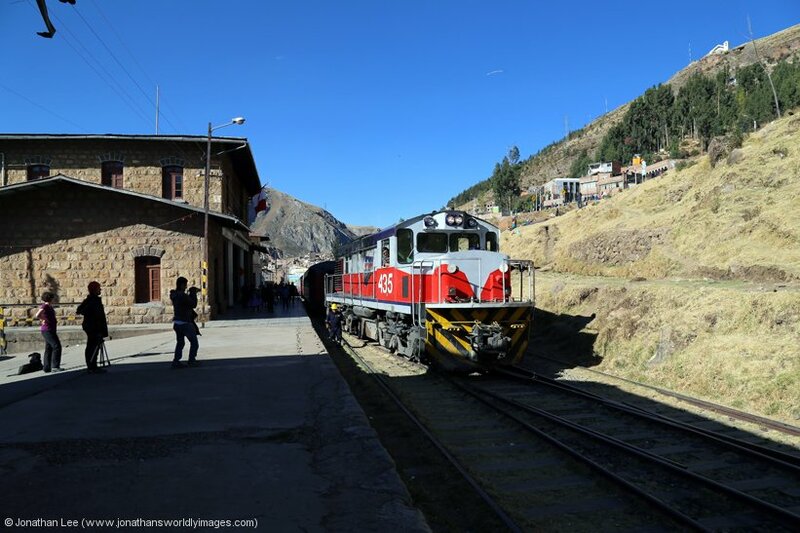 Along the way we crossed Peru Rail GM G12 #510 heading to Ollantaytambo with train 72 0734 Hidroelectrica – Ollantaytambo and then we dropped into Machu Picchu station at bang on 1100 vice 1052. 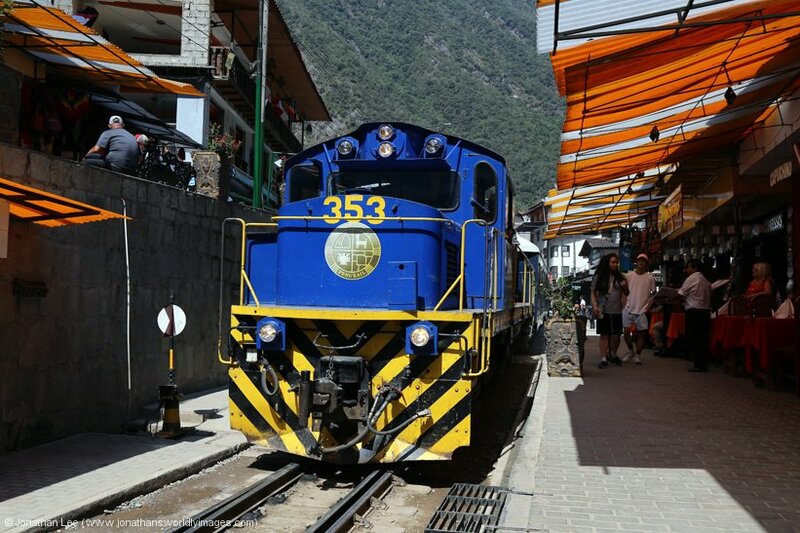 A DMU immediately departed with Vistadome train 302 1055 Machu Picchu – Ollantaytambo and in the station was Alco DL535 #487 acting as station pilot for the day. As we were at the front of the train we were right opposite the station exit and were among the first off the train. We knew where to head to get to the buses to Machu Picchu and thought we were doing ourselves a favour as we rushed off to get there before anyone else; that was until we clapped eyes on the massive queue that stretched up the road from the railway tracks, right back as far as the eye could see towards the top of the road! To put this in context on our previous visits to Machu Picchu in 2013 we’d got off the train, walked to the bus ticket booth, bought a ticket and got straight on a bus up to the ruins! Like the good citizens we are we headed up the hill towards the back of the queue and on the way, even though we didn’t know it at the time, got completely bowled by a guide who told us that the big queue was for bus tickets. The queue itself started to get a bit disrupted the further along the road we went, mainly due to the fact people were sitting around on the walls waiting for it to start moving. Their stupidity turned out to be our gain when chaos ensued as people jostled for their space as it started to move down the hill, so we just mingled in, probably about half way down it at that point. During our last visit to Machu Picchu the ticket booth for the bus tickets had been on the side of the road we were queuing on and it wasn’t until we’d been in the queue for about 20 minutes, and hardly gone anywhere, did I spot a couple of booths on the opposite side of the road with people queuing at them. Investigation revealed that they were in fact the ticket offices for bus tickets so I left Danielle in the main queue and went to queue for bus tickets. When I joined said queue there were probably 15 people in front of me and Danielle was about 100m up the road in the queue, that we now realised was just for the buses! 30 minutes later Danielle was opposite me at the other side of the road and the staff wouldn’t let he go any further in the queue as she had no ticket so basically she was told to leave it. In the meantime, I’d moved about 10m to her 100m and there were still about 10 people in front of me queuing for tickets. By 1200 we gave up as we were no nearer getting bus tickets, the issue being that tour guides were putting their folks in the queue and then queuing for bus tickets while they waited in line. The problem being they were buying 20-30 tickets at a time and each one required ID to get so the whole process took ages as a result. Our big issue as we gave up was time. I estimated it would have taken another 30 minutes to get bus tickets and about 45-60 minutes (which we found out the following day would actually have been more like 60-90 minutes) to queue for the bus. 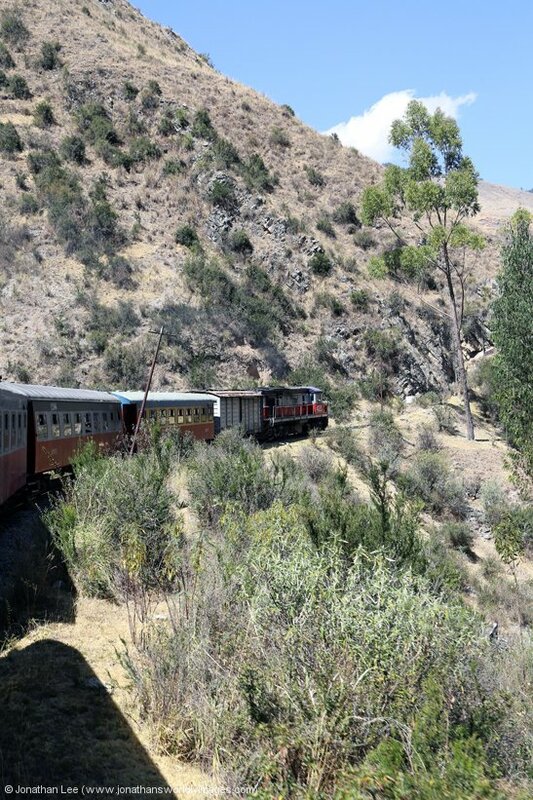 The journey up and back would be 30 minutes each way so that was a total of 2h30m at best from that point and we had to be on the 1622 train back from Machu Picchu to Ollantaytambo, which would only give us 60 minutes at most at Machu Picchu ruins and that wasn’t taking into consideration the fact that there’d likely be queues for the buses back down as well. To put it bluntly it was a complete and utter farce but all the guides do say August is the busiest month for Machu Picchu visits. Disappointed with how things had turned out we walked back to Machu Picchu station to buy tickets to Hidroelectrica but the queues there we big as well and as there wasn’t much time we basically gave up on the day and went back down to the main street to watch the world go by from the front of the Hot Springs II restaurant; where a good Chicken Milanese was served up. 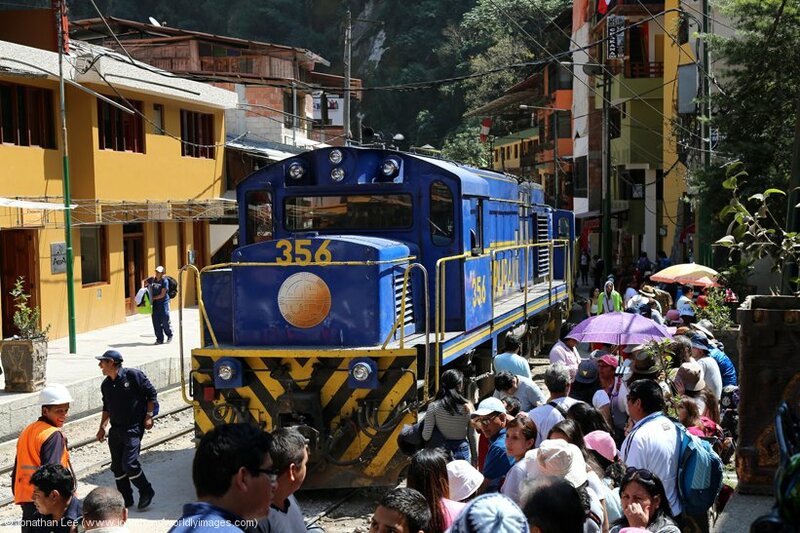 MLW DL535 #400 arrived in the street, just below Machu Picchu station, with Local train 21 0700 Cusco San Pedro – Hidroelectrica where rafts of people detrained and the train was then drawn forward to the Aguas Calientes station, just beyond the Hot Springs II restaurant, where the queuing masses were waiting in line to board for their journey to Hidroelectrica. 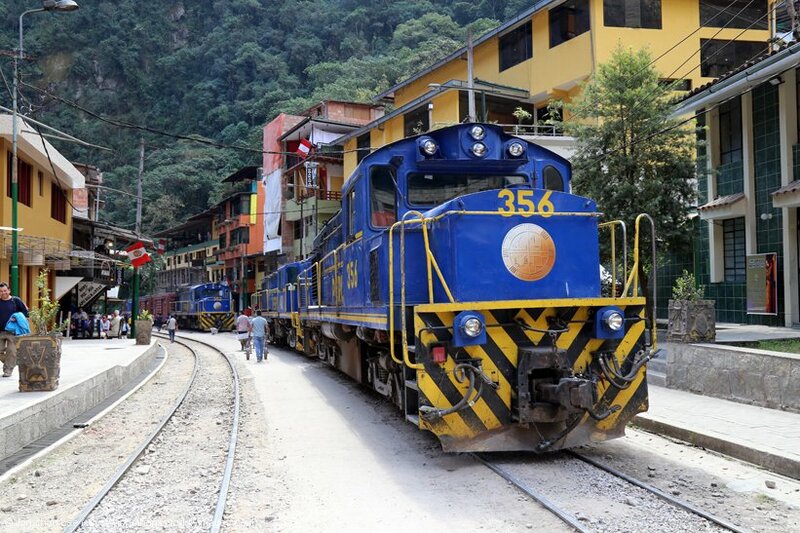 Alco DL532’s #’s 356 & 352 were stabled by Aguas Calientes with MLW DL535 #482 waiting their next duties and when Train 21 drew forward to Aguas Calientes there was already an expedition coach attached to the rear of the train, which usually gets attached at Aguas Calientes and is only available to tourists from there to Hidroelectrica; so it must have been attached while the train was offloading down below the Machu Picchu station? While the queue of locals for train 21 seemed initially well behaved, chaos soon began to reign when word spread down the queue that the train was full and nobody else could get on it! 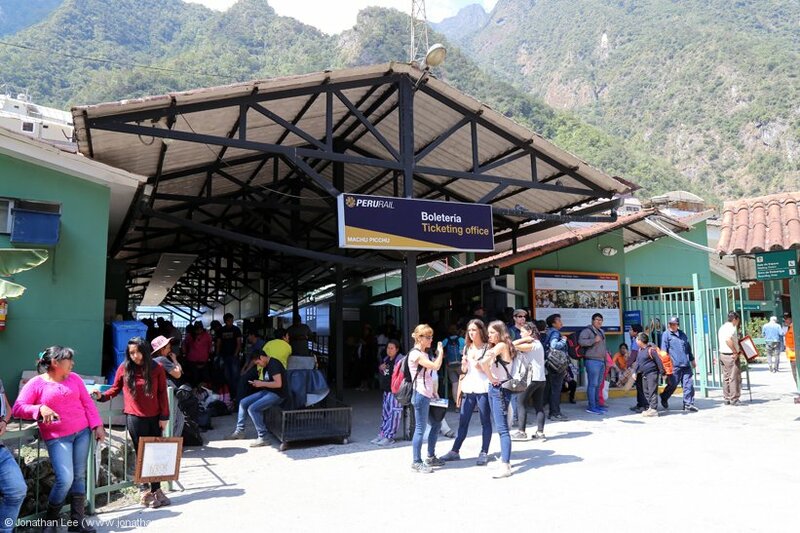 The queue soon dispersed and everyone started to head as quick as they could up to Machu Picchu station, carrying all their luggage with them; there was definitely no taking prisoners as people clambered over anyone in their way. 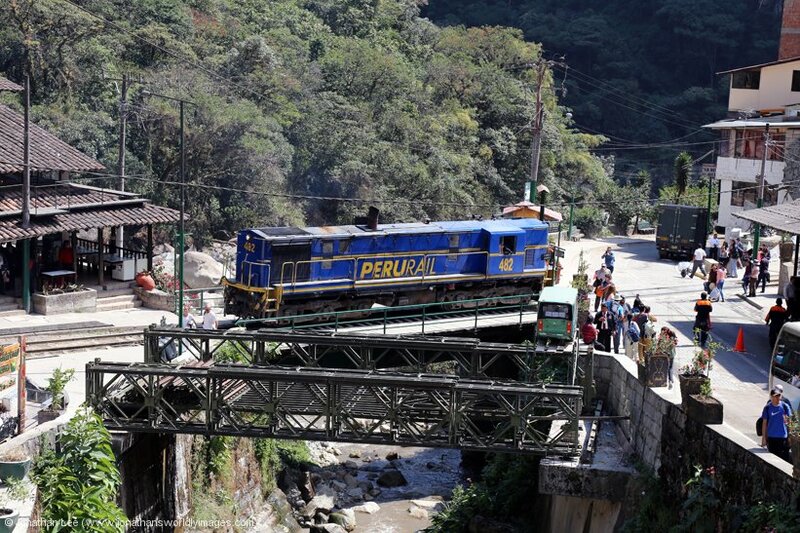 After lunch we took a stroll towards the Inkaterra restaurant to photograph Alco DL532 #358 arriving with Vistadome train 302 0825 Cusco Poroy – Machu Picchu and Alco DL532 #353 arriving with Hiram Bingham train 11 0905 Cusco Poroy – Machu Picchu. After which we went back to the station for a second attempt at getting to the ticket office and successfully managed to get tickets for train 21 from Aguas Calientes to Hidroelectrica for the following day but they wouldn’t sell us tickets for the return journey from Hidroelectrica and insisted we buy them at Hidroelectrica. 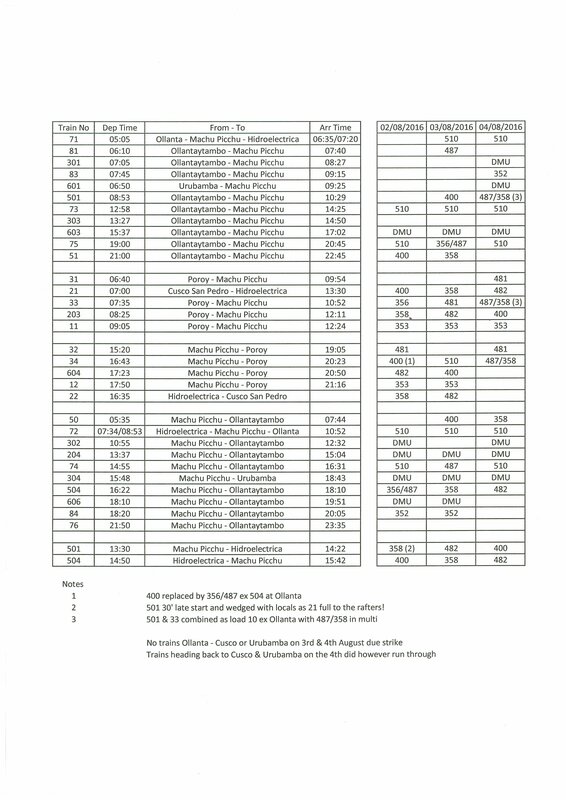 Since December 2013 tickets for the Hidroelectrica trains had gone up from $18 to a hefty $29 each, each way, for a measly 11km; now that’s proper Orient Express prices per kilometer! On our way back down towards the ticket booths for Machu Picchu bus tickets we watched Expedition train 501 1330 Machu Picchu – Hidroelectrica depart, with Alco DL532 #358, 30’ late, absolutely wedged to the gunnels with locals stood down the aisles of all the Expedition coaches; which is a bit hypocritical of Peru Rail as if that was the other way around and the tourist trains were full we wouldn’t be able to stand in the aisles of the local trains! Initial attempts to get bus tickets for the following morning to Machu Picchu were flawed but we were told to return in 30 minutes and then had no problem getting them. Tickets for the following day’s buses basically go on sale at about 1500 in the afternoon. At that point the queues going up to Machu Picchu had completely disappeared but they’d remained on the main street all of the time we’d been sat having lunch at the Hot Springs II, right up to about 1330 I’d say. Tickets for the bus are hardly the cheapest with a return setting an adult back $24 per person; but at least we had them for the following day now so could relax a little and walking back towards the station we bumped into the group from Colchester, who’d also just bought their bus tickets for the following day and told us they’d be in the queue for the buses from about 0715 and we could jump in with them if they saw us. After an unexpected relaxing but initially stressful day we had time to reflect on the day’s proceedings while milling about the place. 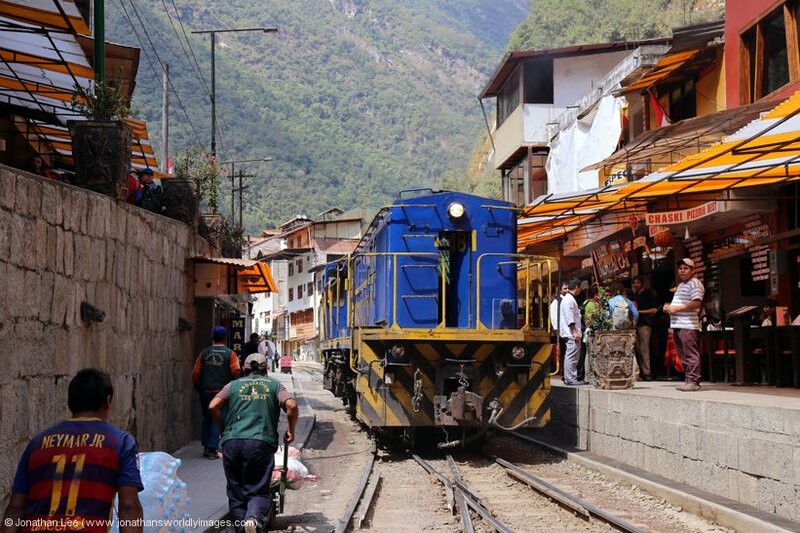 We watched Peru Rail GM G12 #510 arrive into the street below Aguas Calientes with Expedition train 73 1258 Ollantaytambo – Machu Picchu and head straight off to the wye to turn. 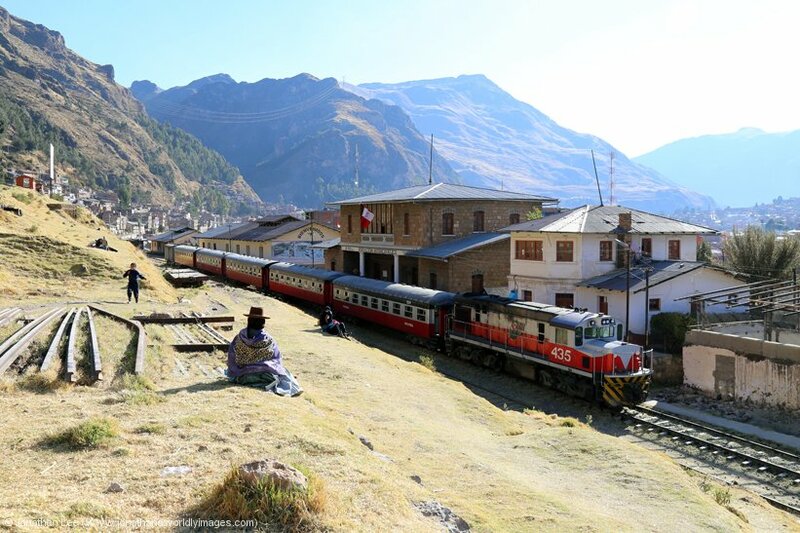 The stock off which was then shunted back to the Machu Picchu station by Alco DL535 #487 to allow GM #510 to drop back on after turning and then work back as booked with Expedition train 74 1455 Machu Picchu – Ollantaytambo. This practice for trains 73 & 74 is the norm as the loco only has 30 minutes to turn from arrival to departure and the whole process is done with some efficiency too. MLW DL535 #481 was being prepared in the station to work Vistadome train 32 1520 Machu Picchu – Cusco Poroy, which had been in the station since we’d arrive and its whole train had been covered over with tarpaulin most of the day. 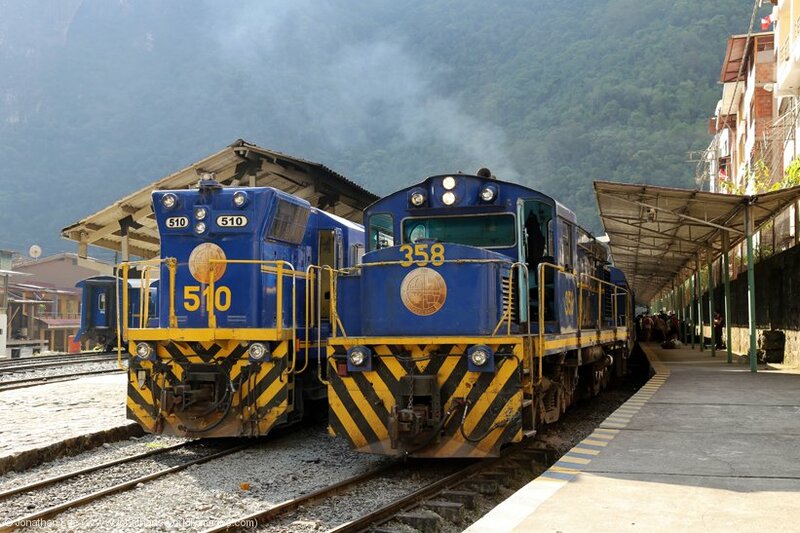 Meanwhile Alco DL532 #356 shunted some stock into the station and was then put together with DL535 #487 and when a multiple working cable was dropped on the running boards my attention was focused; I’d never seen a pair of Peru Rail Alco’s on the Machu Picchu line before. 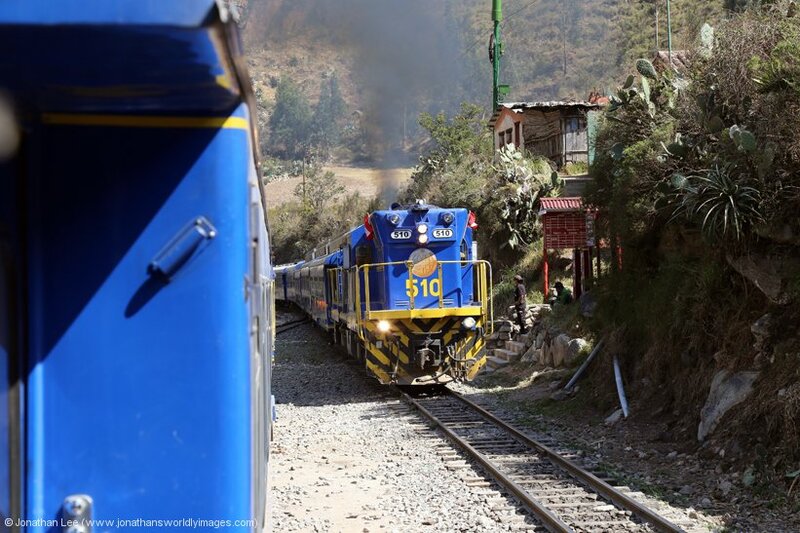 While we waited in the waiting area, with hoards of others, boarding commenced for Vistadome train 304 1548 Machu Picchu – Ollantaytambo, which was a pair of Vistadome DMU’s. 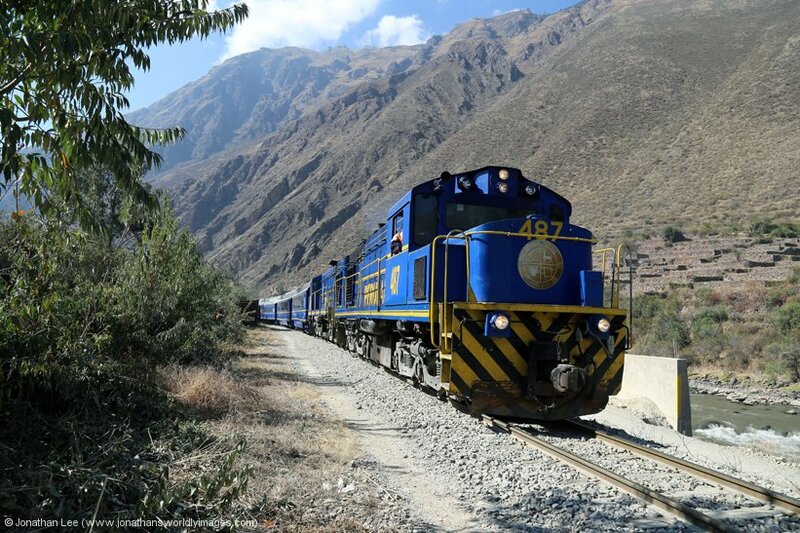 The stock to form our train back to Ollantaytambo was 20’ late arriving after its 30’ late departure to Hidroelectrica earlier. 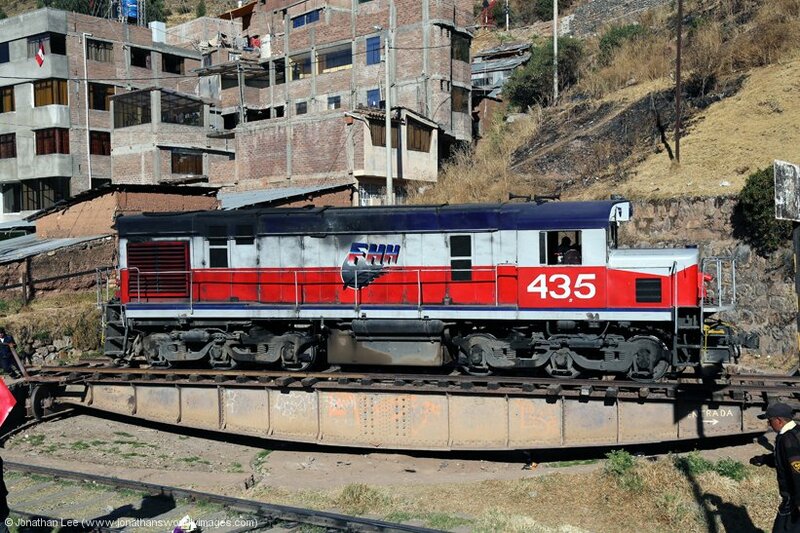 MLW DL535 #400 arrived with train 504 1450 Hidroelectrica – Ollantaytambo and was removed to shunt additional coaches onto the train, which is the norm for this train at Machu Picchu. 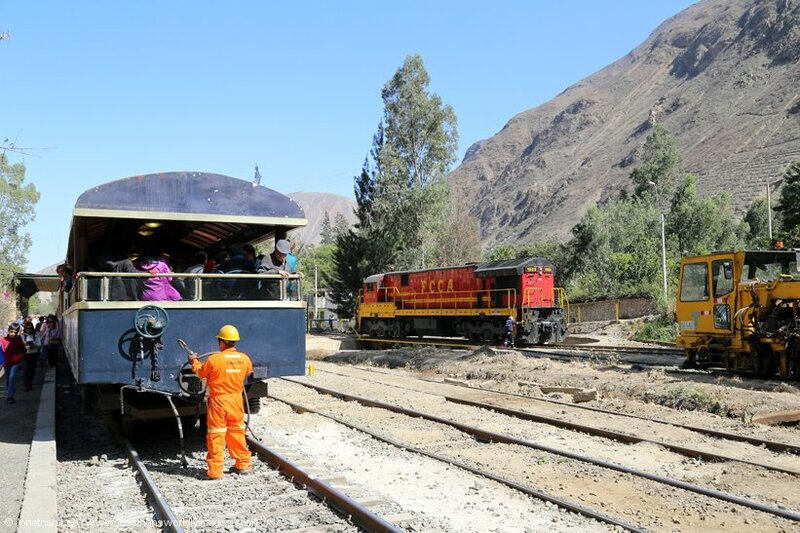 It was then removed a second time and shunted onto the stock to work Expedition train 34 1643 Machu Picchu – Ollantaytambo and the Alco pairing of 356/487 were dropped onto train 504 to work it forward to Ollantaytambo; which was a bit of a bonus. I soon figured out over the next couple of days that any train above load 6 had to have a pair of Alco’s, although I did see GM #510 with a load 7 set on its own! Either way a single Alco didn’t work more than 6 coaches on its own. 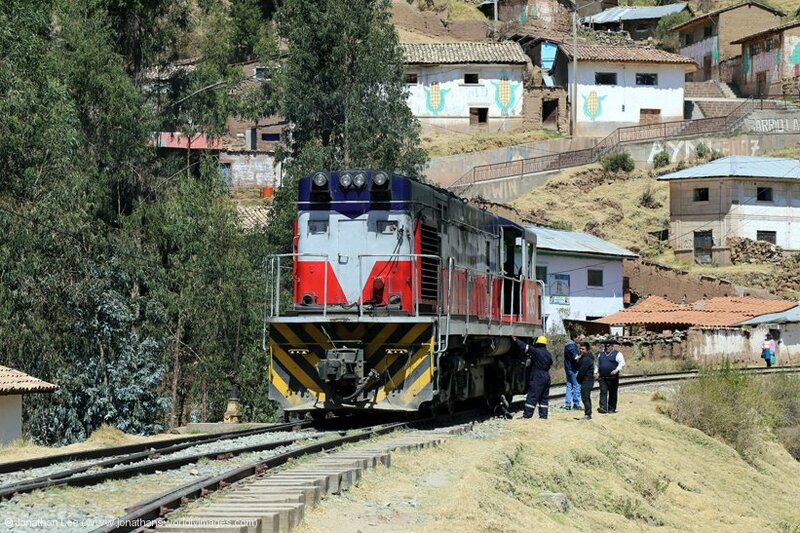 On arrival at Ollantaytambo 356/487 shunted their stock to the sidings then re-engined Expedition 34 1643 Machu Picchu – Cusco Poroy for the run forward to Cusco with MLW #400 remaining at Ollantaytambo to work back to Machu Picchu later that night with train 51 2100 Ollantaytambo – Machu Picchu, which has less than 6 coaches on it! 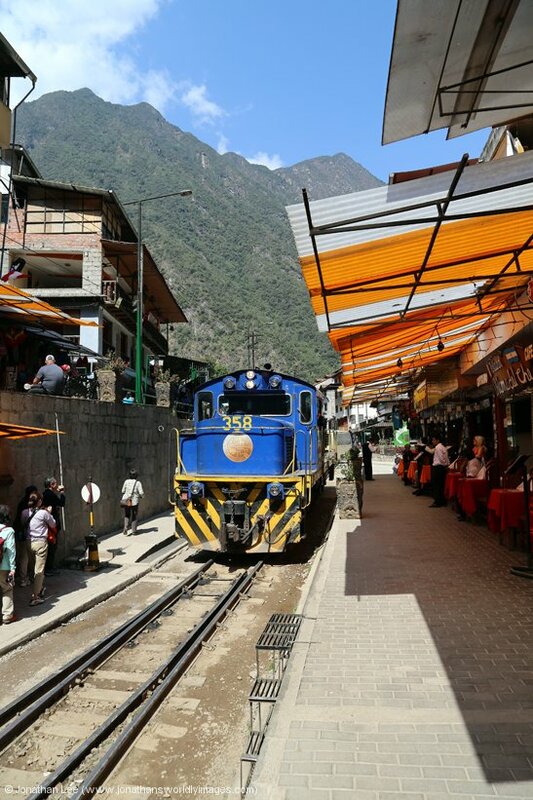 We checked in to the Hotel El Albergue while GM G12 #510 was being prepared to work train 75 1900 Ollantaytambo – Machu Picchu and the van behind it was being loaded by locals. We were given a room that overlooked the station platforms this time. It was clean, sizeable and had toiletries and WiFi, although the signal strength wasn’t that good. The bags I’d left that morning were already in the room and we even had a spare single bed in it to use as a dumping ground. The heater was put to use as well! 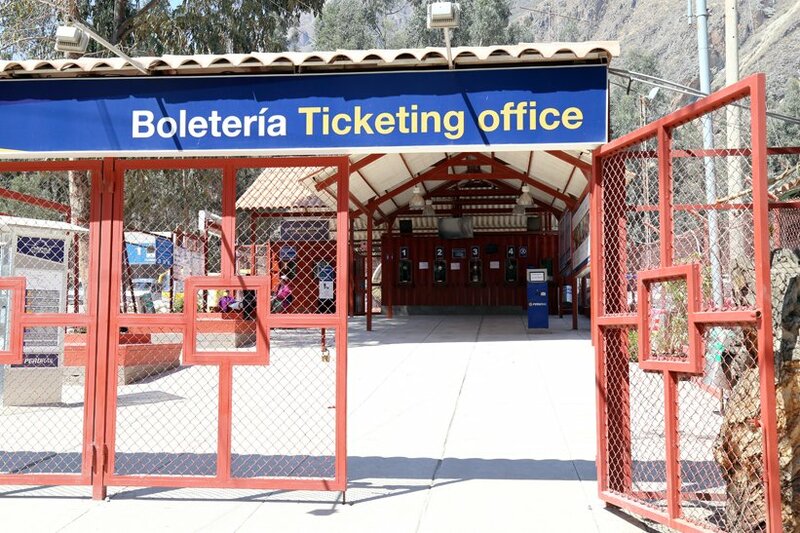 Before dinner I headed up the road to the Peru Rail ticket office, which is about 100m up the road directly outside the station, to try and change the Hidroelectrica tickets I’d bought for train 22 the following day to train 501 instead. This as MLW #400 had done 21 to Hidroelectrica for 504 back and Alco #358 had done 501 to Hidroelectrica for 22 back, so the move to get both locos in was 501 out for 504 back; unlike how it had been in December 2013 where the locos worked in and out with the same set of stock. 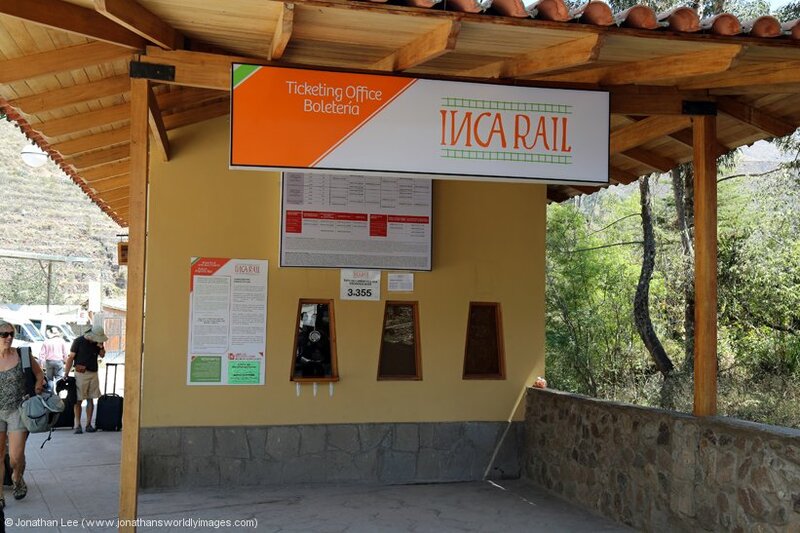 Unfortunately, the staff at the Ollantaytambo ticket office couldn’t change our tickets and insisted we had to do it at Machu Picchu the following day. 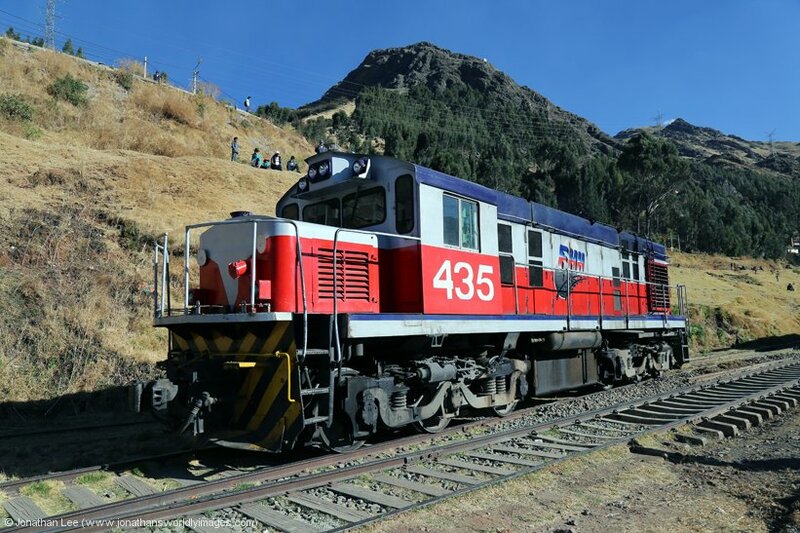 While at the ticket office I confirmed with them that Expedition train 34 on the 4th was running all the way back to Cusco Poroy as I’d only noticed earlier that day on the e-mail from Peru Rail that it was showing to. The El Albergue then allowed me to ring the Tierra Viva Centro in Cusco to rearrange our requested pick-up from Ollantaytambo back to Poroy. This was when we realised that the number on the booking.com printout was for the wrong Tierra Viva hotel in Cusco. I was soon given the correct number and the nice lady at the Centro remembered me and amended the pick-up to Poroy; which turned out to be a complete waste of time in the end. I requested a table in the outer area of the restaurant so I could spot trains during dinner and our request was granted. The food at the El Albergue is all grown around the hotel and picked daily. The menu at which is quite varied but also quite strange in that there’s nothing kind of normal on it. My pasta/chorizo was nice though and went down a treat. 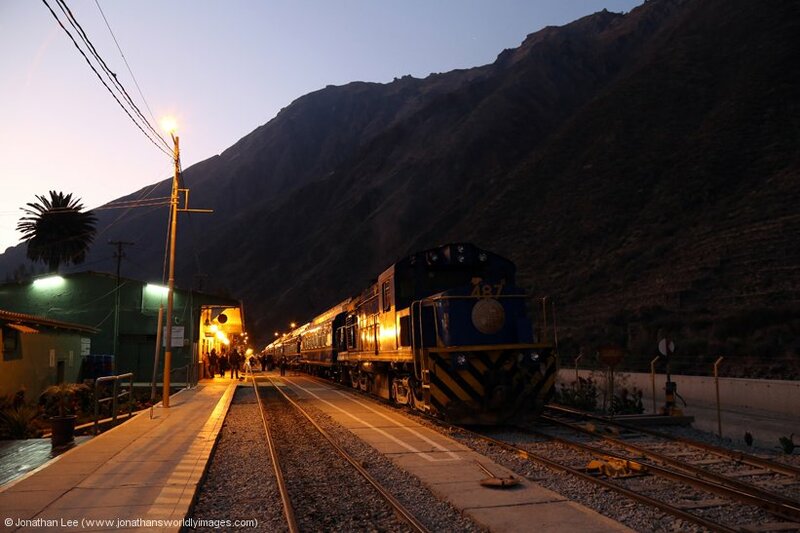 We made it to bed by 2100 that night, after a long day, and the shutters to the outside world were closed just as MLW #400 was departing with the last train of the night to Machu Picchu, train 51 2100 Ollantaytambo – Machu Picchu. We had a very rude awakening at 0403 as the phone began to ring beside the bed. When I answered, mainly to shut it up, I was advised that this was my 4am alarm call; which of course I hadn’t asked for so I thanked the person at the other end for disturbing us and attempted to get back to sleep! 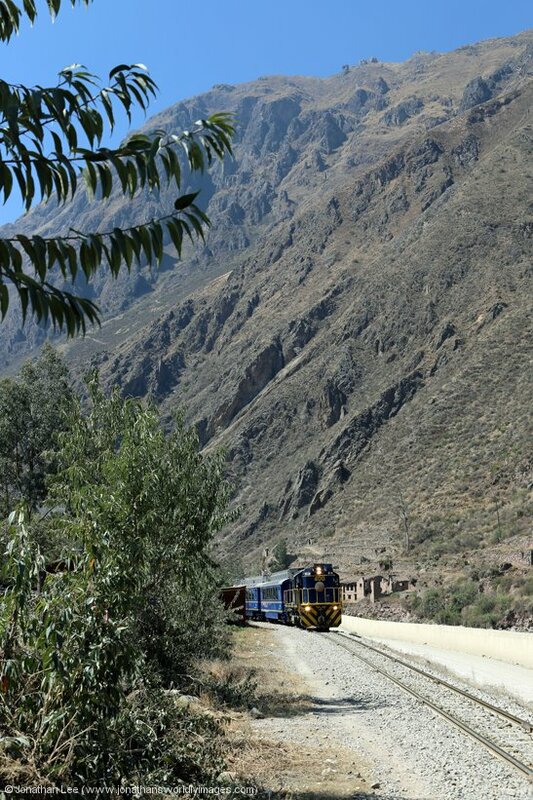 At this point I could hear the drone of a GM outside the bedroom window, which was quite pleasing as it meant that GM G12 #510 was doing train 71 0505 Ollantaytambo – Hidroelectrica; which seemed to be pretty much a solid GM turn anyway. 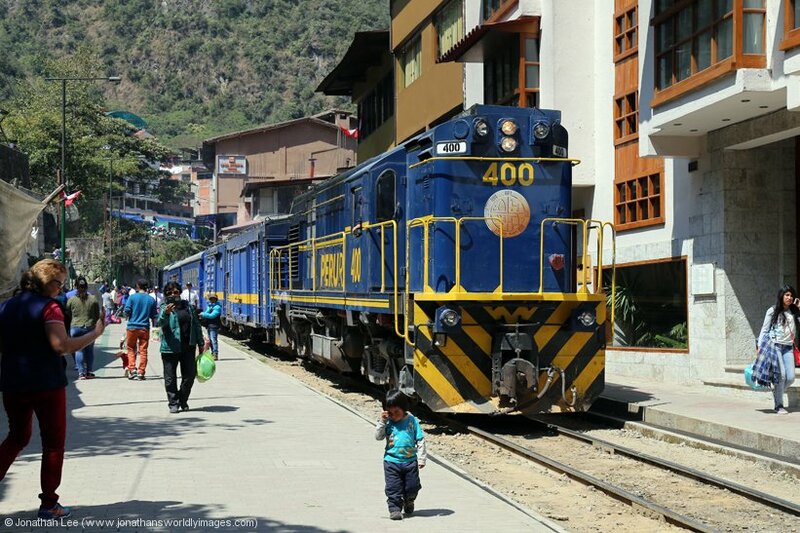 We were up at 5am anyway and heard #510 depart at 0505, before heading down to grab a bit of breakfast before our 0610 train to Machu Picchu. We were in the hotel’s breakfast room by 0530 and having initially asked if a carry out breakfast could be accommodated we were soon ordering food from the menu to eat before we departed; the answer being no! While sat minding our own business, and taking time to come around, the whole breakfast area was invaded by a group of people. Initially I assumed they were staying in the hotel and had come for breakfast but it then turned out that they were a tour group that had been deposited there by their tour guide. The normal café area, where we’d had dinner the night before by the platform, was already full so the guide appeared to have taken it upon himself to just move his group into the main restaurant area; which is reserved for guests. Words were ultimately had with the restaurant staff and a bit of an exchange of words soon started with the tourists as they were moved out of the restaurant; it did get a little heated and when one said “some people are just grumpy in a morning” Danielle just couldn’t contain herself and abuse got hurled in that person’s direction. The tour guide was also collared and told in no uncertain terms that I thought he was out of order and even more so that both he and the hotel staff thought it was acceptable to them move the group out to the seated area at the rear of the hotel, which is right below people’s hotel rooms, including ours! It was an absolute disgrace and they were made fully aware of what we thought. 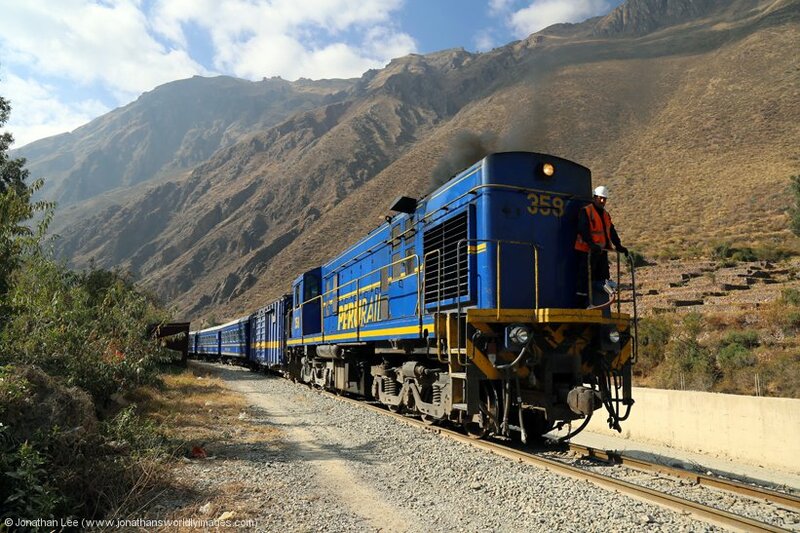 Having had a decent breakfast but had our morning karma rudely disturbed we boarded Expedition train 81 0610 Ollantaytambo – Machu Picchu, with Alco DL535 #487 purring away at the front, in plenty of time and the journey to Machu Picchu was as good and relaxing as they come. The orange muffin and Mate de Coca was welcoming on the way too but the queues on the main street for buses to get to Machu Picchu were about as welcoming as a needle in the eye! They were as big as the previous day and as we walked up the hill in an attempt to find the back of it, it actually seemed longer than it had been when we’d joined it the day before. Thankfully for us the Colchester’s kept to their word and when we came across them in the queue they welcomed us in with open arms. They’d been queuing since about 0715 and from the moment we cut into the queue it took us 50 minutes from arriving on our train to getting onto a bus at the front of the queue! We couldn’t have been more grateful and once we got off the bus 30 minutes later it would be the last time we saw them and bode them farewell as we entered the Machu Picchu site. 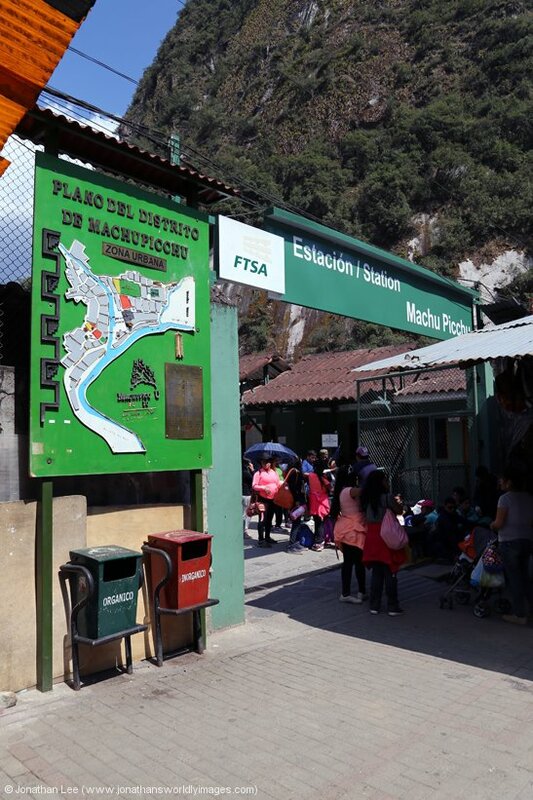 You must be in possession of an access ticket to Machu Picchu to get through the access point and passports are checked against the details on the tickets; this is assumed to be to prevent touts from buying up tickets and selling them on at ridiculous prices. They can be bought online and printed before you go, its not the simplest of websites to navigate and you have to then log back in to pay for your tickets after completing your booking otherwise the whole thing is cancelled after 24 hours! 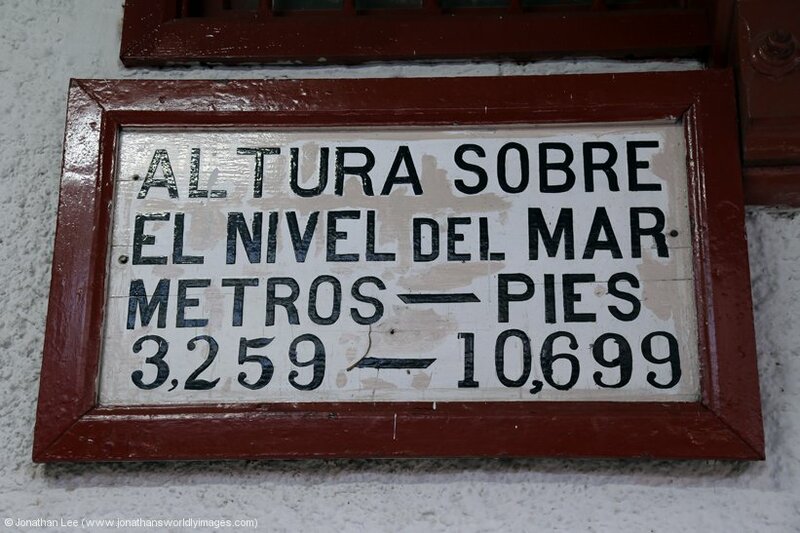 Still, it’s a whole lot better than buying it before you go up in Aguas Calientes. It was a nice morning and as the sun was already up it wasn’t as atmospheric as it had been on our previous visit but we had a nice relaxing walk around one half of the complex, avoiding the major tour groups that were being marched round and told things like “this is probably where…..” and “this was probably what….”. We actually ended up seeing a lot more of the place than we had on our last visit and from different perspectives as there are plenty of narrow walkways to get away from the masses in. While it seemed like an age our walk around Machu Picchu only lasted 90 minutes and we were safely back down at Aguas Calientes by 1045 having had a hassle free trip up and back. 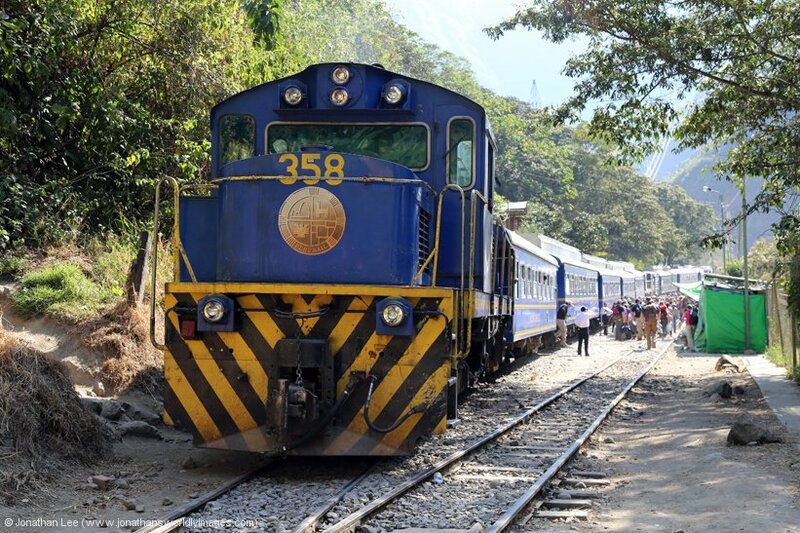 The first task of the morning was to head to the booking office at Machu Picchu and get the Hidroelectrica tickets changed from train 21 at 1230 to train 501 at 1330. While the queue wasn’t massive at the ticket office it was certainly taking its time to go down; in fact, for the whole 20 minutes we stood patiently the same people were occupying both open booking windows. Concerned that the time it was taking would result in us not getting to the window before train 21 arrived I managed to blag my way into the station premises and find someone that spoke English to point my issues out to. He went into an office, brought someone out and the result of his conversation with one of the ticket office staff, through the station side windows, was his front window being closed and our tickets being changed straight away. 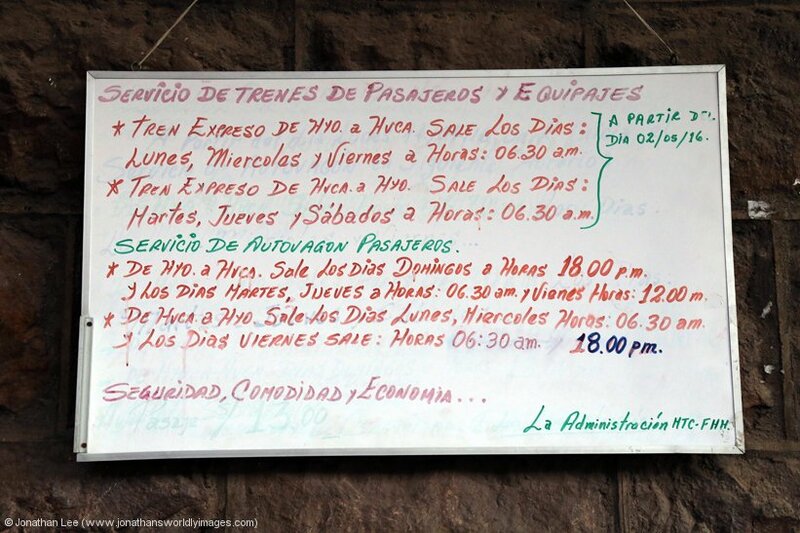 Having sorted the tickets, we then had time for lunch before heading to Hidroelectrica and spent the late morning and early afternoon vegetating at Hot Springs II by the Aguas Calientes station. Waiting their next turns in the street were Alco DL535 #487, which was blocked in by Alco DL532 #352 and a coach. 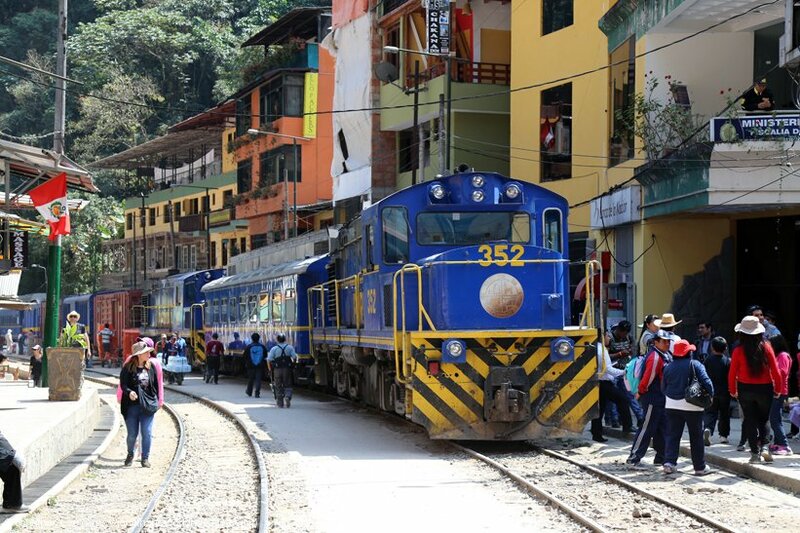 The latter was used to shunt said Expedition coach onto the rear of Local train 21 0700 Cusco San Pedro – Hidroelectrica when DL532 #358 arrived with it. While the queues for train 21 seems as big as they had done the previous day everyone managed to get on board by departure time and even the Expedition coach at the rear was quite well loaded when the train departed. 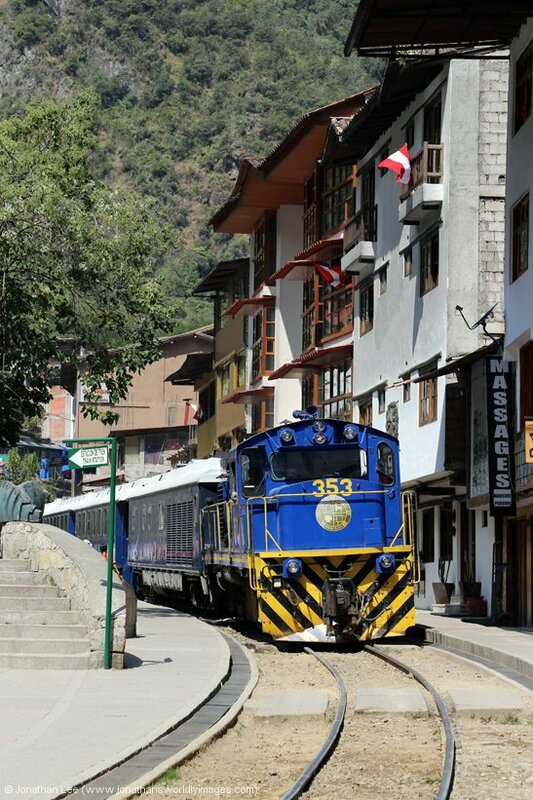 MLW DL535 #481 ran through Aguas Calientes to the wye and return shortly afterwards, having arrived into Machu Picchu with Expedition 33 0735 Cusco Poroy – Machu Picchu, which had started at Ollantaytambo because of the two-day strike. 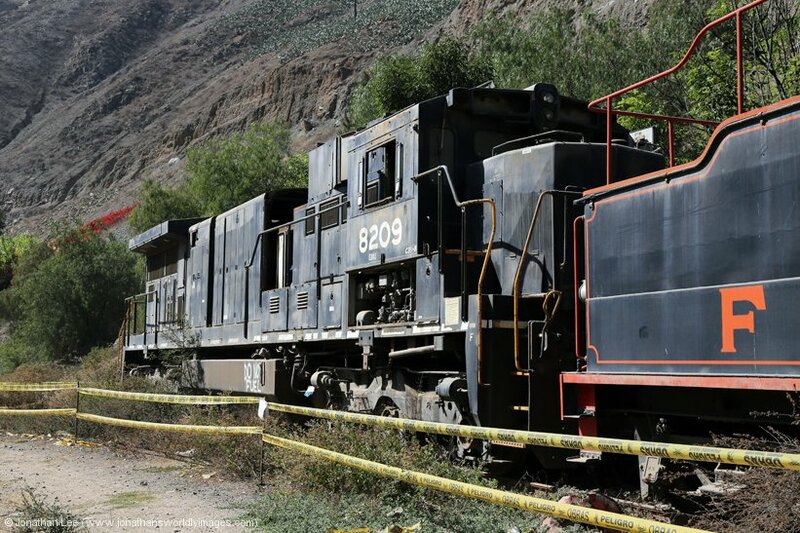 Alco DL532 #353 was soon on its heels through Aguas Calientes with the empties off Hiram Bingham Train 11 0905 Cusco Poroy – Machu Picchu, which had also started at Ollantaytambo because of the strike. 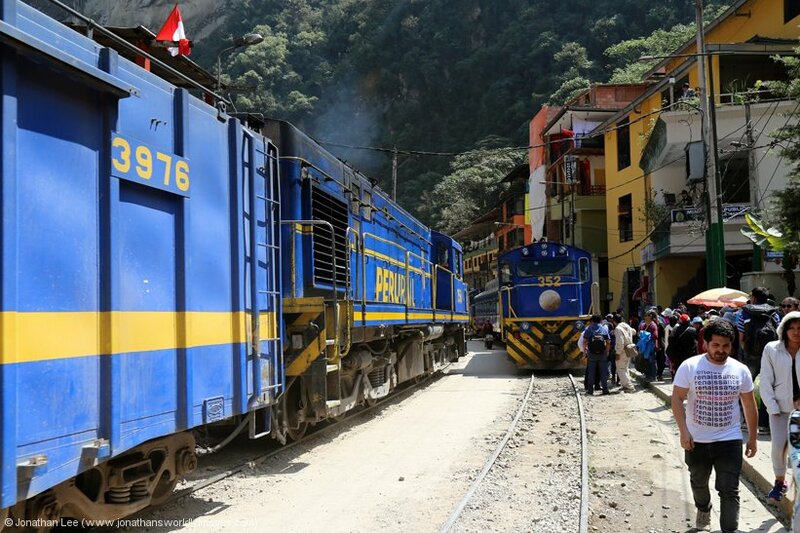 Despite queuing for Expedition 501 1330 Machu Picchu – Hidroelectrica at Machu Picchu station we were marched through the corner of the market and down the steps at the side of the station to our waiting train in the street. 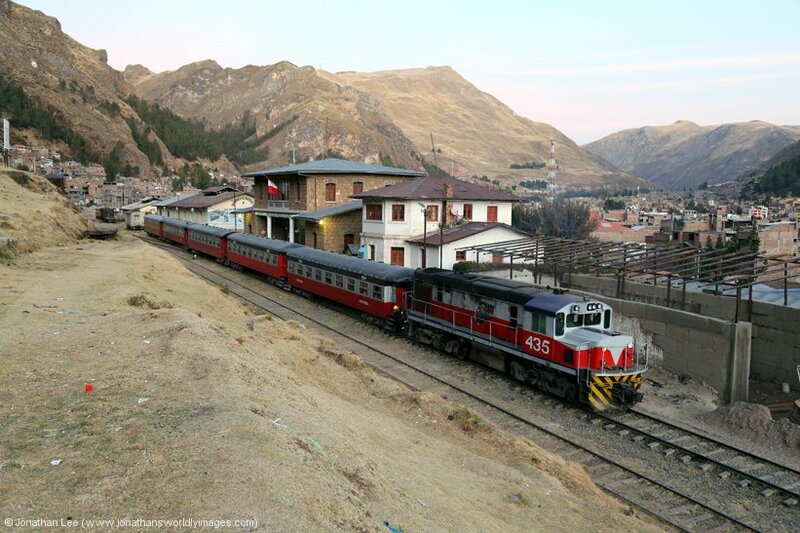 MLW DL535 #482 was sat with 4 Expedition coaches and 1 Local coach, which had arrived earlier with Vistadome 203 0825 Cusco Poroy – Machu Picchu, starting at Ollantaytambo because of the strike. 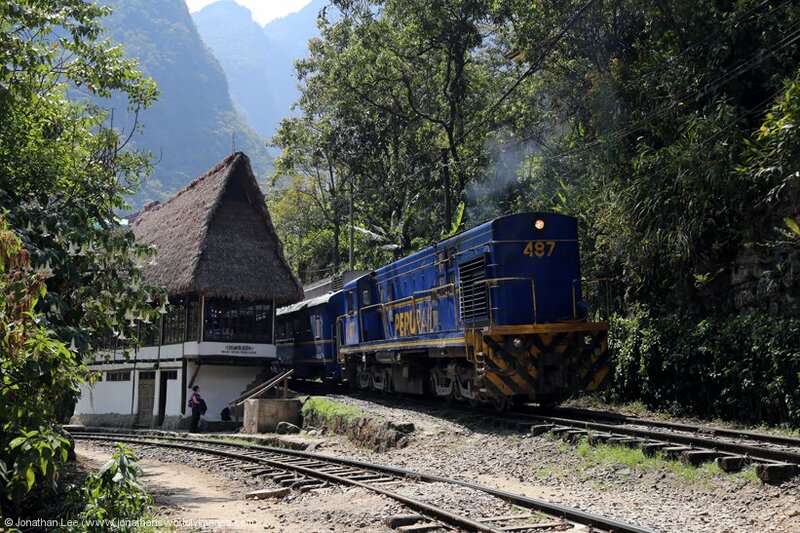 The journey to Hidroelectrica is only 11km by rail and is literally one from one side of the hill that Machu Picchu stands atop to the other; but taking the scenic route around the bottom. 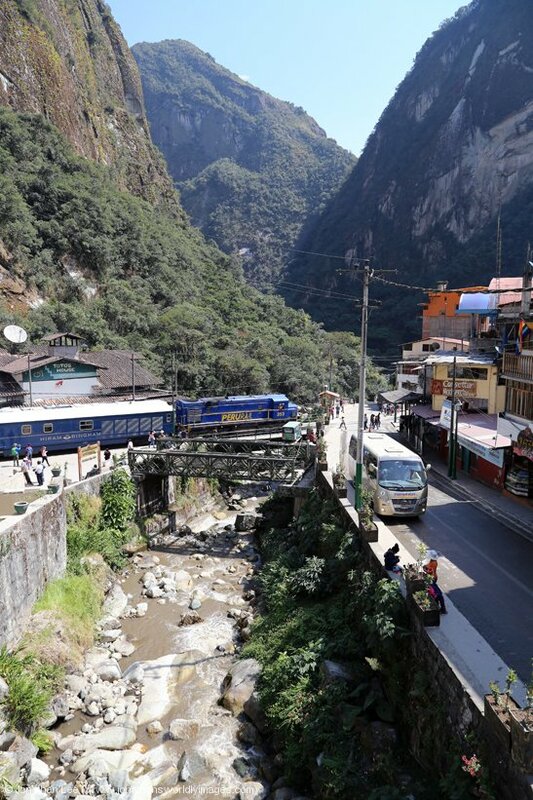 Loads of people use the train tracks to walk between Machu Picchu and Hidroelectrica and we passed loads en-route and almost hit a couple as we approached the zigzag to drop down into Hidroelectrica. 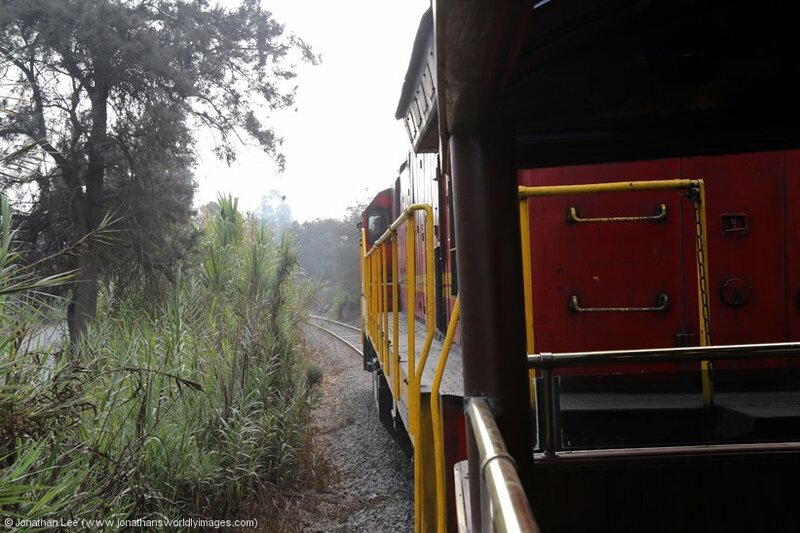 There are some good views of the back side of the Machu Picchu ruins if you keep your eyes peeled towards the top of the hill, on the left of the train on the way to Hidroelectrica and the right on the way back to Machu Picchu. 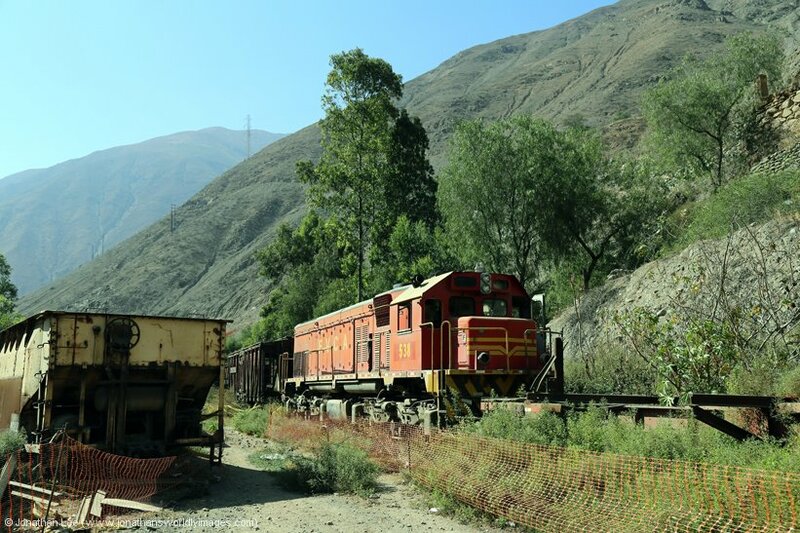 On the way to Hidroelectrica MLW #482 was removed and turned on the wye as we passed by it and upon arrival into Hidroelectrica Alco #358 was sat waiting to drop onto the opposite end of our stock to work back with Expedition 504 1450 Hidroelectrica – Ollantaytambo. 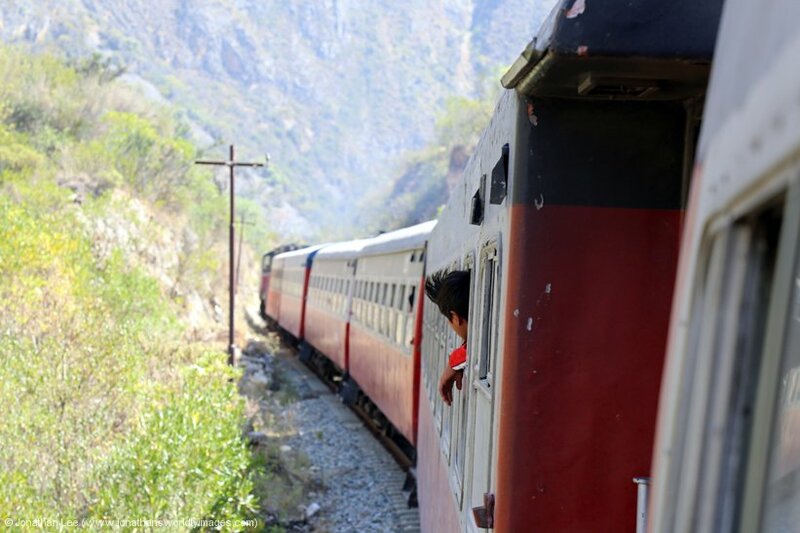 With only 20 minutes to get tickets before the return journey to Machu Picchu we’d attempted to tell the staff on the train that we’d be returning with them but that we had to get tickets before we did; this only sank in when we boarded the train again for the return journey. We’d been first at the ticket window when the train arrived and it took about 5 minutes to get our tickets issued due to the farce with personal details having to be added to the booking and passports being showed. There were other people turning up on spec behind us, all of whom made the train. The saving grace I guess is that there was another one 95 minutes behind it. 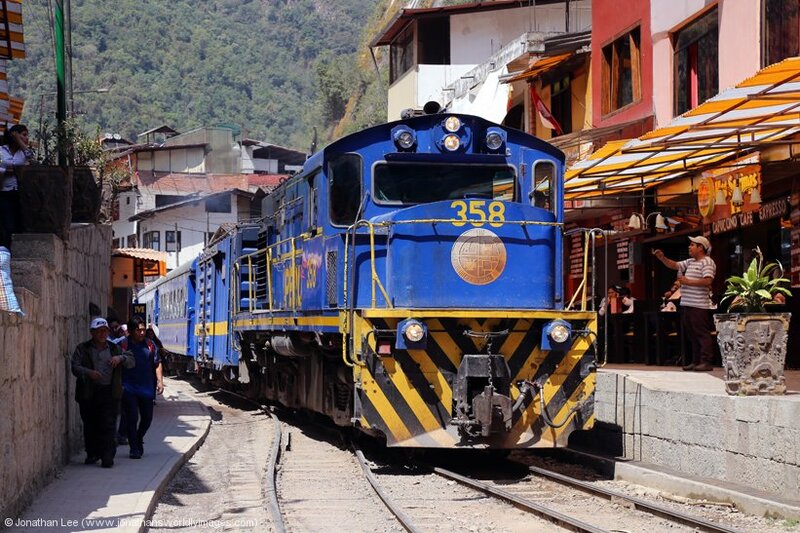 Train 504 is the only train that runs through Aguas Calientes and backs into the main Machu Picchu station and after #358 had backed us in I noticed GM G12 #510 in the station, which I’d assumed would have done Expedition 74 1455 Machu Picchu – Ollantaytambo but the absence of Alco DL535 #487 meant it must have done it instead. Whether due to late running or an issue with #510 I don’t know. 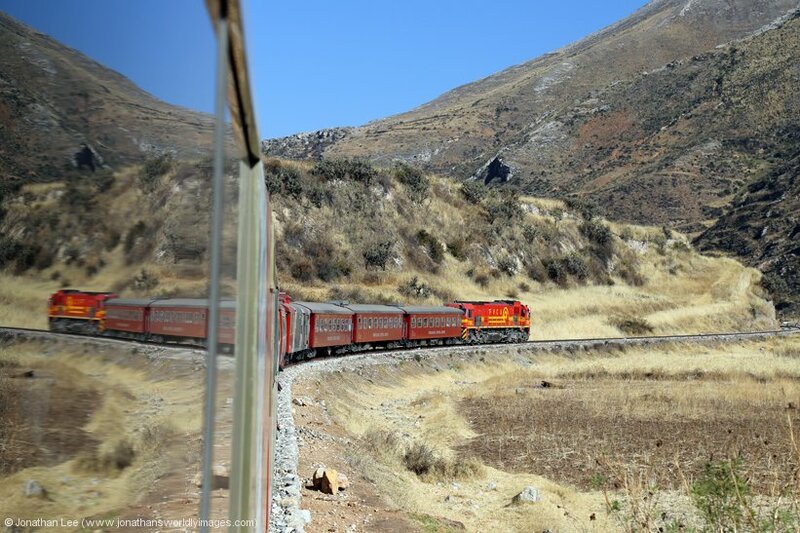 All was revealed on our way back to Ollantaytambo that evening when we passed the return working in the form of Expedition 75 1900 Ollantaytambo – Machu Picchu with a load 7 rake and Alco’s 356/487 in multi at the helm. 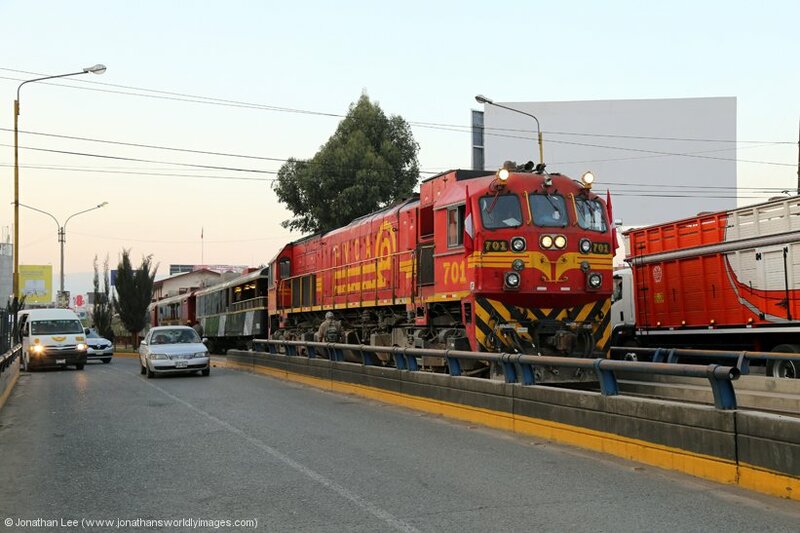 During dinner I nipped over the way several times to video Alco’s climbing into town with sets for the evening, including #352 with an empties, #353 with the empties for the Hiram Bingham and MLW #482 with Local Train 22 1635 Hidroelectrica – Ollantaytambo (vice San Pedro due to strike). DL532 #352 turned out to be taking the emptied into Machu Picchu to form our Expedition 84 1820 Machu Picchu – Ollantaytambo. It was on load 6 and we were at the rear of the front coach and had an opening droplight type sliding window by the side of us. 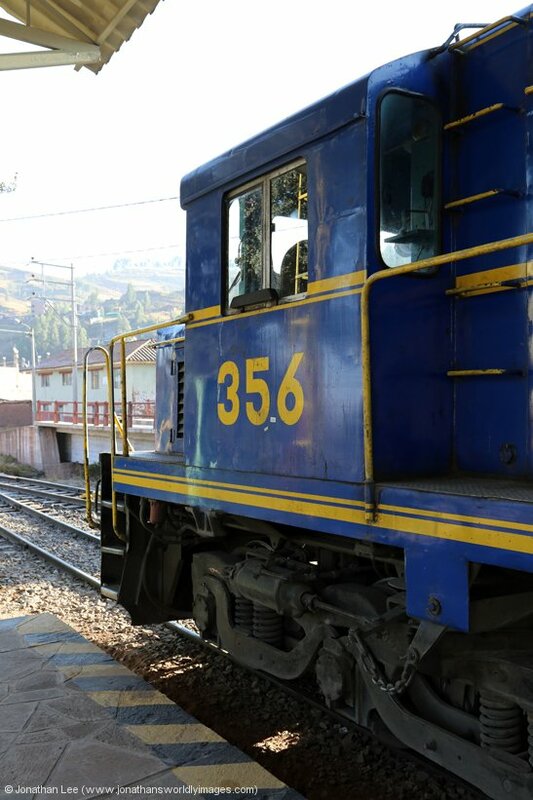 While #358 earlier might have been the thrash of the bash, #352 with train 84 certainly sounded the best; it was meaty, loud as hell but didn’t clag as well as #358 did and basically staggered the whole way back to Ollantaytambo. 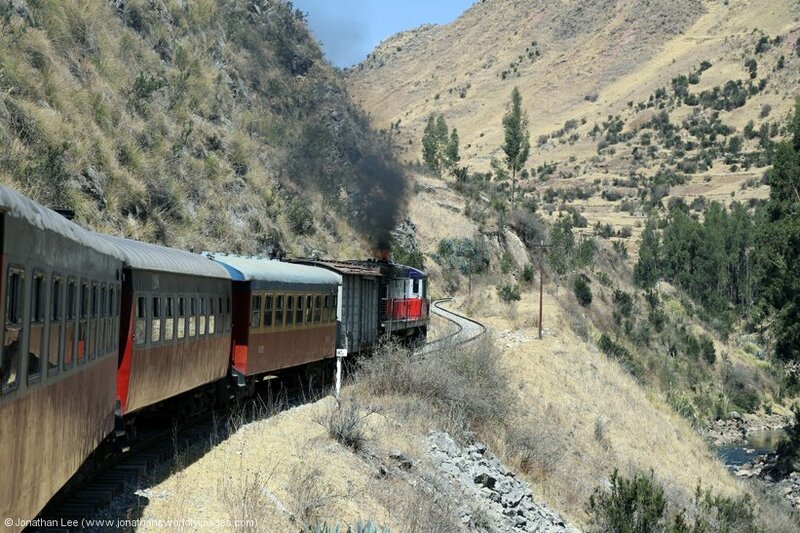 I spent quite a lot of time on the journey back to Ollantaytambo standing with my ear at the open widow, so much so that the French girl opposite asked me if I was ill as I seemed to be spending a lot of time getting fresh air! Arrival back into Ollantaytambo was just in time for our 2015 dinner reservation, which again we asked for a table in the café area by the window. The girl at reception that night was an American girl and as she spoke fluent English we voiced our concerns about the breakfast fiasco that morning, mainly as it utterly unfair on hotel paying guests, especially those that might have been woken by the hoards out at the back that morning. She sympathized with us and assured us she would have words with the hotel management as it was unacceptable. She asked us to e-mail the photos that had been taken that morning to prove just how full the breakfast room was and later that evening she came around to our table to tell us our meals were on the house that night! Now that was the kind of customer service one expects when they’ve been inconvenienced; take not Star Peru as they were, by this point, giving me issues that I didn’t need! As we didn’t need to be up early the following morning there was no rush to get to bed for a change and we watched Alco #358 depart with train 51 2100 Ollantaytambo – Machu Picchu before heading up for the night and making attempts to start packing for what was essentially the start of our journey home the following morning. Despite having an alarm set for 0900 we didn’t make it past 0715 due to the noise from the station area and music coming from somewhere below us. 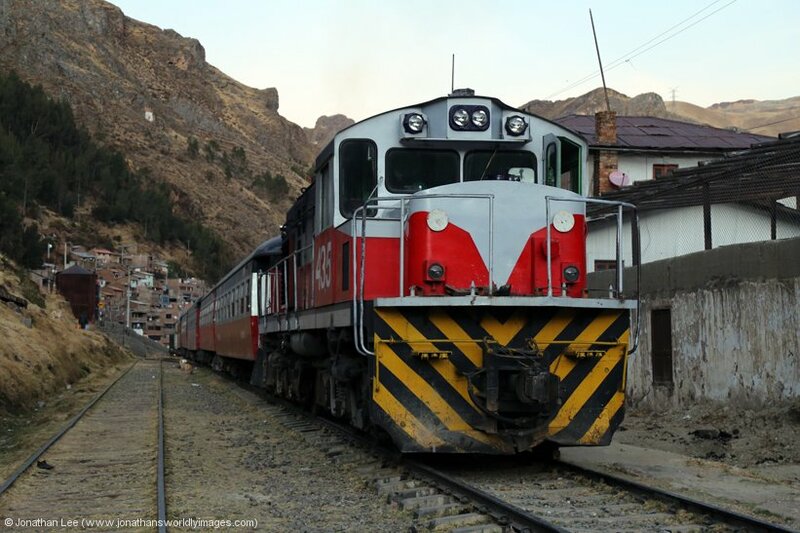 We were refreshed enough though and when the shutters were opened Alco DL532 #352 was sat outside with Train 83 0745 Ollantaytambo – Machu Picchu and DL532 #358 arrived with Train 50 0535 Machu Picchu – Ollantaytambo while I was in the shower. Breakfast in the restaurant was ok but not the best and the toast was stone cold but we couldn’t be bothered to complain. Our peaceful environment was almost invaded again but people were moved out back straight away. 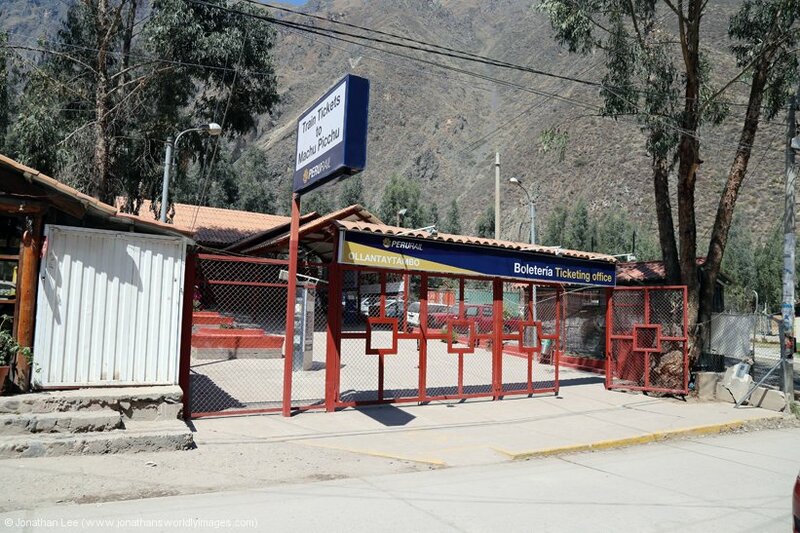 There were a lot more people passing through Ollantaytambo than usual due to the strike and the hotel was the obvious haven, despite the station area actually having a waiting area at the top end of the platform. 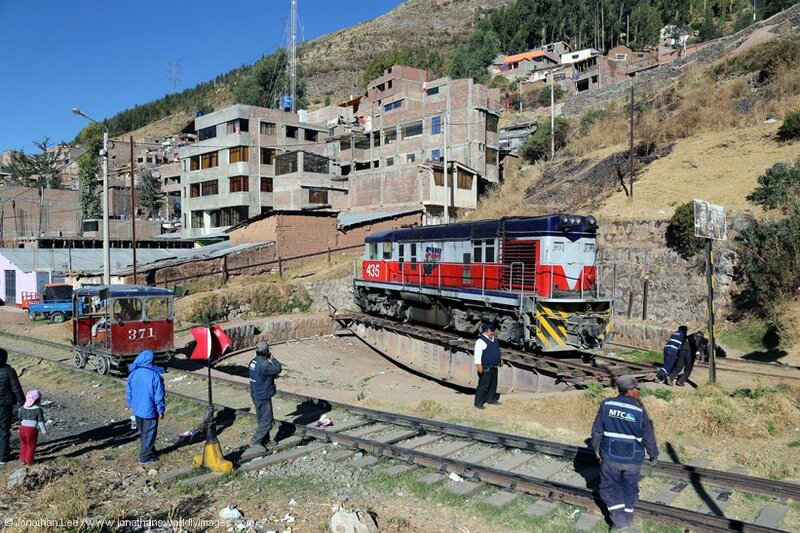 With everything starting at Ollantaytambo there was a precession of trains lined up outside the station that morning, all probably having been stabled at Pachar overnight due to the strike preventing trains running to/from Cusco? As it was a sunny morning it would have been rude not to get some photos of so many trains in a short space of time and first up was MLW #481 with Expedition 31 and what would have been 0640 Cusco Poroy – Machu Picchu then after that departed Alco #358 did a bit of shunting in the station yard and then reappeared after running towards Pachar, where I thought it would turn on the wye, multi’d with Alco #487 and a load 10 set of stock. 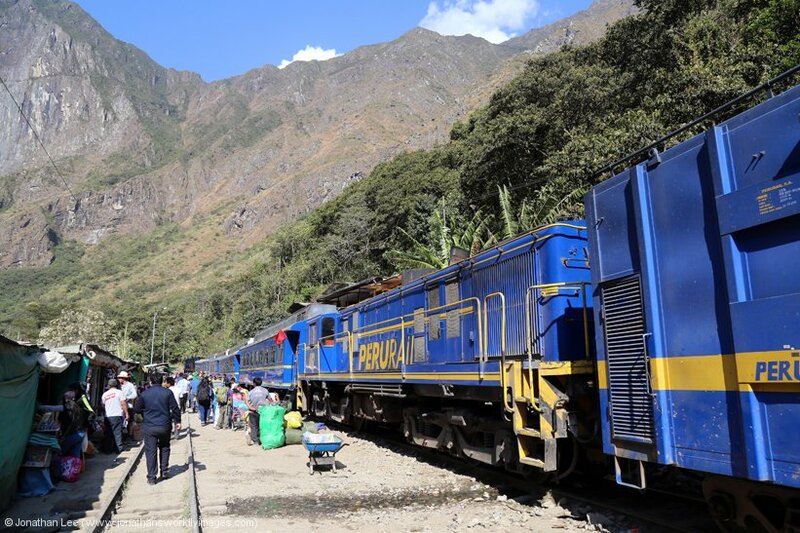 I figured out that this was actually two trains combined; what would have been Expedition 33 0735 Cusco Poroy – Machu Picchu and Expedition 501 0853 Ollantaytambo – Machu Picchu. Quite why they needed to be combined I couldn’t work out, and the only solution I could think of was that the Cusco set was actually a load 7 set and needed a pair of Alco’s anyway so that left nothing to work one of the trains so they just put them together? 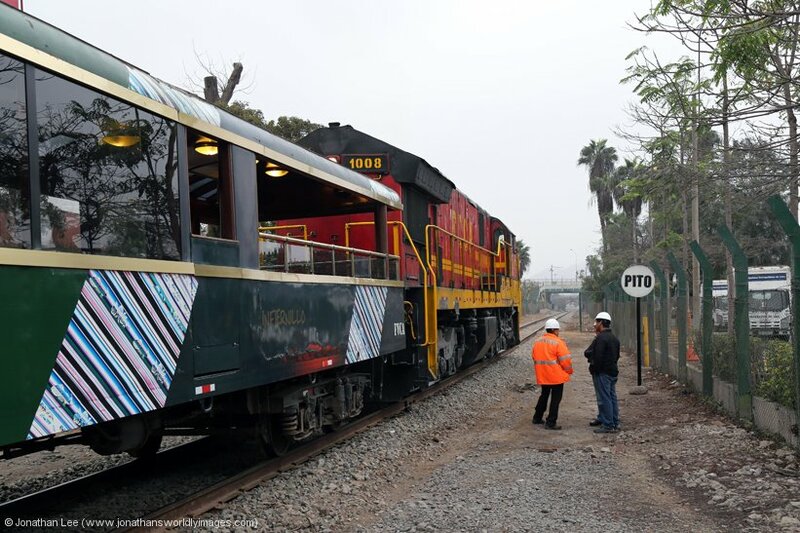 Either way after they went MLW #482 brought the stock in to work Local Train 21 what would have been the 0700 Cusco San Pedro – Hidroelectrica and no sooner had that gone did MLW #400 bring the set in for Vistadome 203 what would have been the 0825 Cusco Poroy – Machu Picchu. 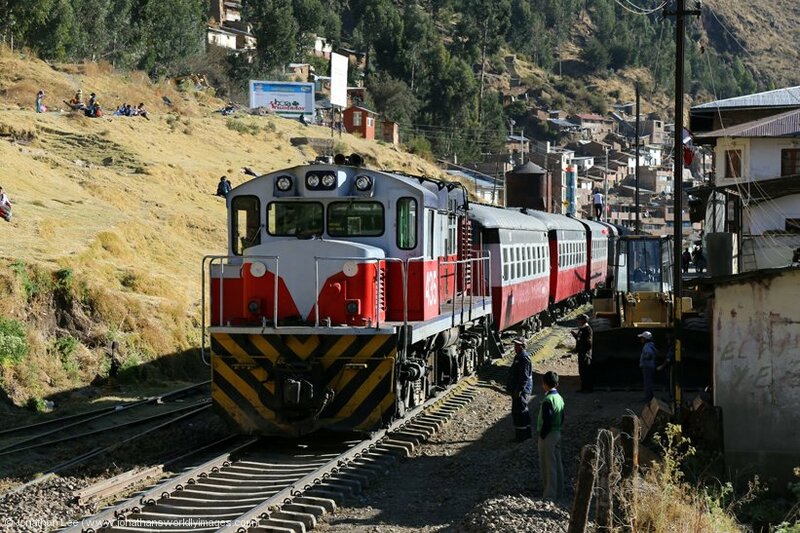 Next, and final, to depart was Alco #353 with the Hiram Bingham Train 11 what would have been the 0905 Cusco Poroy – Machu Picchu but that couldn’t go until GM G12 #510 arrived with Train 72 0754 Hidroelectrica – Ollantaytambo; which would unfortunately be our engine to Machu Picchu later in the day! 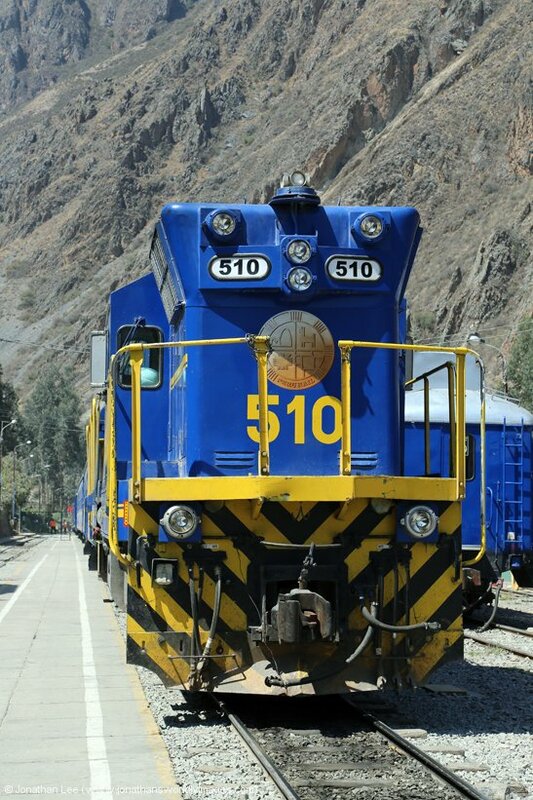 There was nearly an incident when 510 arrived as the cretin security guard at Ollantaytambo station had shouted me back, from my standing point outside the station confines, and began to shut the gates just as 510 appeared in the distance. Thankfully someone with some sense pointed out the error of his ways and after 353 had departed I nipped back in before he had chance to shut me out. As checkout was at 11am we ended up leaving the bags with the hotel while to took a leisurely stroll to Ollantaytambo old town to pass the time. 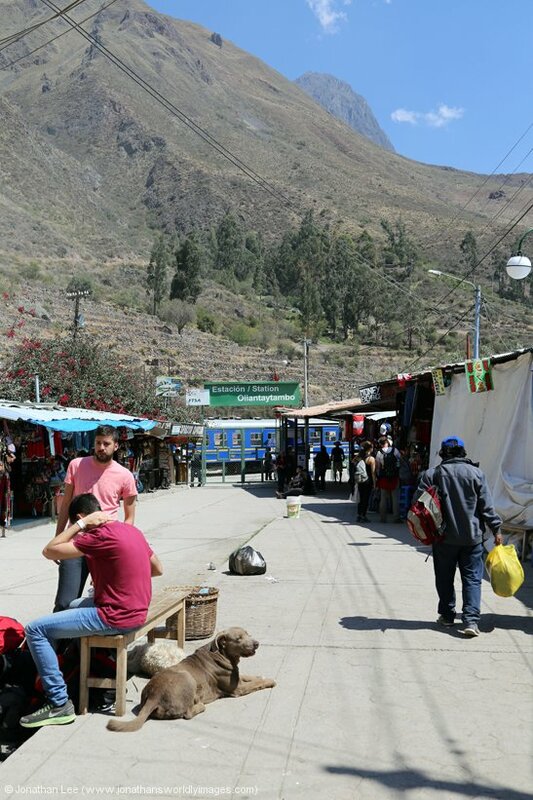 The market area outside the Ollantaytambo ruins was virtually deserted and hardly any of the stalls had been set up at all. The ruins were quite well frequented though. Unfortunately, we didn’t have time to go inside so returned to the hotel and collected our bags. 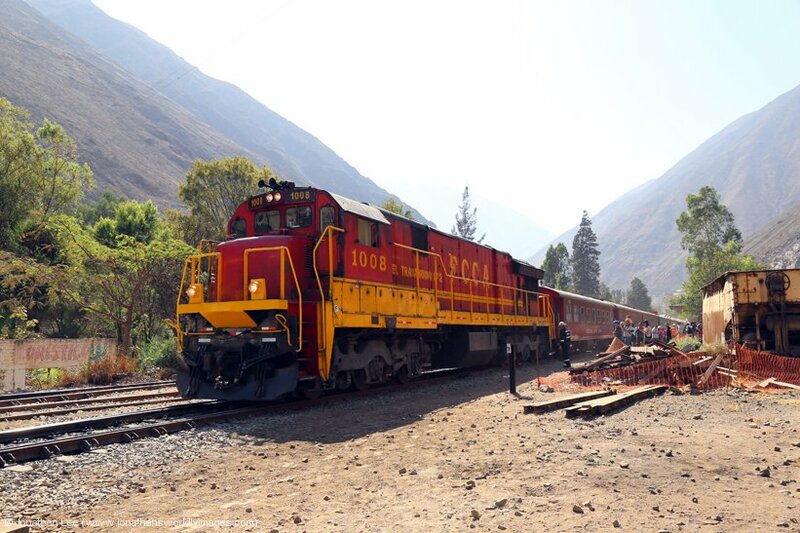 GM #510 was just running round its set in the station to form Expedition 73 1258 Ollantaytambo – Machu Picchu with a load 7 rake! 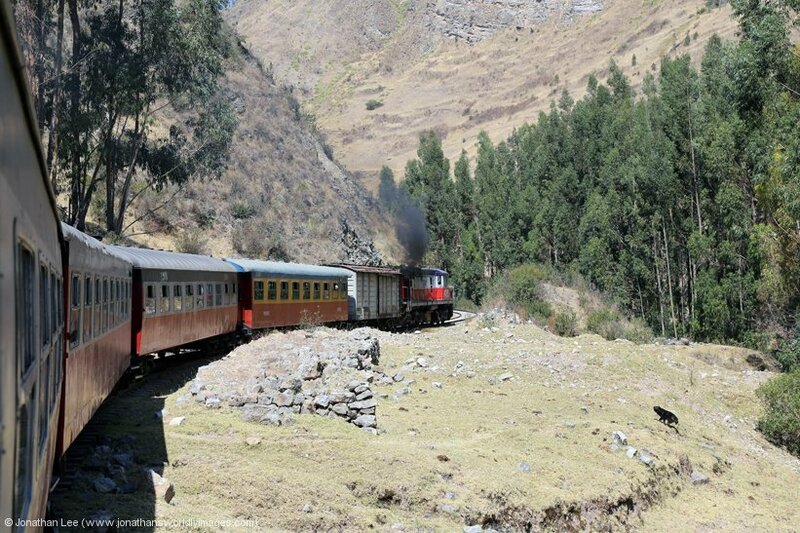 It was downhill to Machu Picchu so maybe it was acceptable going downhill with load 7 and one engine? It clearly was in this instance. A Couple of excellent homemade cookies from the El Albergue café accompanied us on our journey and it was only when buying them that I realised the café actually had two beers on tap! Doh! 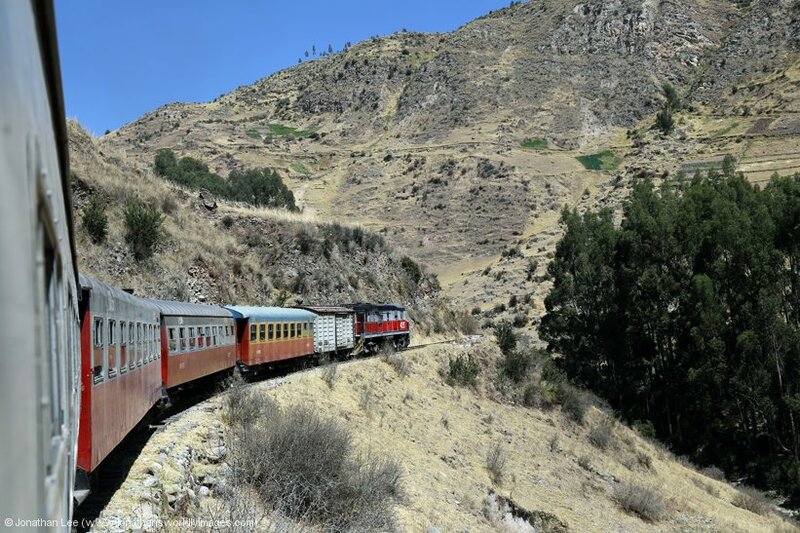 With the last dregs of WiFi at Ollantaytambo, before we departed, I had an e-mail come through from Star Peru offering us an option to change our flights at no cost. This due to the fact they’d retimed our Cusco – Lima flight later the following day which only gave 2h05m from one flight to our flight home that evening in Lima. While the new flight at 1240 would completely destroy our day in Cusco, a bit like the day Star Peru had destroyed when our outbound flight to Cusco had been over 3 hours late, it seemed sensible to make the flight change and take away the headache that could come and of course the anxiety that would be with us most of the following day. So after GM #510 deposited us in the street at Aguas Calientes we walked straight down to Toto’s House for lunch and used their WiFi to reply to Star Peru and by the time lunch was done we had a reply confirming our flight change and were advised to check in for it as soon as possible as we’d already checked in for our original flight. And all this hassle as Star Peru wouldn’t allow our bags on as hand luggage despite them being within size and weight for other airlines in Peru! 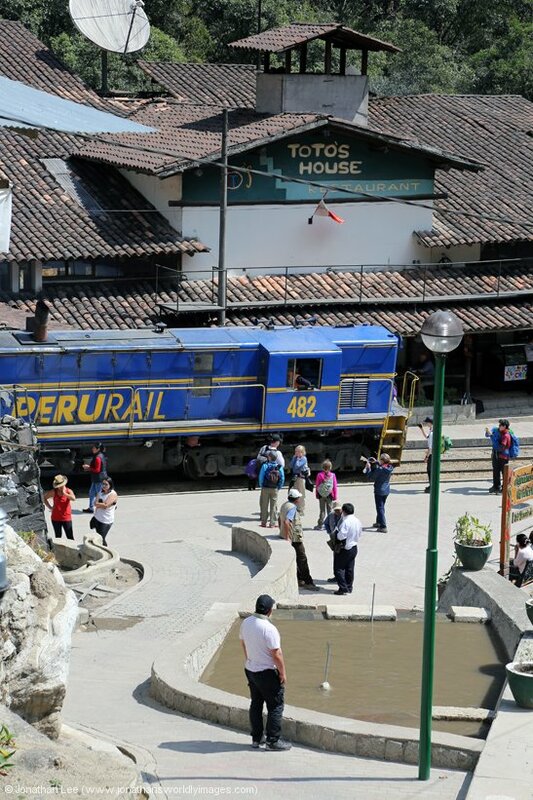 Down the street from Toto’s House by the Aguas Calientes station Alco’s 356 & 356/487 were stabled up and MLW #481 had taken the stock off Train 73 into the main Machu Picchu station. 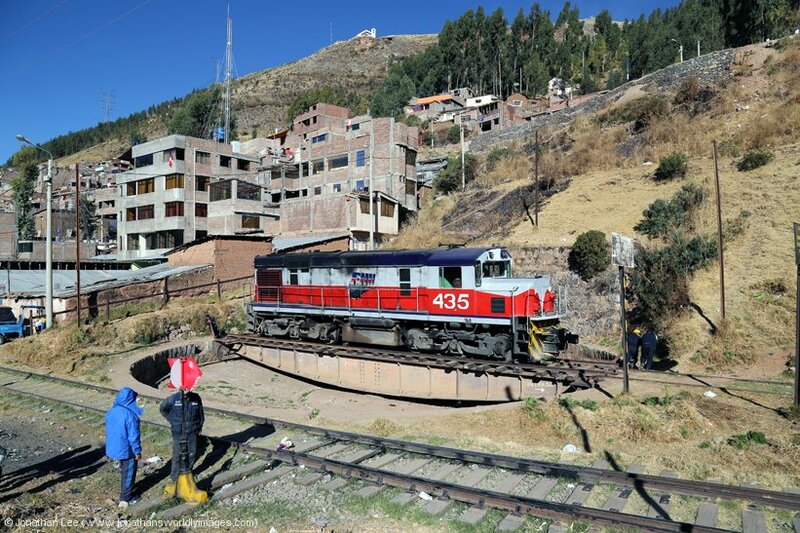 GM #510 was soon back from the wye to work Train 74 1455 Machu Picchu – Ollantaytambo and before we knew it MLW #482 was soon passing through the streets with Expedition 504 1450 Hidroelectrica – Ollantaytambo. 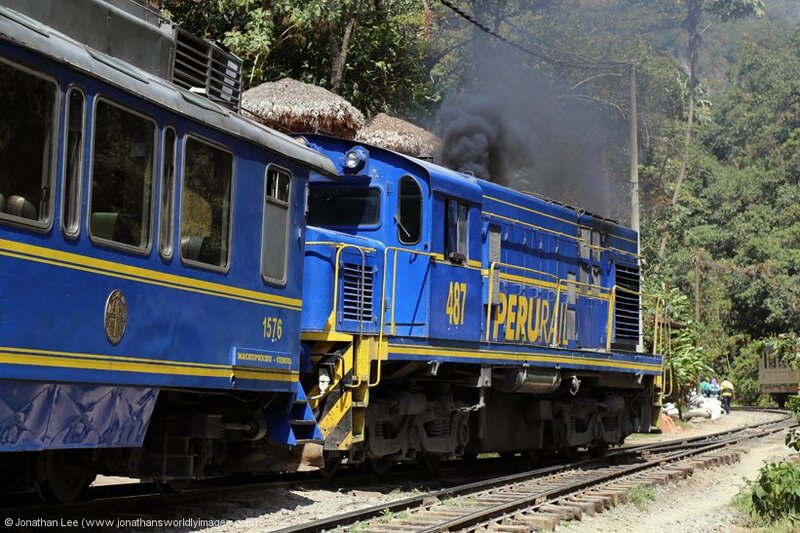 What I’d been hoping for soon happened and Alco’s 358/487 in multi took the empties up to Machu Picchu for our Expedition 34 1643 Machu Picchu – Cusco Poroy and were then stood aside while Alco #352 did a bit of shunting as they fouled the point work with load 7 when attached to the train. We were in the front coach for the run back to Cusco and a last minute seat swap for us, my own fault entirely, resulted in us being sat in a bay with a bloody window that wouldn’t open! Thankfully the fact that the coach attendant couldn’t get the air-conditioning setting right resulted in all the widows in the coach being opened for most of the journey. The clown in the bay at the side of us even managed to stupidly open the emergency window, as it was quite hot, which opens up the whole window outwards; that could have had disastrous consequences but thankfully didn’t. 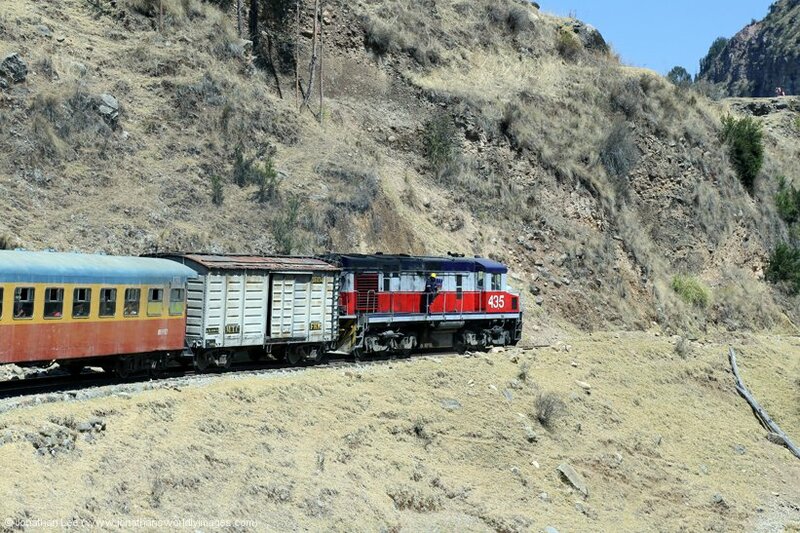 The extra loco and coach, compared to the previous night’s run, made all the difference and we were early at Ollantaytambo and thankfully early into Cusco Poroy as well. 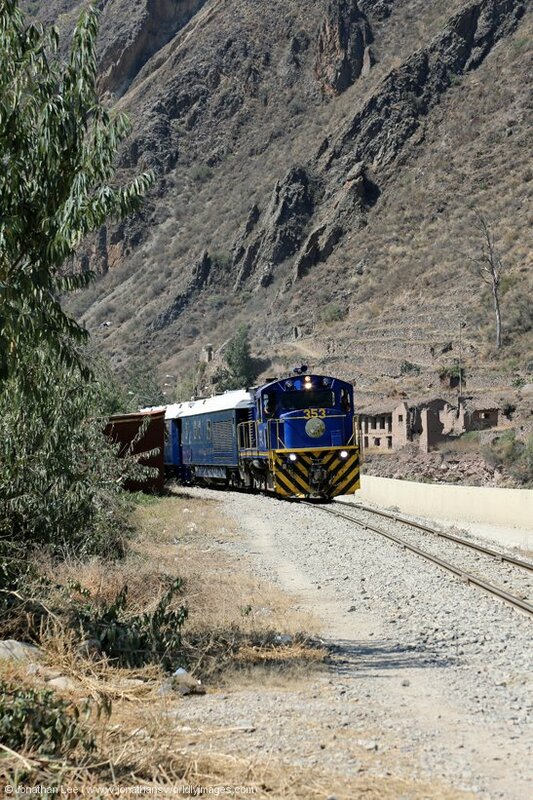 It had been a lot better run with a single one and load 6 though, for the entertainment value, the previous night but we were glad to be back at Cusco early; and let’s face it at all as the strike had buggered up a lot of people’s travel during the previous 2 days. Despite having arranged a taxi transfer back to the hotel there was nobody displaying our name or the hotel’s logo, which is exactly what had happened to us on our previous visit as well; with a different hotel. We soon got ourselves a taxi though and paid exactly what we were going to anyway, 30 Soles, for the journey back to the front door of the Tierra Viva Centro. We were given a different room this time, right at the front by the main road. It was a two tier room with a mezzanine upstairs. It was definitely bigger than the room we’d had previous but equally as well presented and we wasted no time in dumping the bags and heading straight to Don Marcello for something to eat, where despite it being quite late in the evening it was still busy. 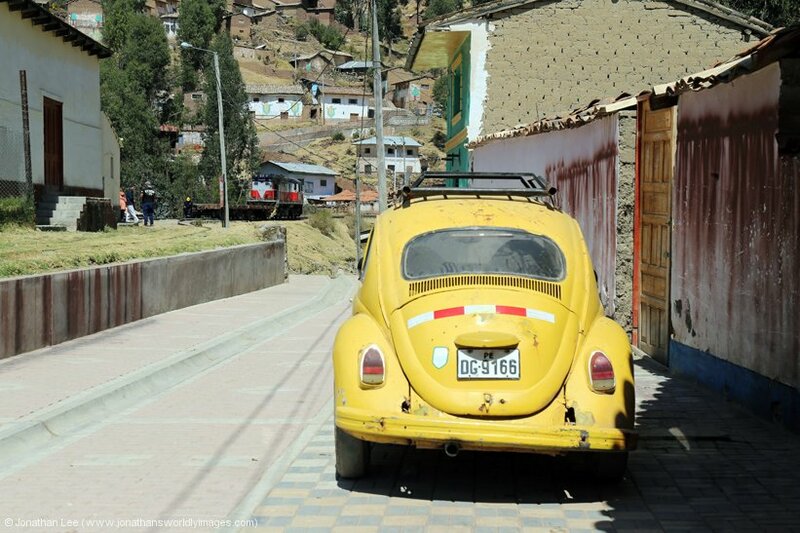 That’s was almost it, holiday over but for a couple of hours to kill the following morning in Cusco……. As our time in Cusco was limited we made the effort to get up, do breakfast, pack and book a taxi for 1015 to take us to the airport. This left us two hours to walk to the Santo Domingo Convent, inside which are the ruins of Qorikancha. The site was essentially destroyed when the Spanish invaded but some of the Inca buildings were incorporated into the Spanish building that went up on the site. The entrance fee is 15 Soles and the site is well looked after. There are constant tour groups walking around but these can be well avoided as they’re soon moved on by their guides. Some of the buildings that remain inside Qorikancha are a testament to just how well the Inca’s built things, especially with the size of the material they were using. While there isn’t a massive amount to see inside the convent its still worth a trip in to walk around. After our brief morning jaunt, we were in going home mode and the taxi to the airport had us there in no time. 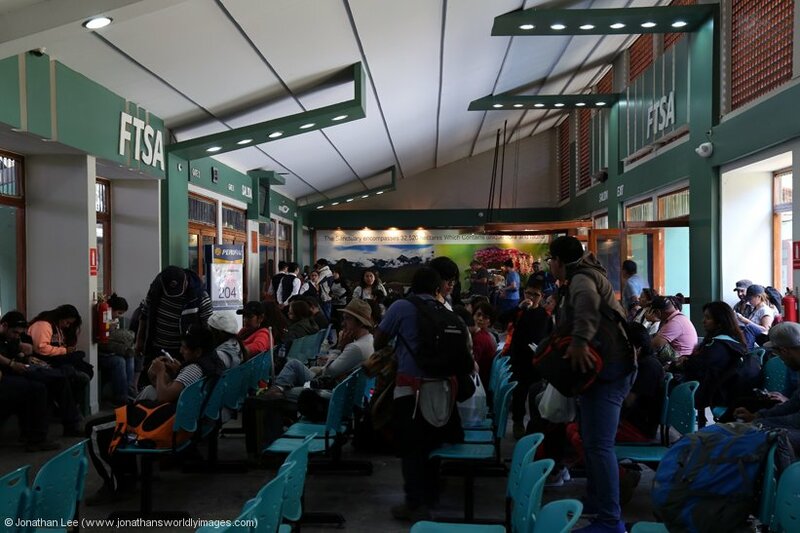 Our bags were soon checked in and we found ourselves waiting with the masses inside the small waiting area airside at Cusco airport. The whole place seemed to be organized chaos and even the staff didn’t know what gate our plane would be departing from as the one it should be going from was occupied by another flight. Eventually we got a gate, at which other people were queuing as that was the gate their plane should have gone from. As every plane using the airport seemed to be late everything had to be shuffled to make way for the next and it just spiraled. We were thankful that we’d made the flight swap when we took off an hour late but Star Peru would ultimately have the last laugh when our British Airways flight was over an hour late taking off than night as the crew were delayed getting to Lima airport as the traffic was that bad! You just can’t win…. The downside of the flight change was the 5 hours we ended up with at Lima airport and try as we might to get someone to issue us with boarding cards for our BA flight we just couldn’t get them and had to wait it out in the food hall; where we basically pigged out on a family pizza meal deal while we waited. For some reason, even though I’d checked us in, we couldn’t print boarding cards or get a boarding card through the BA app. Once airside though we spent all our remaining money on tat and even bought some souvenirs while we waited for the crew to turn up. Once on board we at least had half decent seats and while the guy sat by the window was a decent enough chap he did talk a lot and was a complete health freak. Luckily I was tired and the eye mask was soon in use. We landed late but still had enough time to make the last train we needed to be on to make our booked 1703 train home from Kings Cross, Southern Trains had other ideas on that though and the train service through Gatwick seemed to be in meltdown so with ticket restrictions lifted we ended up on the empty 1545 Gatwick Express to Victoria for the Victoria line to Kings Cross where I was so pleased to find 43312/43367 sat waiting for us on the 1703 Kings Cross – Leeds; the joys! Still it got us to Doncaster almost on time so I can’t complain too much; can I………?